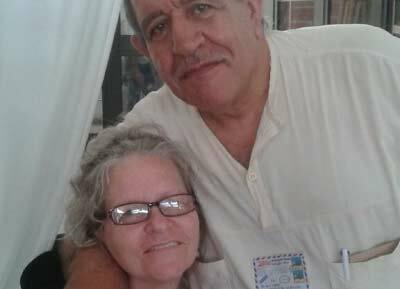 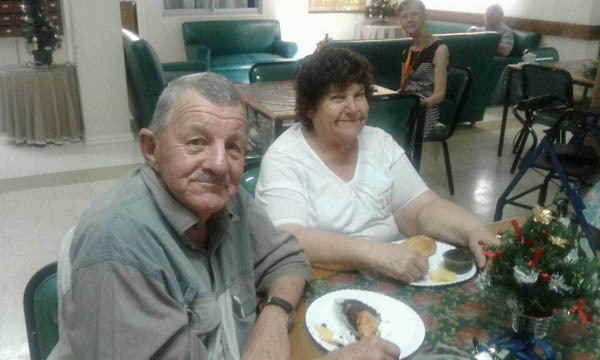 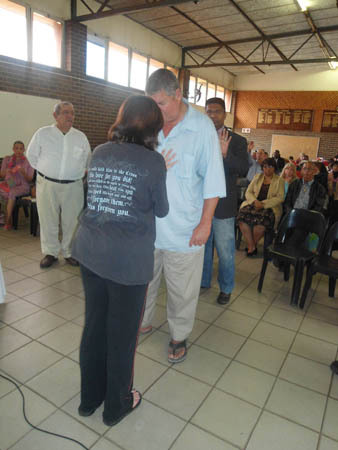 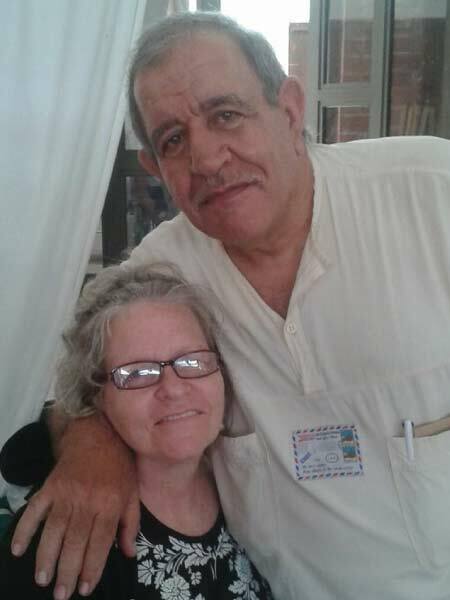 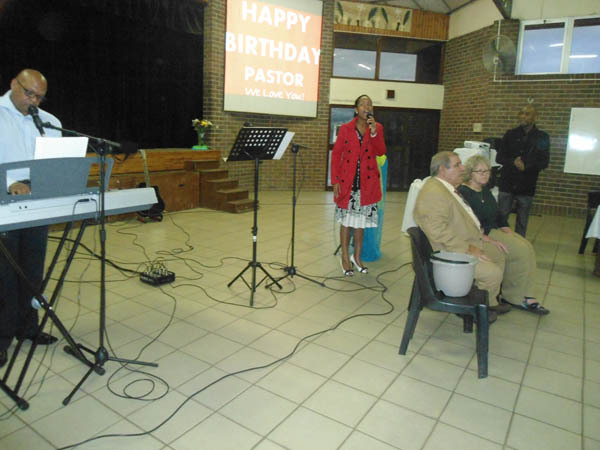 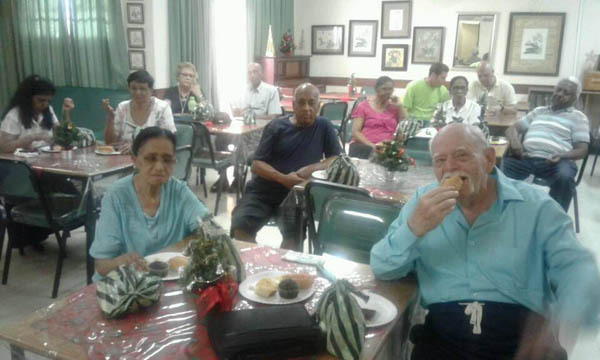 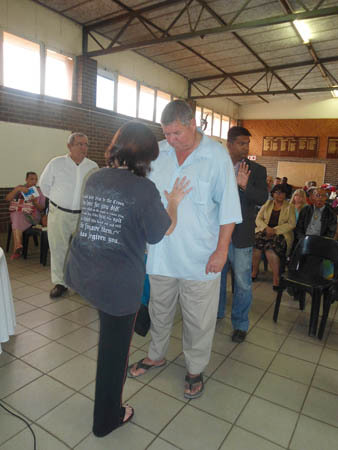 Pastor Aimilios Vicatos is the Senior Pastor assisted by his wife, Pastor Cathy. 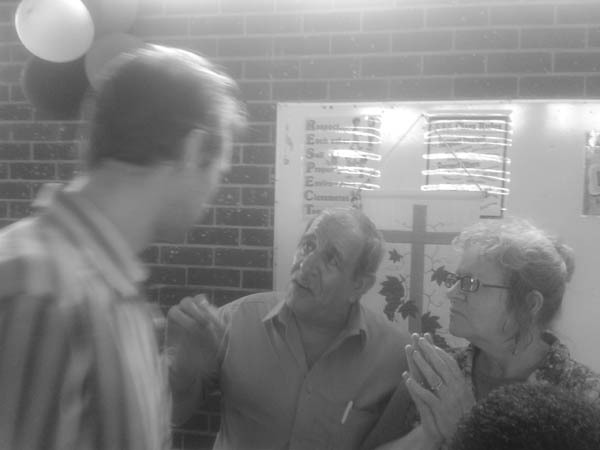 Pastor Aimilios was ordained 23 March 1993 Pastor Ian Mac Keeler, his wife prophesied that they saw him dancing by himself like Zorba the Greek – the dance started off slowly with only him dancing, slowly more people came and joined in dancing until eventually the whole dance floor was full of people dancing with you as you leading them. 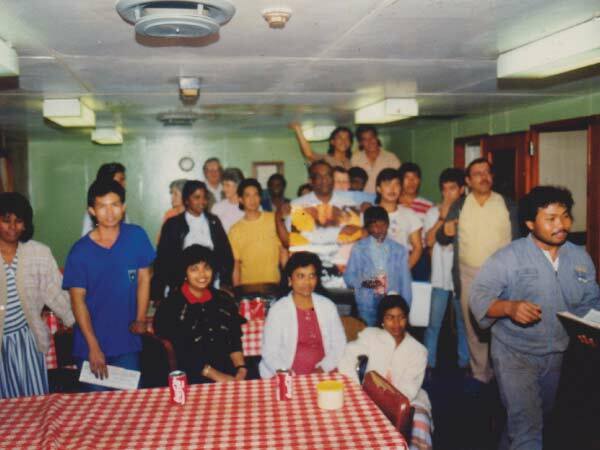 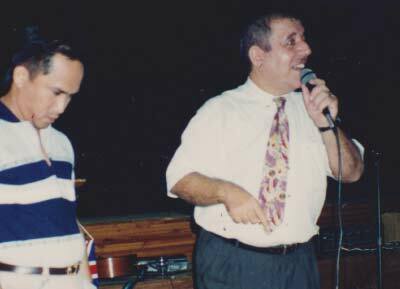 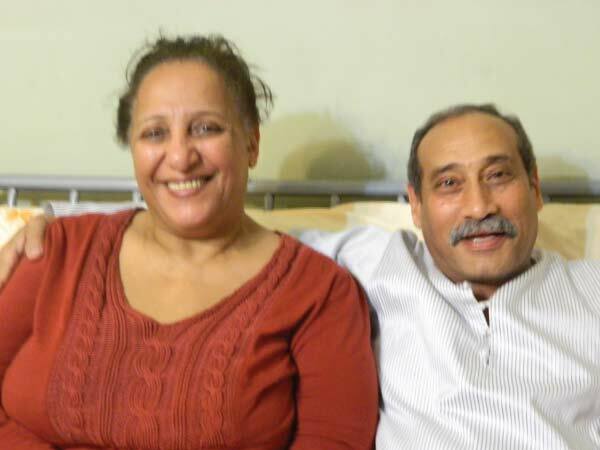 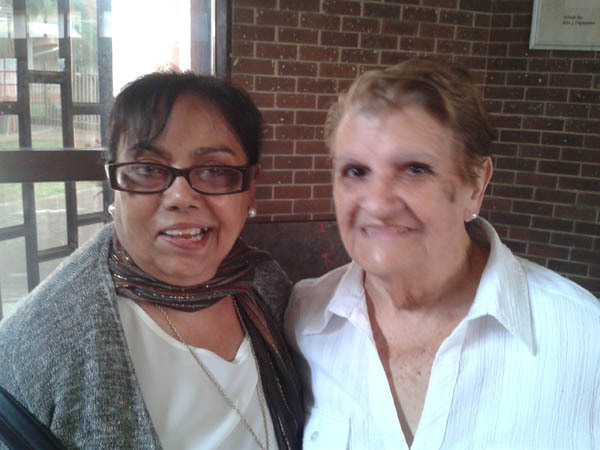 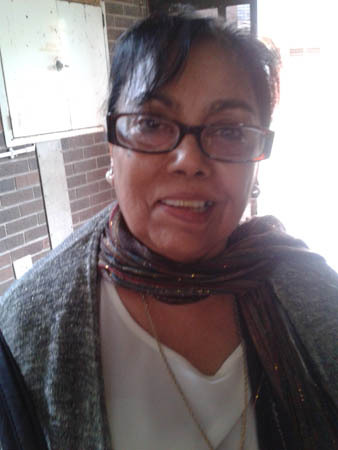 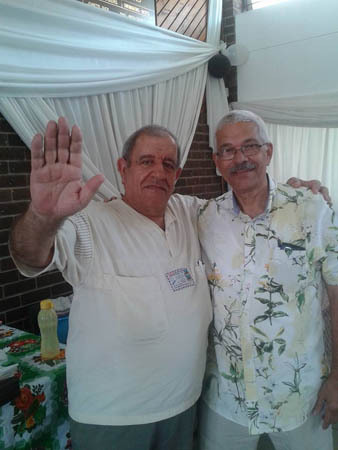 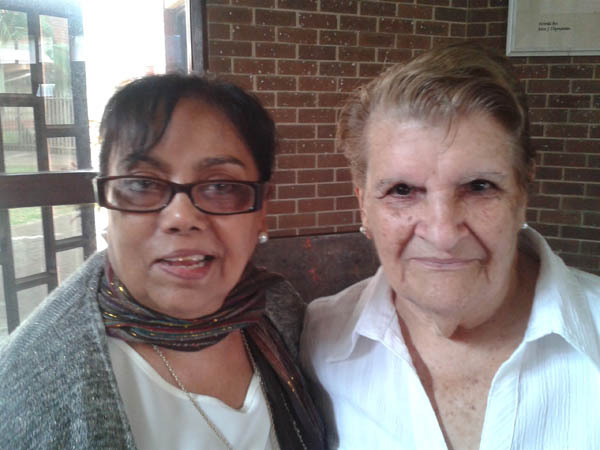 When visiting family in Long Island, New York, USA twice during July 1996 and July 1999, Pastor Aimilios was offered a Restaurant by his cousin. 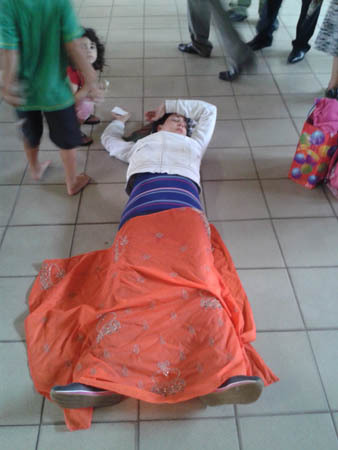 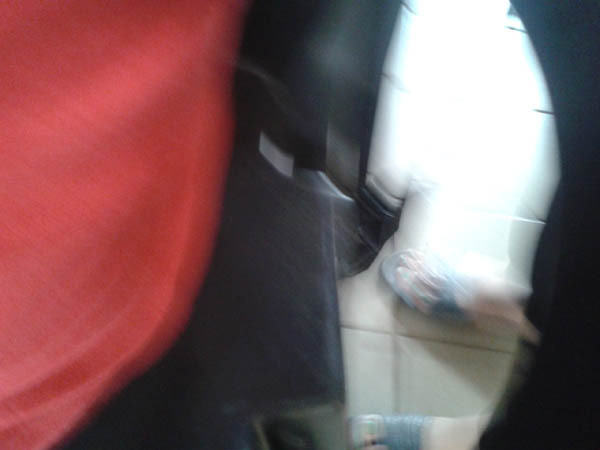 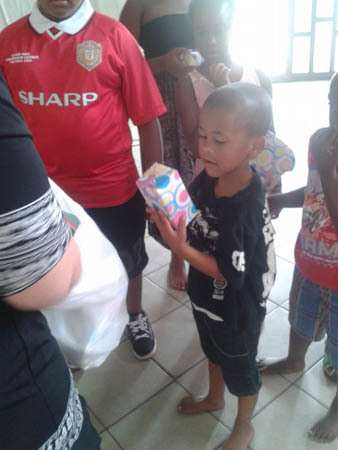 His brother offered him and his family accommodation. 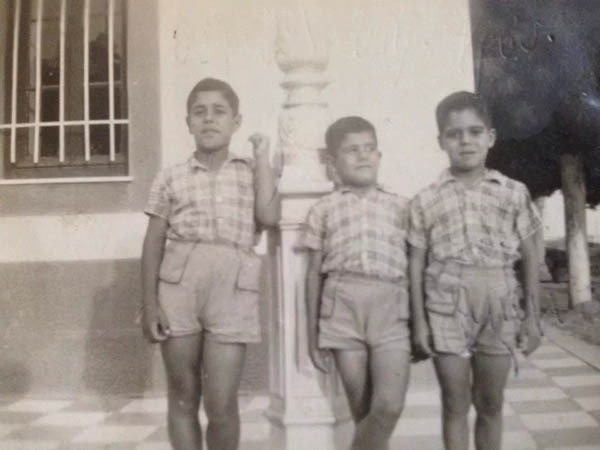 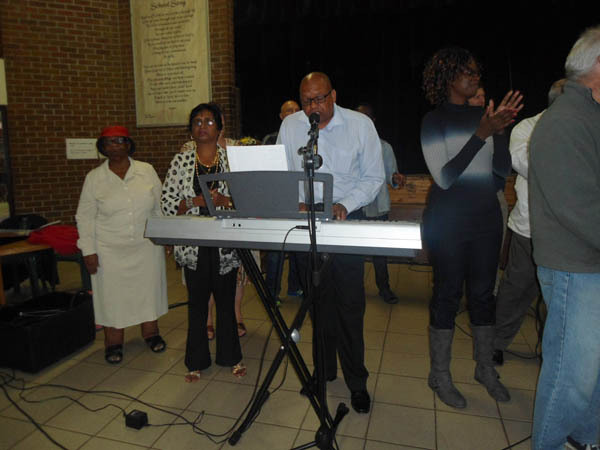 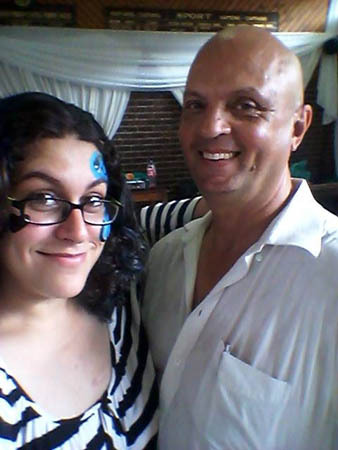 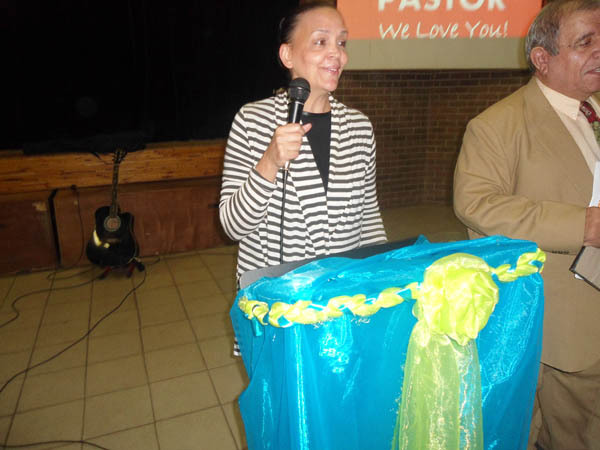 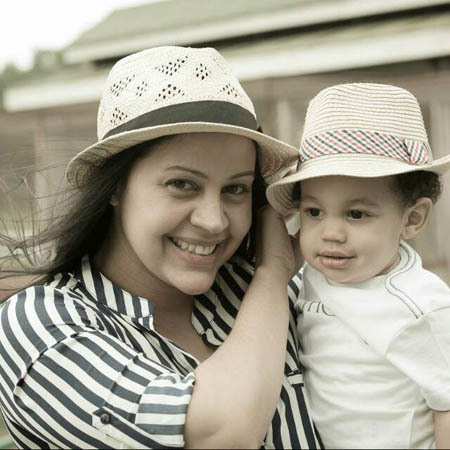 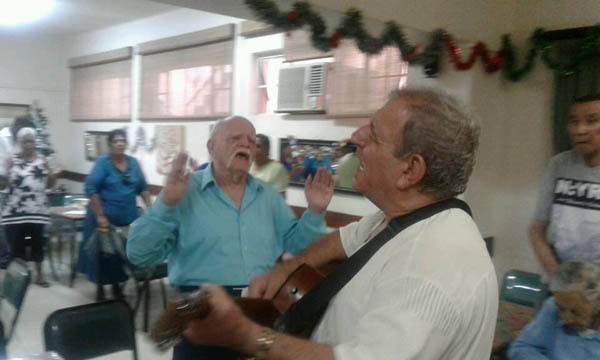 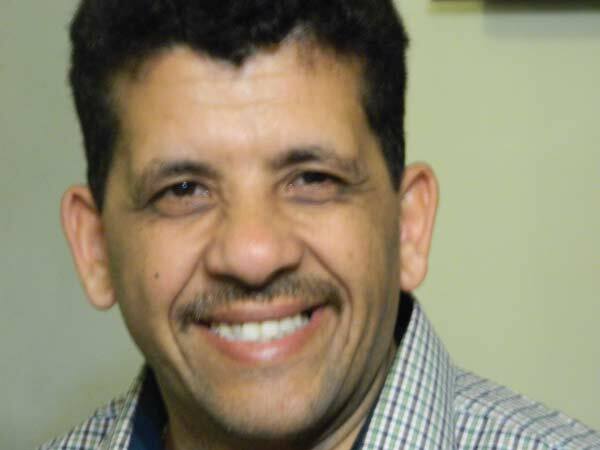 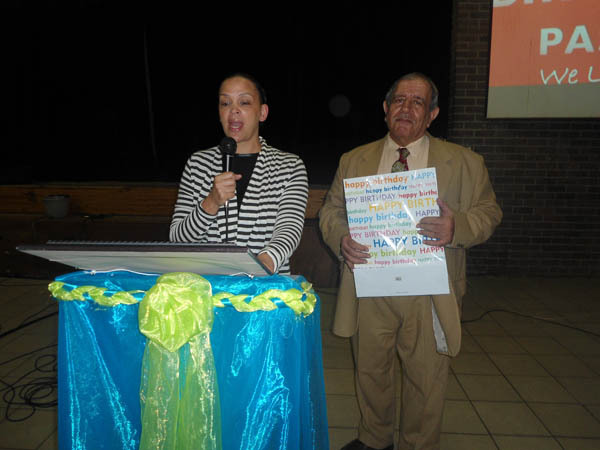 The Pastor for the BA Greek Church which had a church in Linden NJ; Astoria and Brooklyn in New York offered him the opportunity to choose one of the 3 Churches to Pastor. 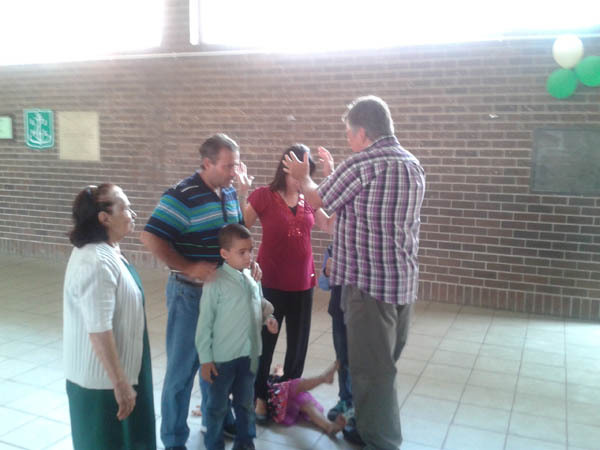 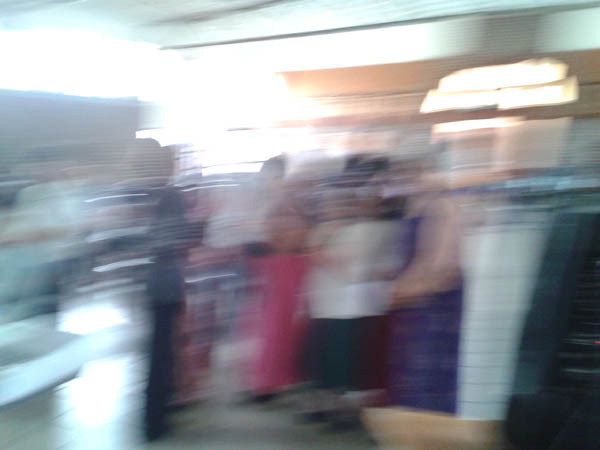 Pastor Aimilios, his wife and two children were very excited. 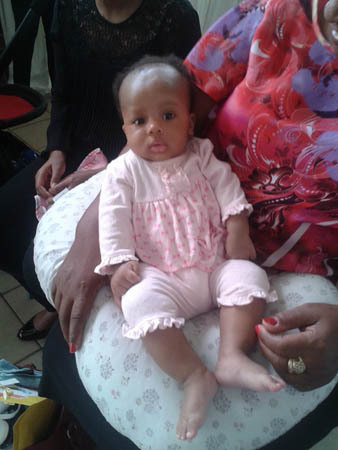 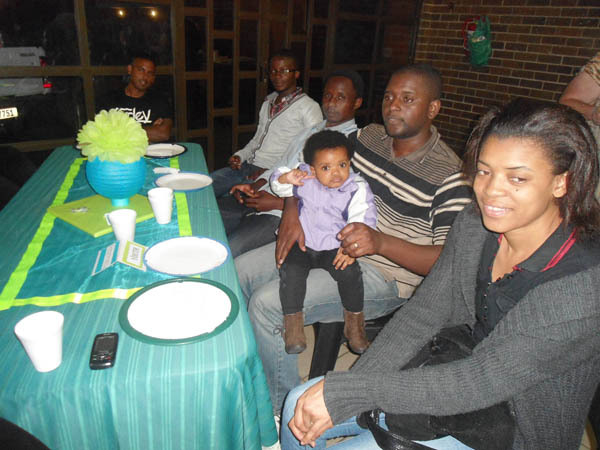 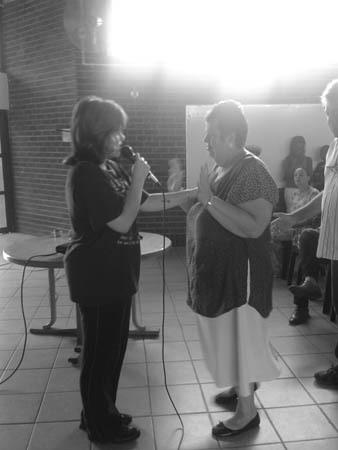 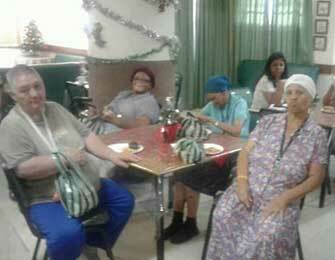 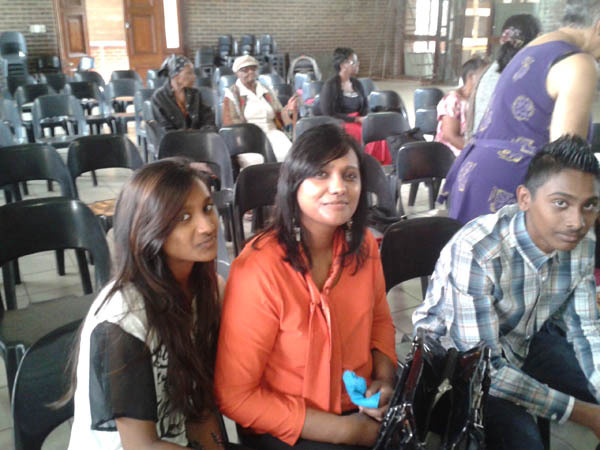 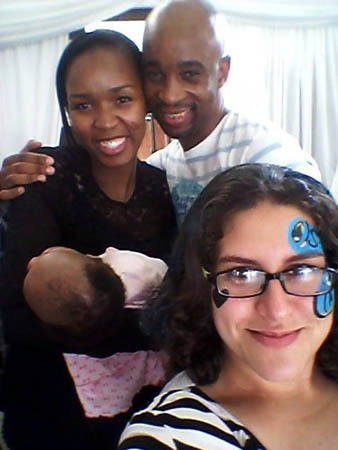 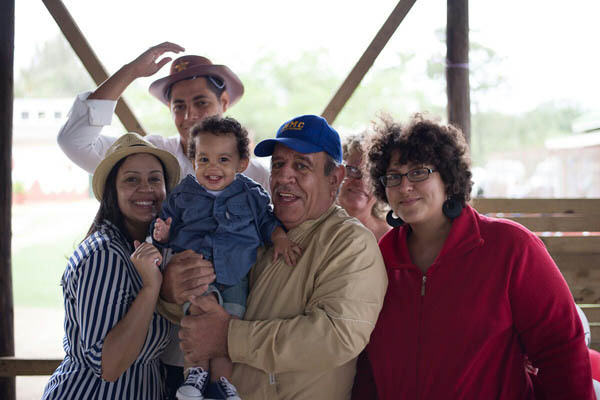 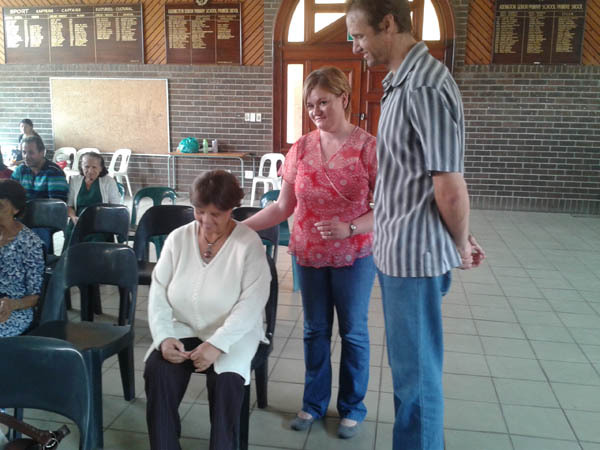 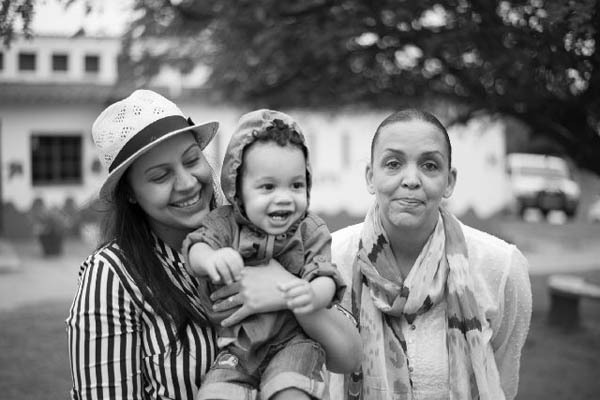 It was a wonderful opportunity for the whole family and was considered to be God’s will to bless them. 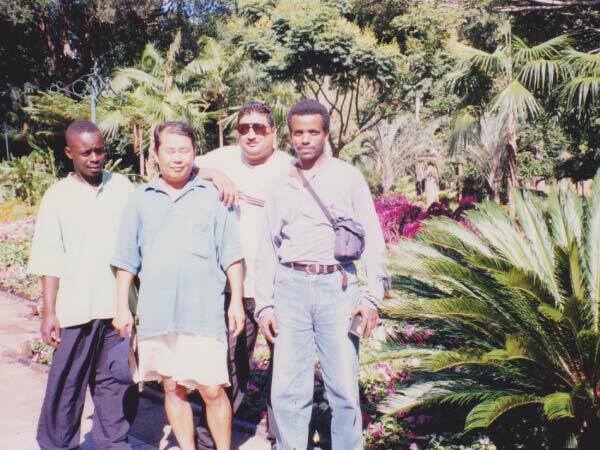 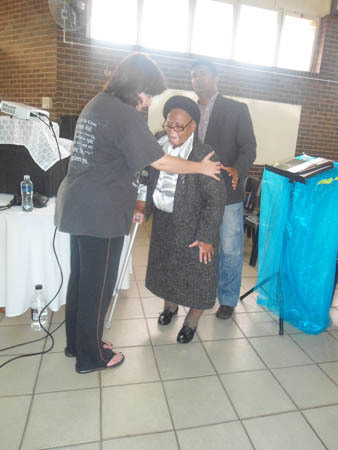 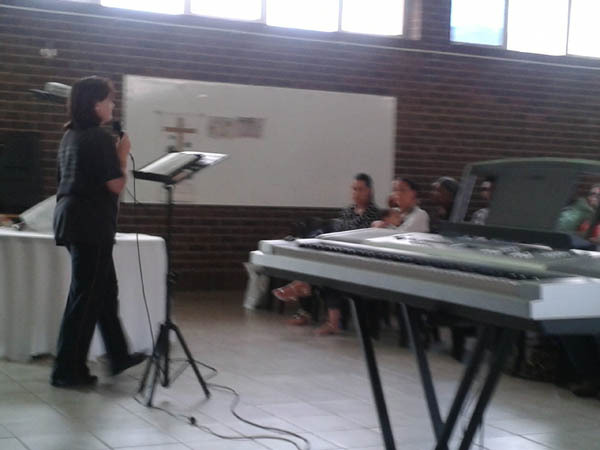 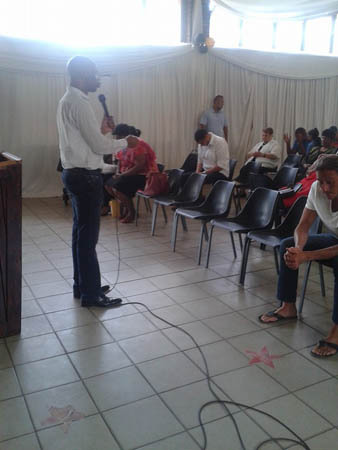 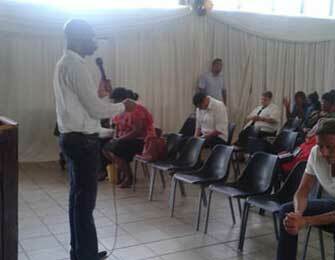 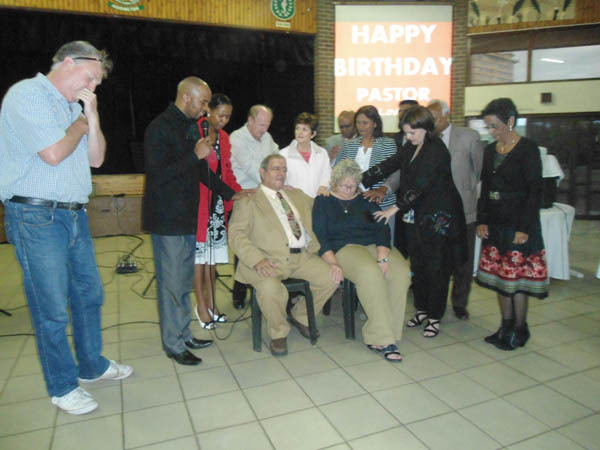 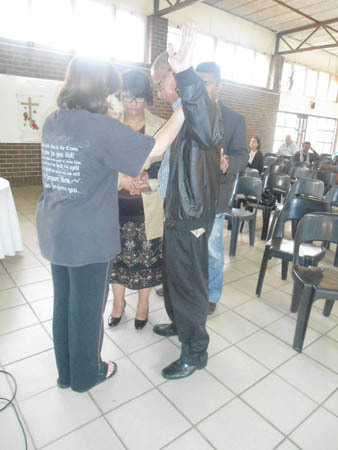 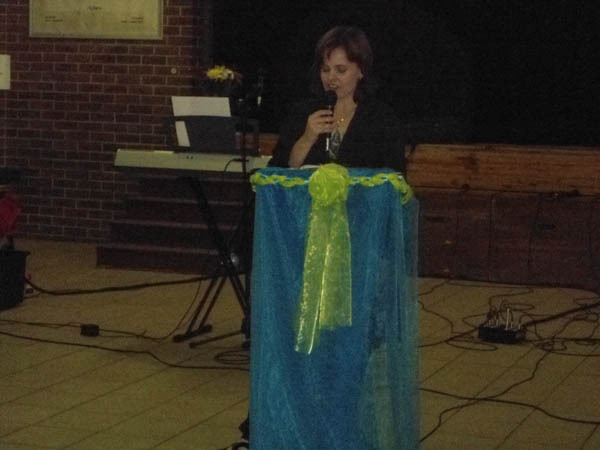 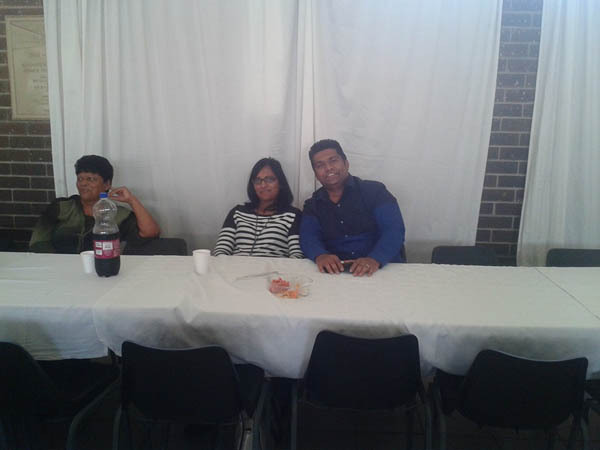 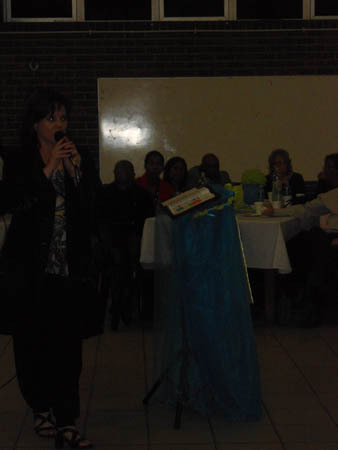 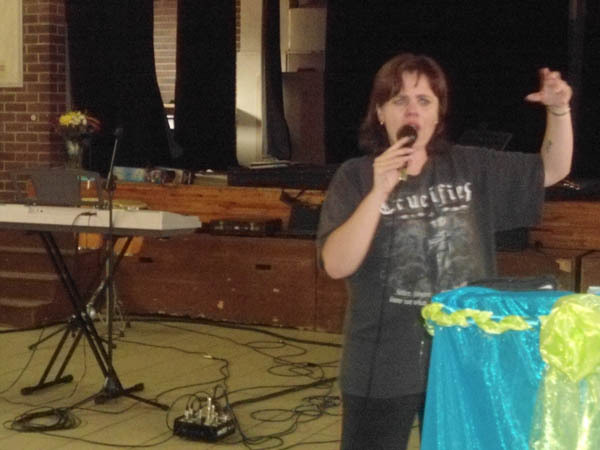 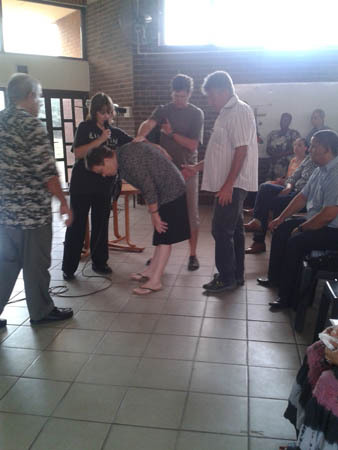 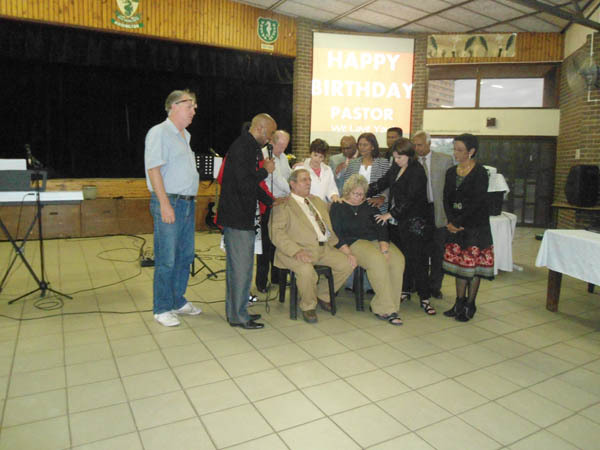 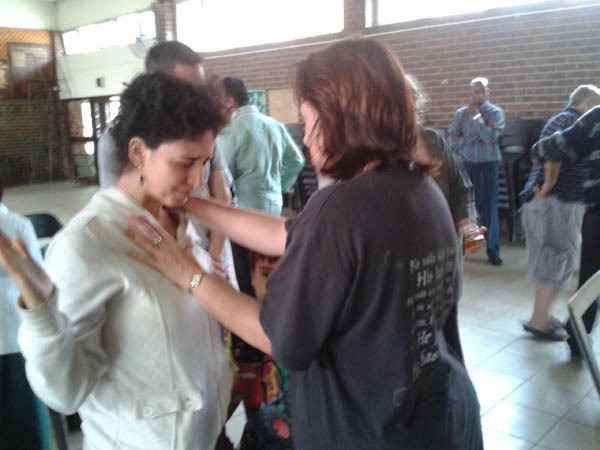 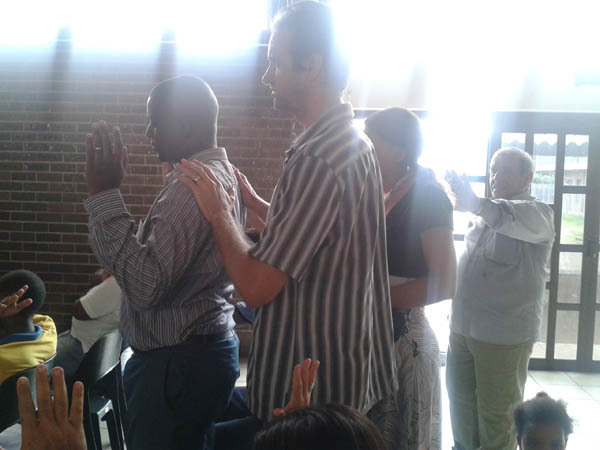 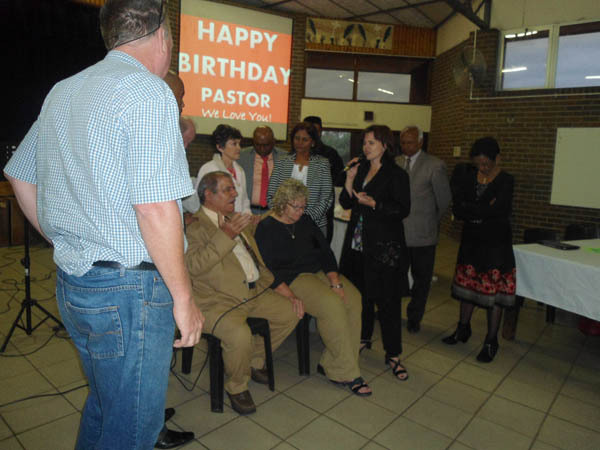 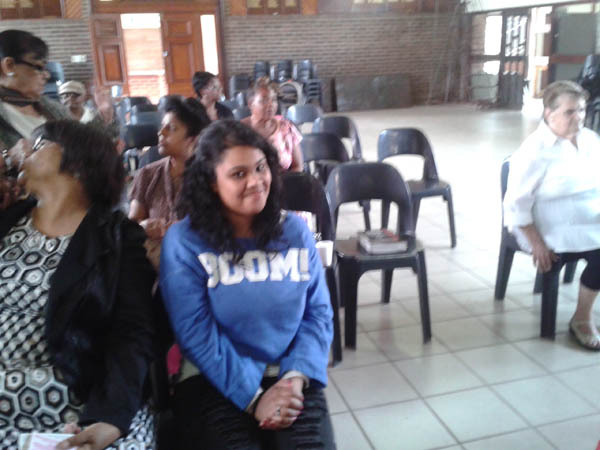 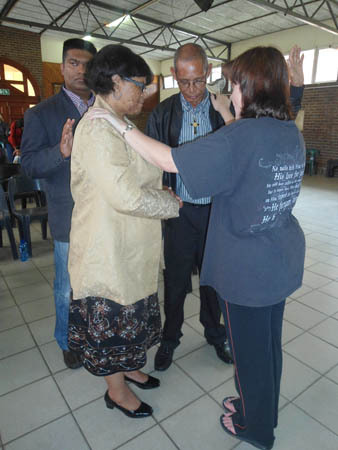 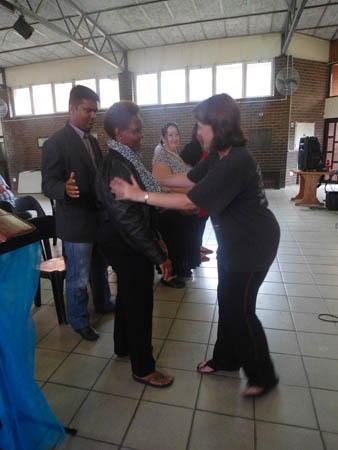 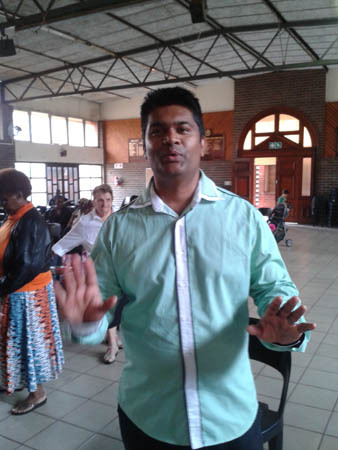 But God ministered to Pastor Aimilios that he had to return to Durban as he had not finished the work (ministry) there. 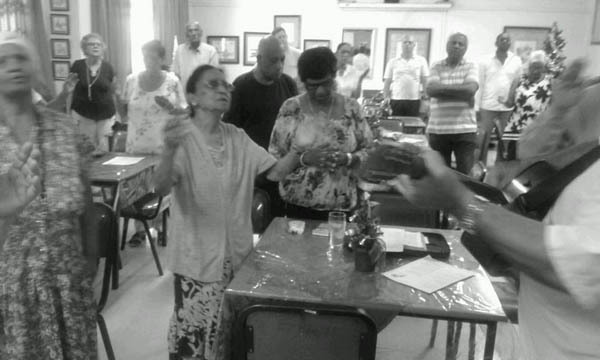 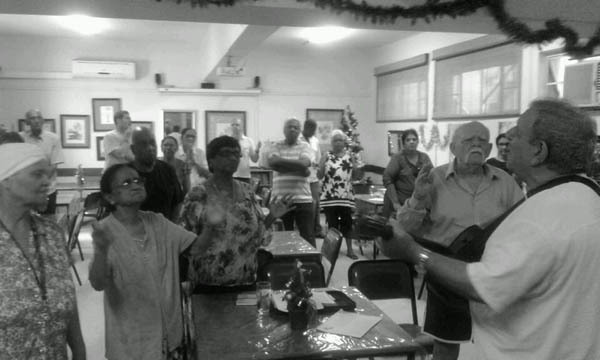 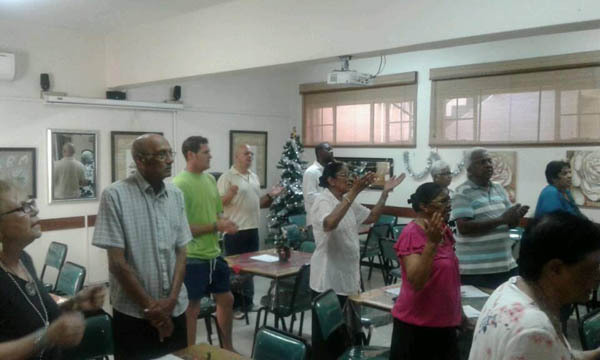 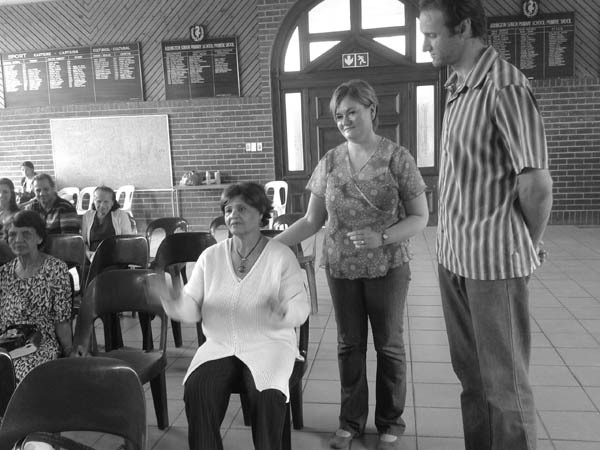 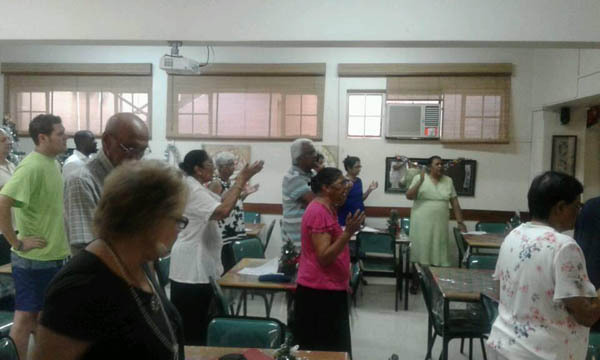 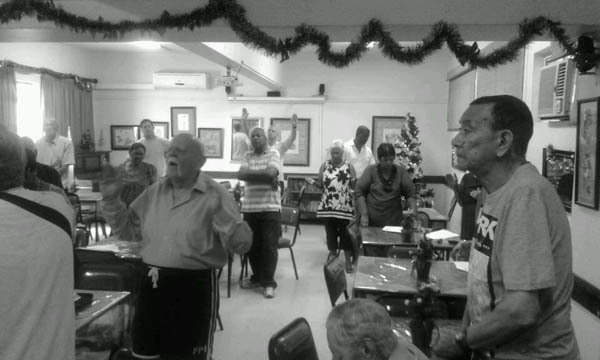 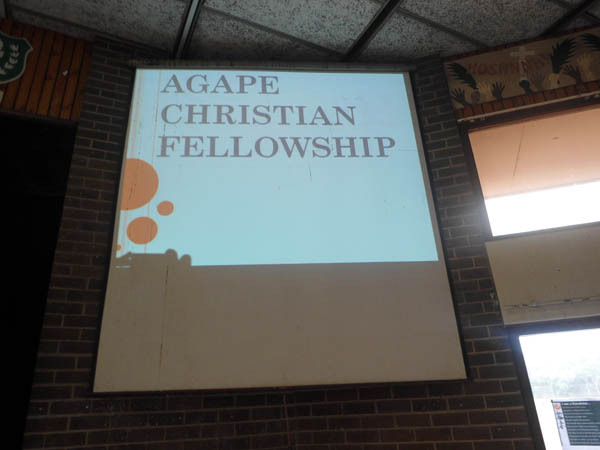 The Church originally was known as The Greek Church of Christ operating from various venues before moving to ADDINGTON PRIMARY SCHOOL; 42 Bell Street; South Beach; Durban The name was officially changed to Agape Christian Fellowship and Outreach to The Nations, after the Lord ministered to Pastor Aimilios that the church was not just for the Greeks but for all nations. 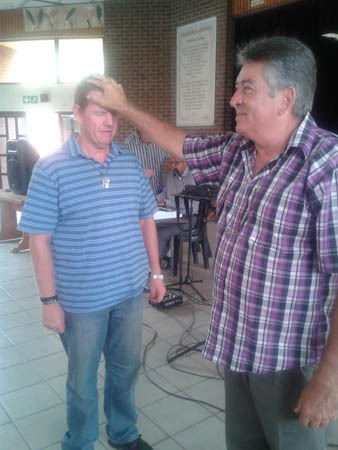 Prior to this the focus was on ministering to the Greeks and the Seamen. 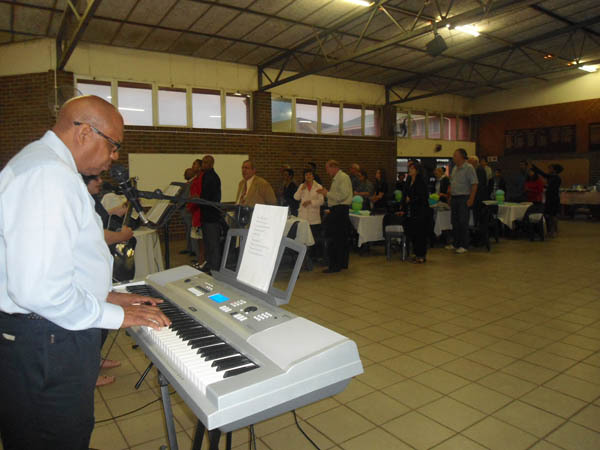 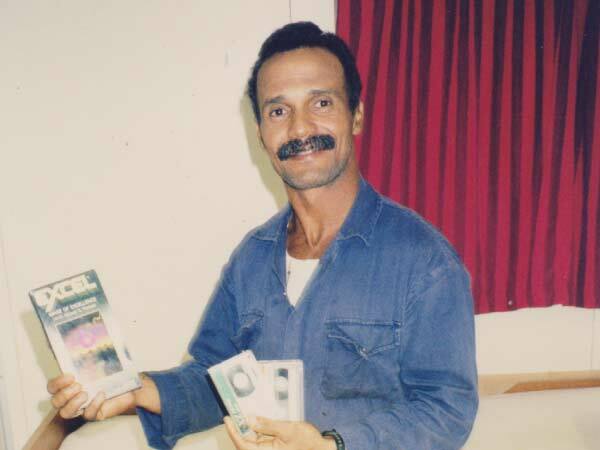 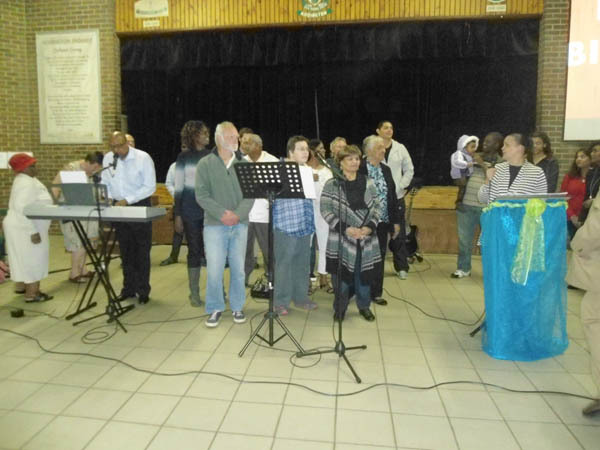 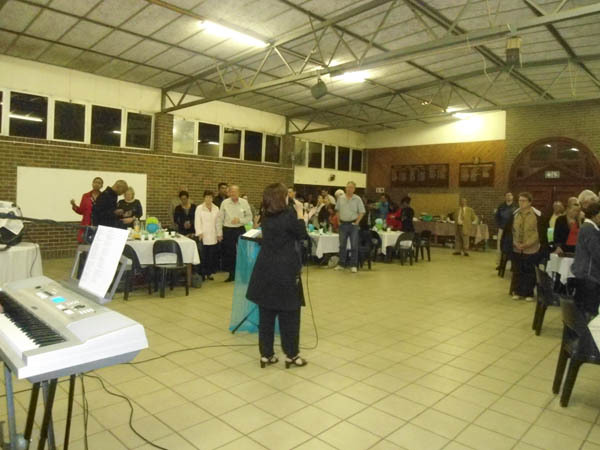 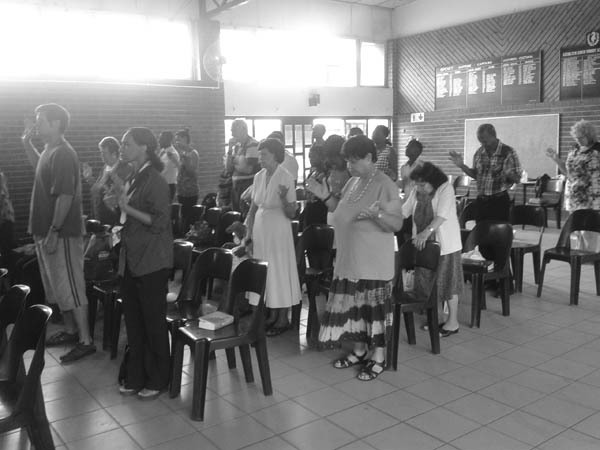 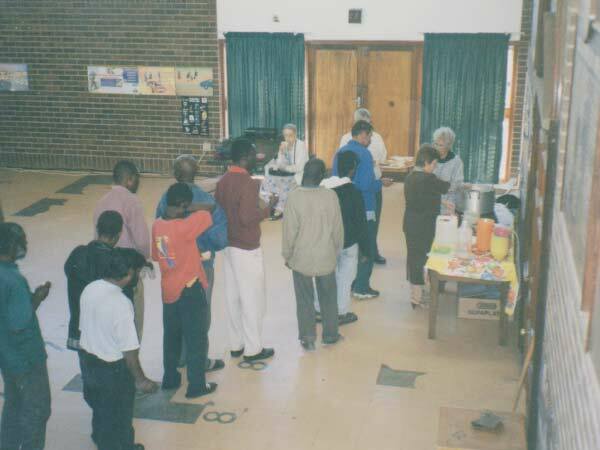 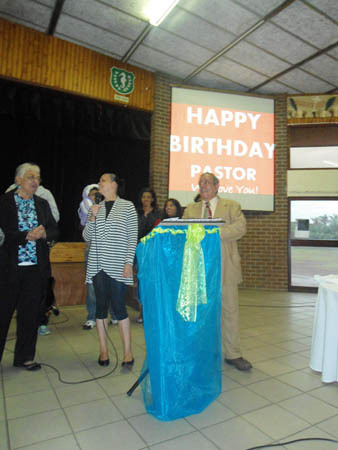 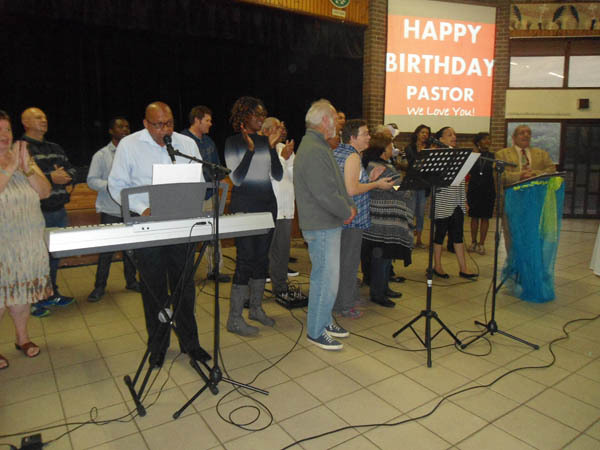 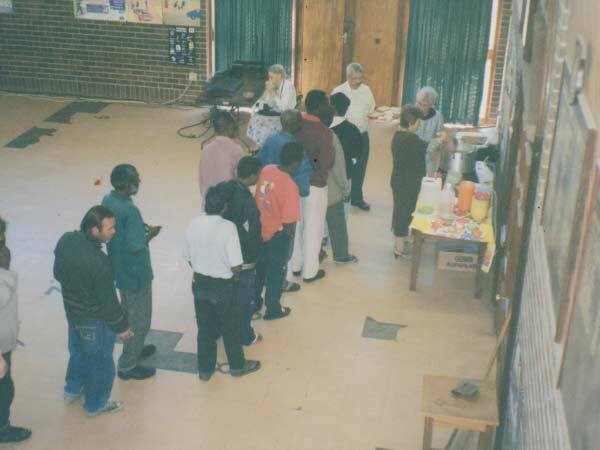 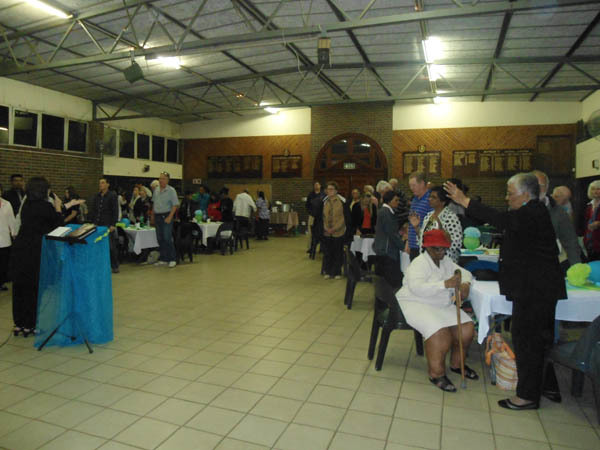 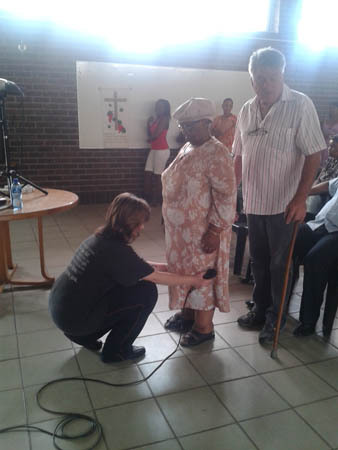 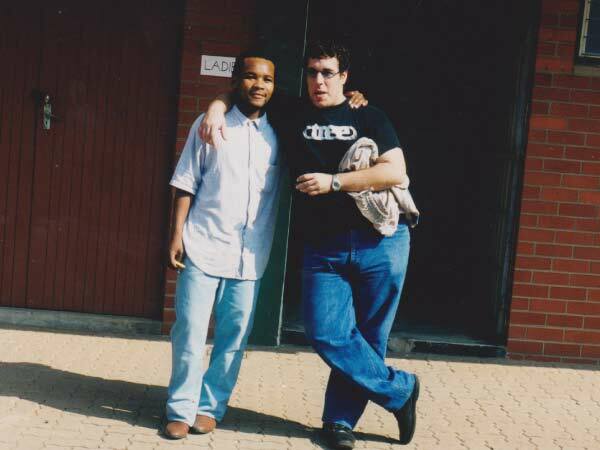 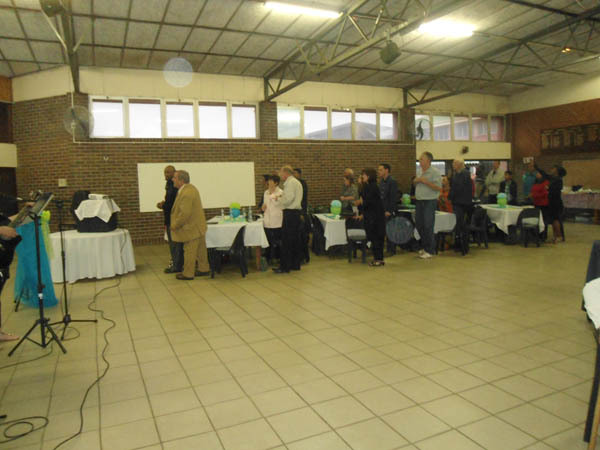 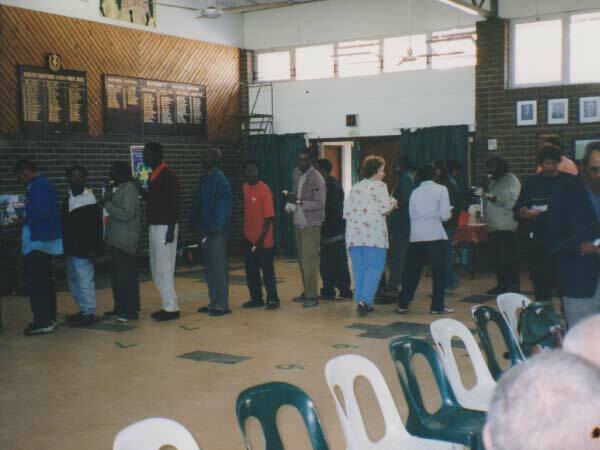 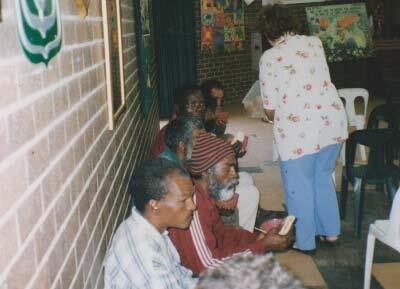 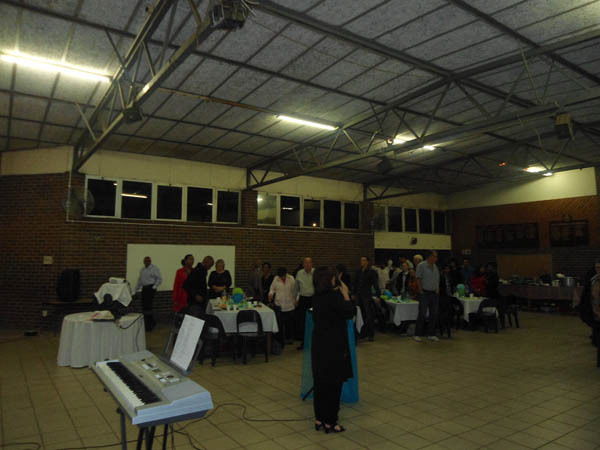 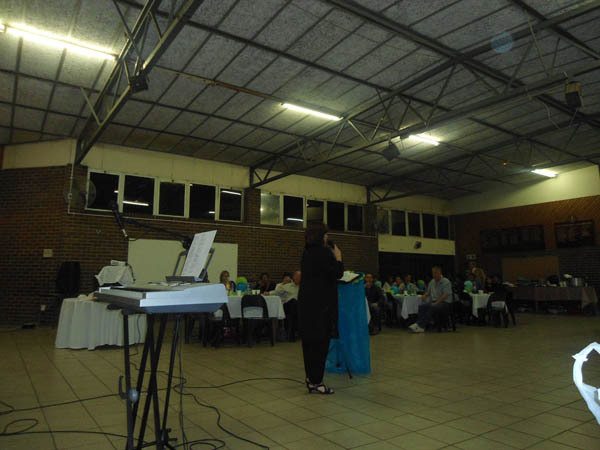 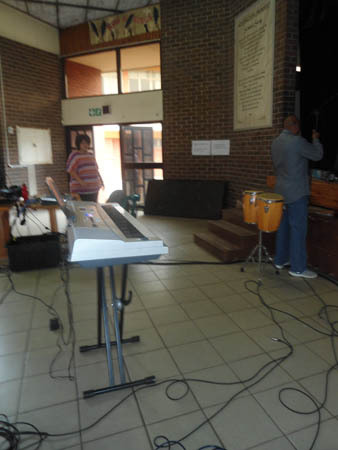 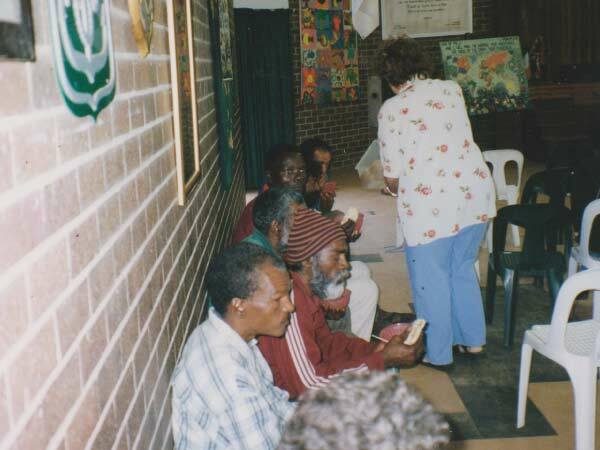 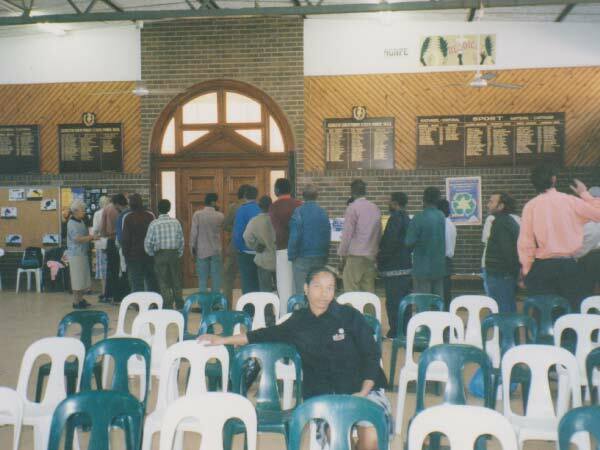 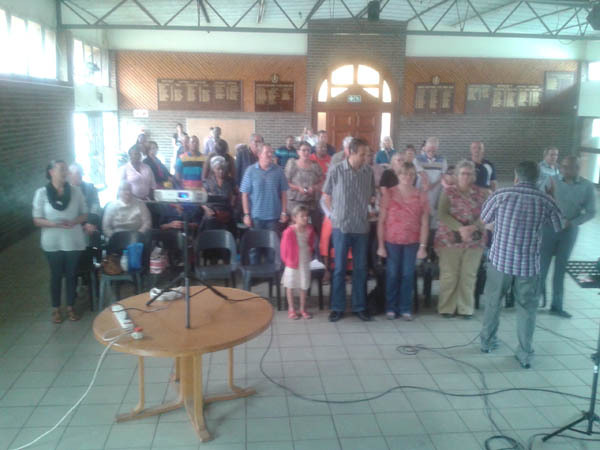 The first service for Agape was held on the 6 April 1997. 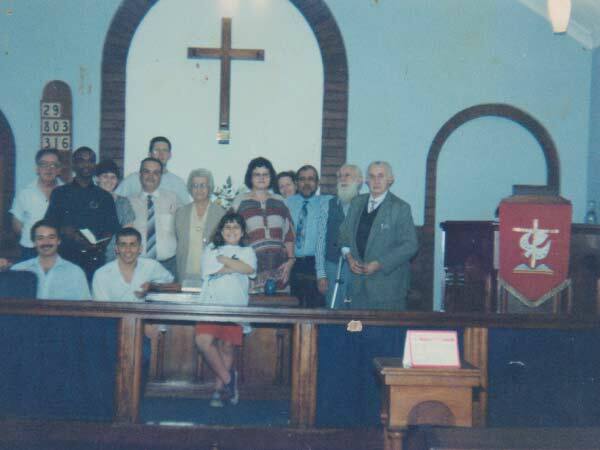 As a family church we minister to all nations, the church is made up of many nations, brothers and sisters in Christ Jesus. 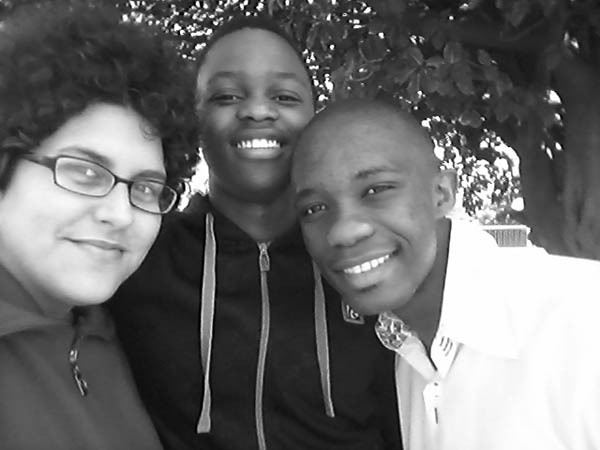 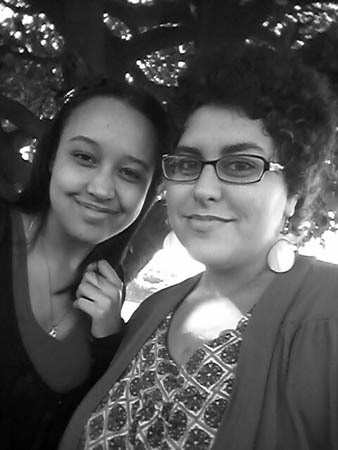 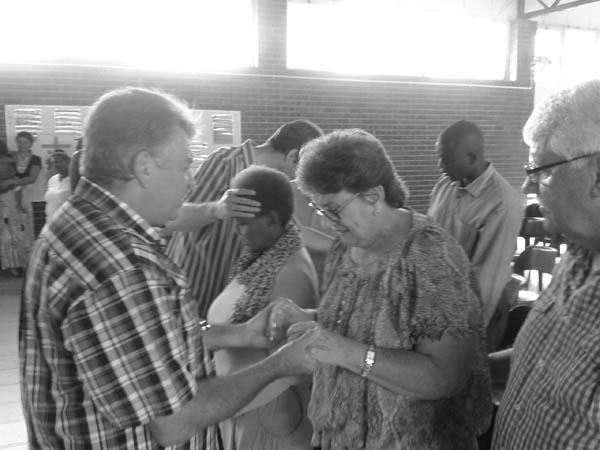 WE ARE ONE FAMILY BOUND TOGETHER BY THE LOVE OF THE LORD. 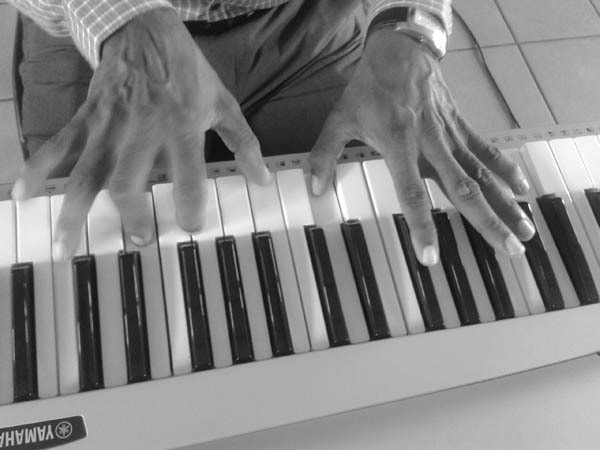 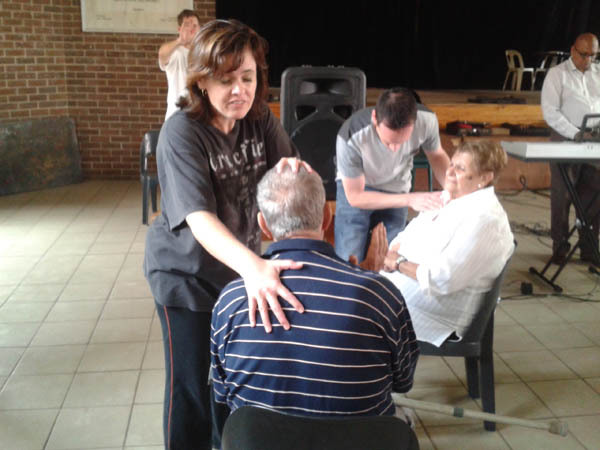 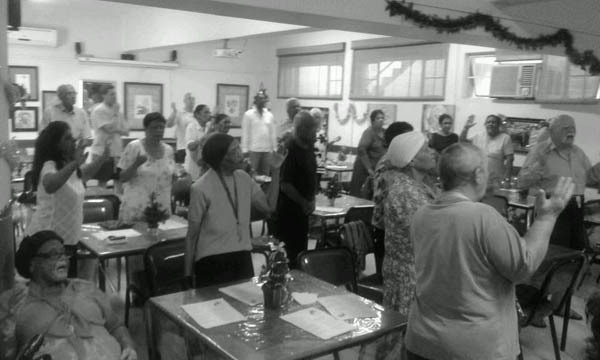 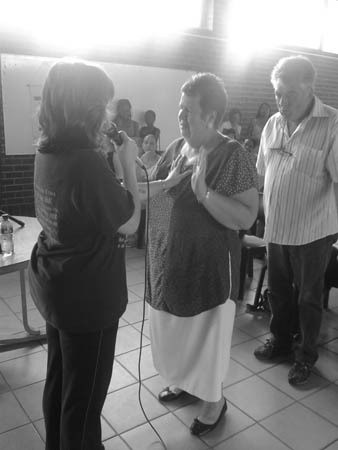 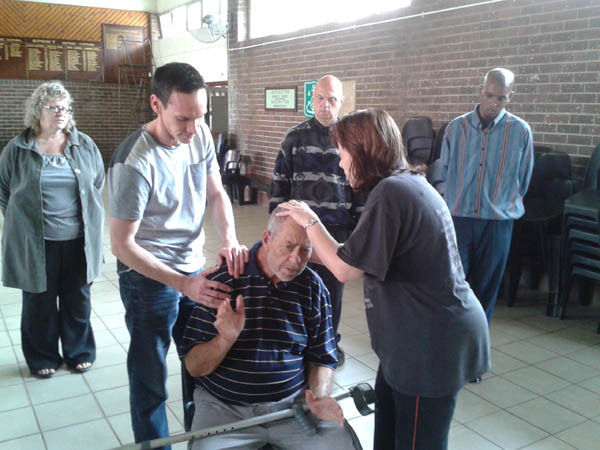 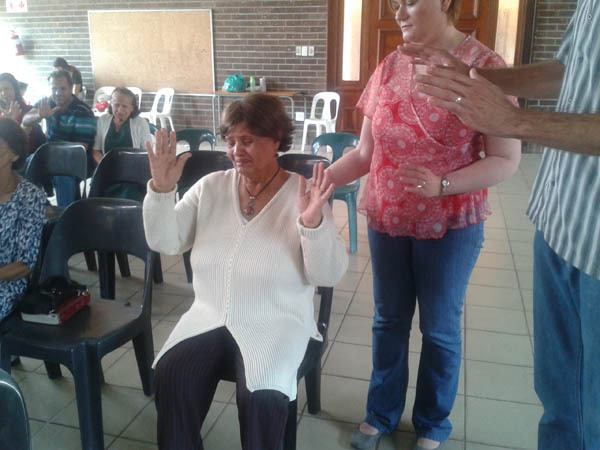 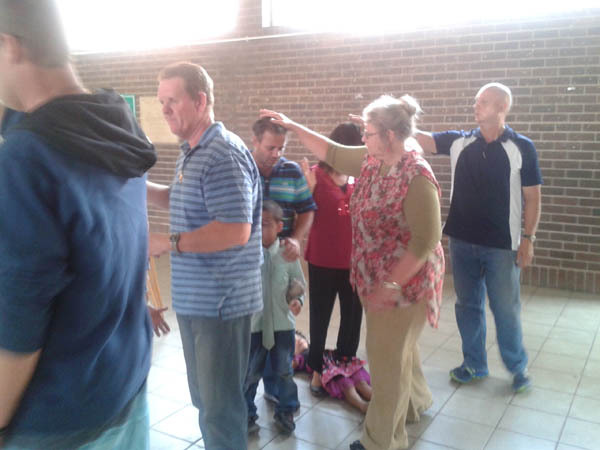 To be effective in touching and transforming the lives of the nations in the Point Area. 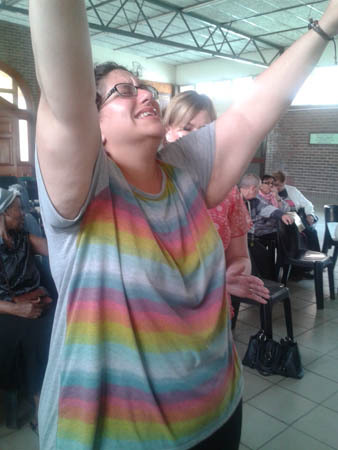 Our goal is to be willing vessels for God to use our hands, feet and mouths as instruments to shed/release His unconditional love and power as directed by His command. 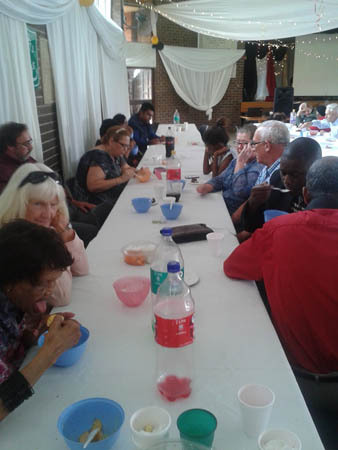 To bring all nations to Christ and into the fellowship Of His family, to disciple fellow brothers and sisters into Christ like maturity, teaching them how to practically apply the Word of god in their lives. 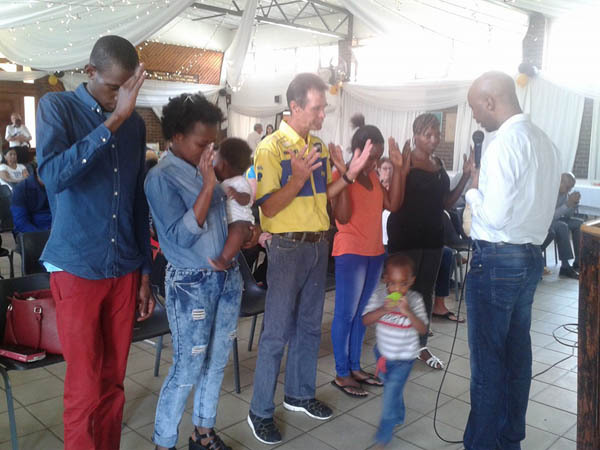 Our goal is to empower them to get to a place where they operate proficiently in biblical principles of faith, love, healing, prosperity, righteousness and victorious Christian living in the Church and the World in order to glorify God’s name. 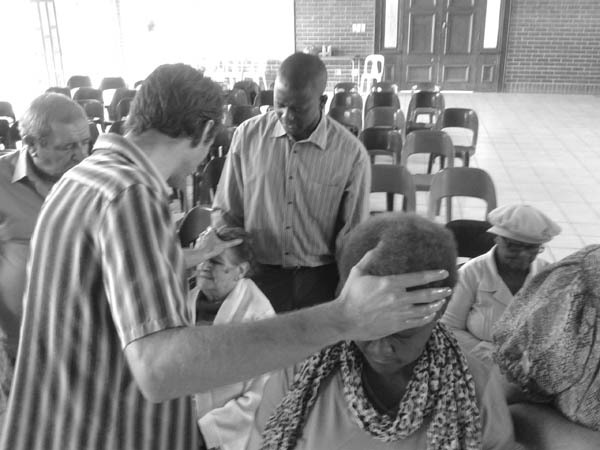 Psalm 2: 8 Ask of Me, and I will give you the nations for your inheritance, and the ends of the earth for your possessions. 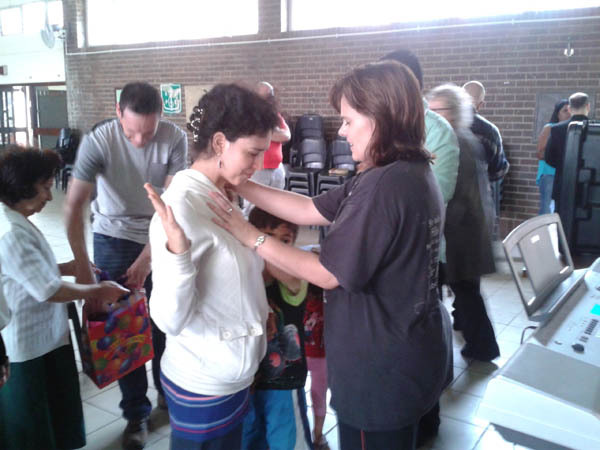 To live a life based on biblical principles and to lead by example. 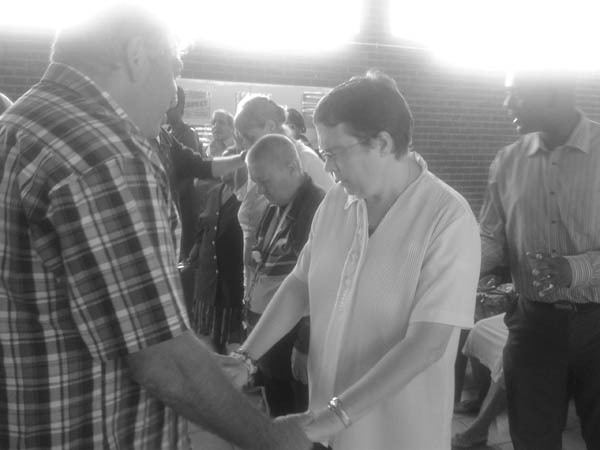 To be faithful to the church, the vision together with the visionary. 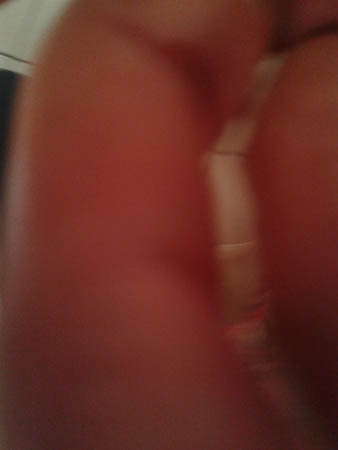 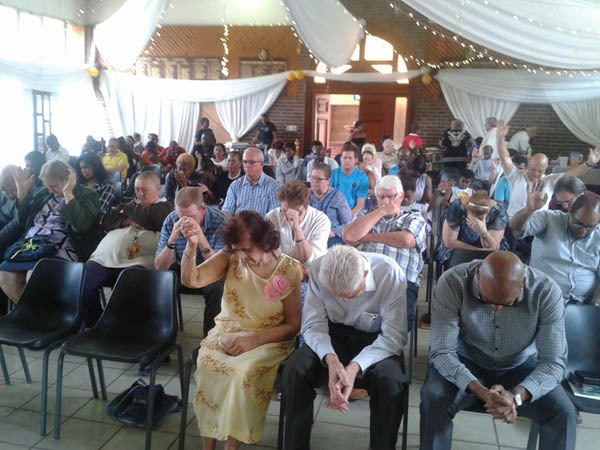 To endeavour to attend every church service, home cell and pray meeting. 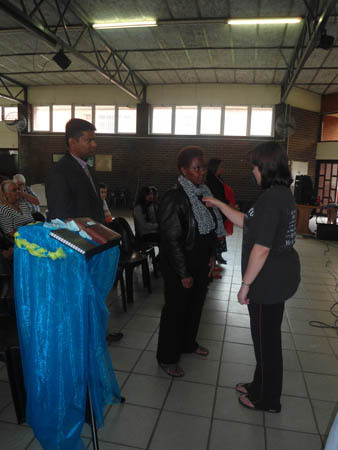 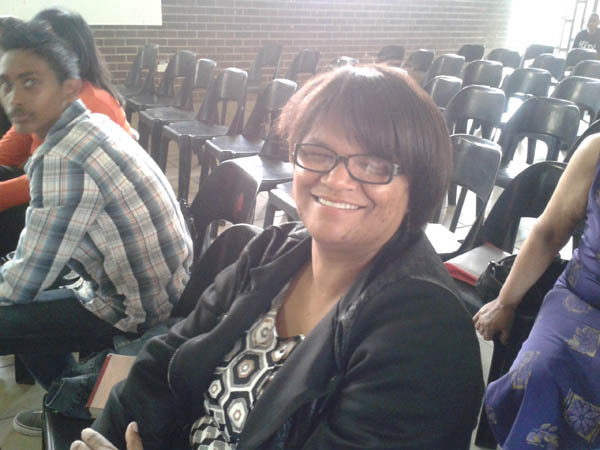 To endeavour to study God’s Word and enhance our lives with a study program. 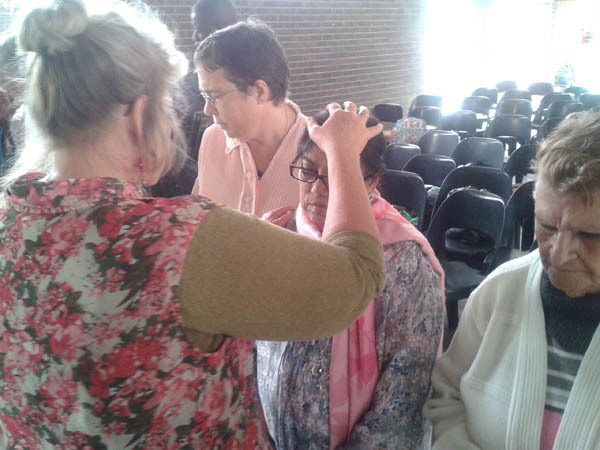 To avail ourselves to be ready at any time to do God’s work, to build, to strengthen, to pray, to evangelize and encourage fellow brothers and sisters in the church. 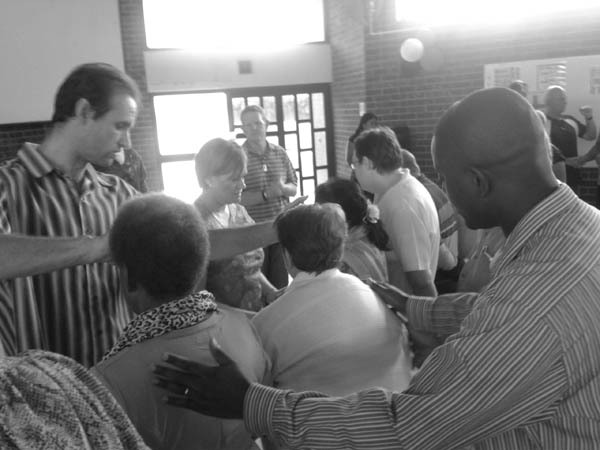 We believe in one God, eternally existing in three Persons- Father, Son and Holy Spirit. 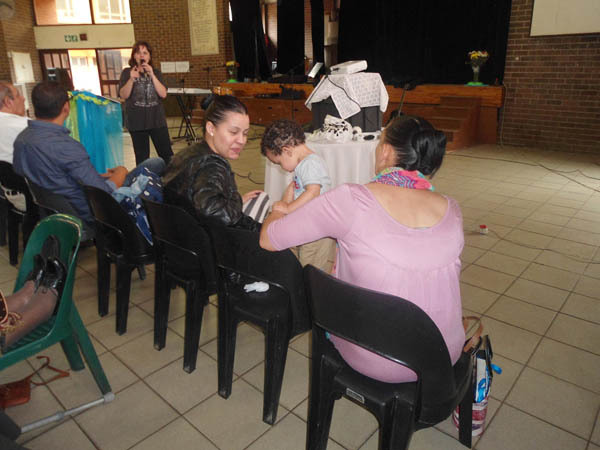 We believe that Jesus was begotten of the Father, conceived by the Holy Spirit, born of the Virgin Mary, and is true God and true man. 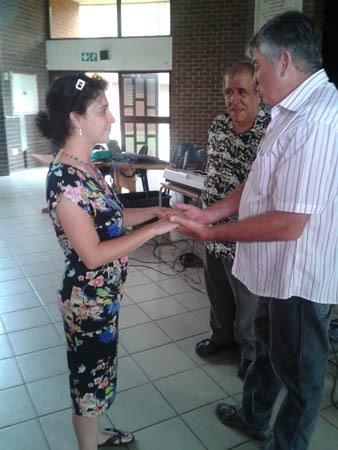 With regards to sexual behaviour, we believe in heterosexual relationships between a natural man and a natural woman within the confines of lawful matrimony. 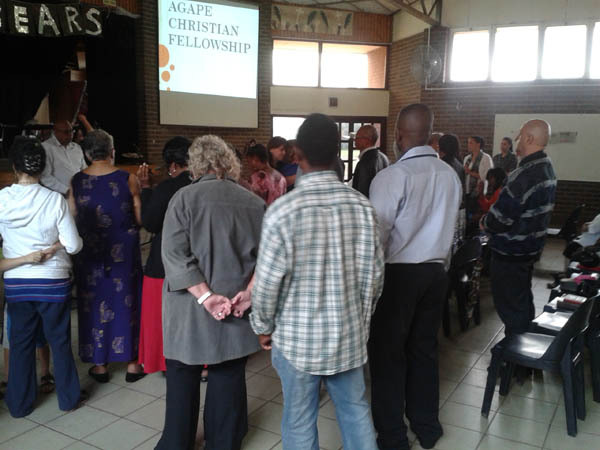 Adherence to this stated principle of sexual behaviour is an inherent requirement with Agape Christian Fellowship. 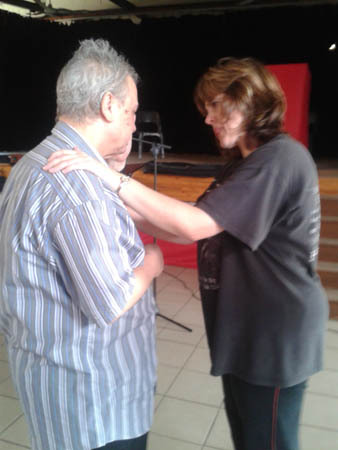 We believe that the Lord Jesus Christ died for our sins a substitutionary sacrifice according to the Scriptures and all who believe in Him are justified on the grounds of His shed blood. 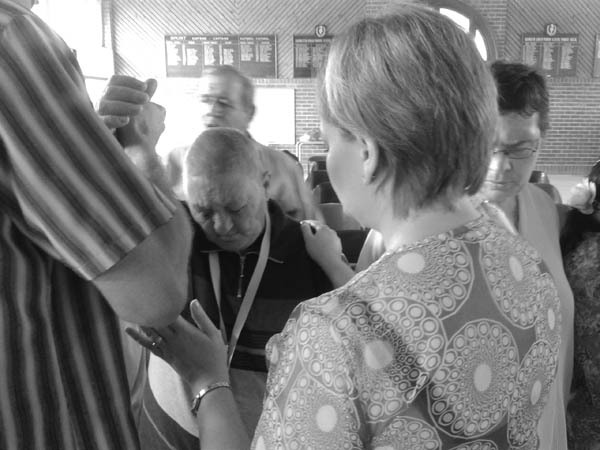 We believe in the bodily resurrection of the Lord Jesus. 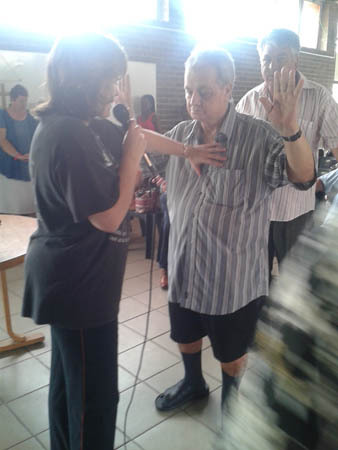 His ascension into Heaven, and His present life as our High Priest and Advocate. 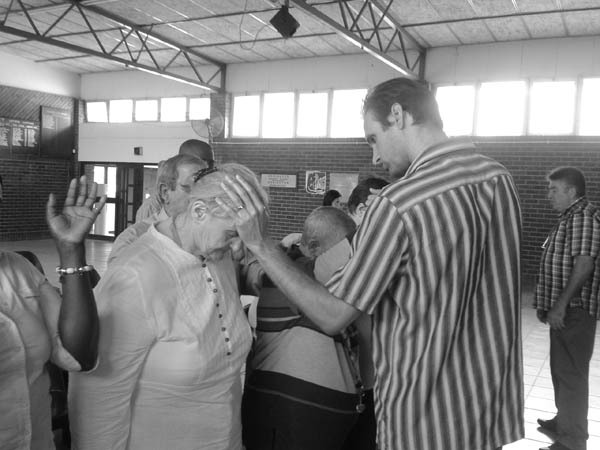 We believe in the baptism in the Holy Spirit, empowering and equipping believers for service, with the accompanying supernatural gifts of the Holy Spirit, and in fellowship with the Holy Spirit. 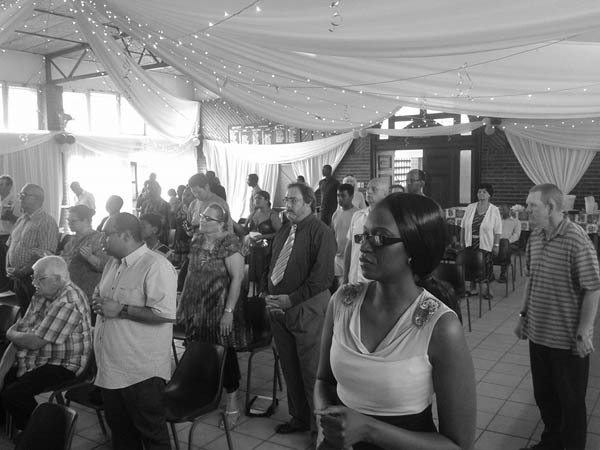 We believe in the divinely ordained ministries of Apostle, Prophet, Evangelist, Pastor and Teacher. 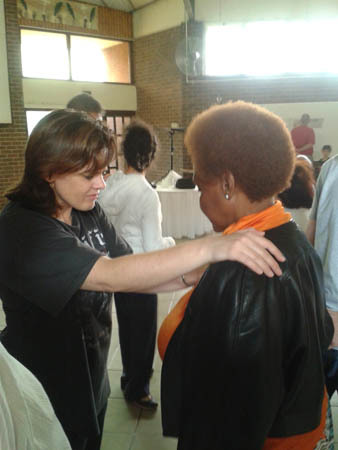 With regards to submission to authority, we believe in the principle of being in authority because you are under authority. 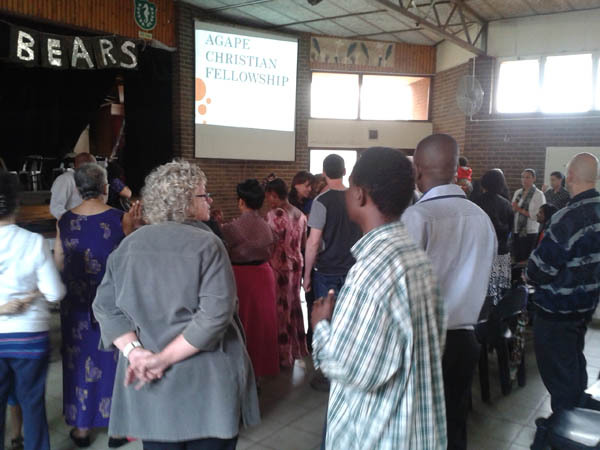 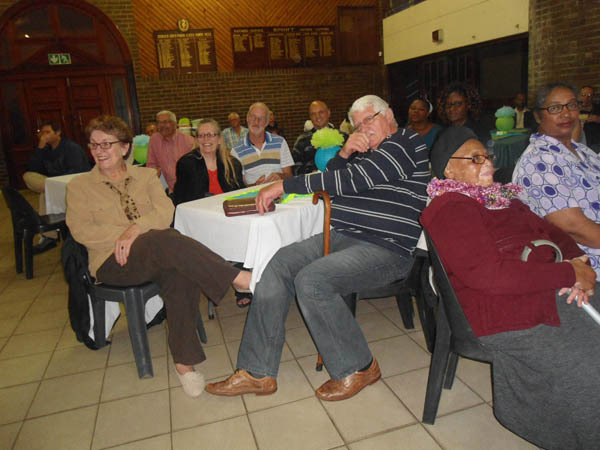 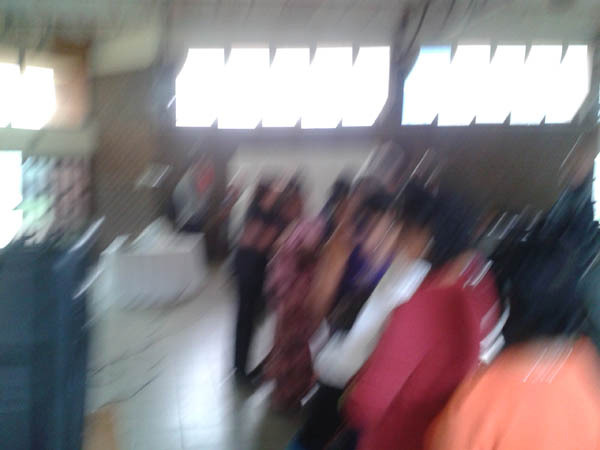 As such, it is understood that Agape Christian Fellowship membership shall be subject to submission to authority in matters pertaining to church governance, doctrine and personal behaviour. 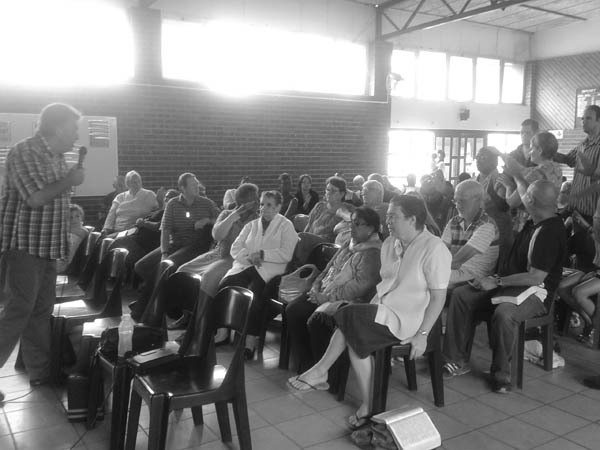 We believe that the one true Church is the whole company of those who have been redeemed by Jesus Christ and regenerated by the Holy Spirit; that the local church on earth should take its character from this concept of the Church spiritual and therefore the new birth and personal confession of Christ are essentials of church membership. 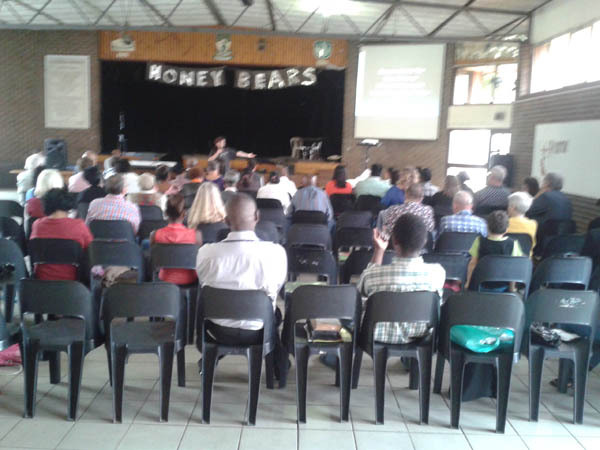 We believe that the Bible teaches that without holiness no man can see the Lord. 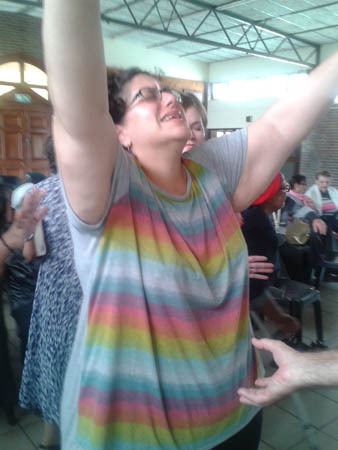 We believe in the doctrine of sanctification as a definite, yet progressive work of grace, commencing at the time of the new birth and continuing until consummation of salvation. 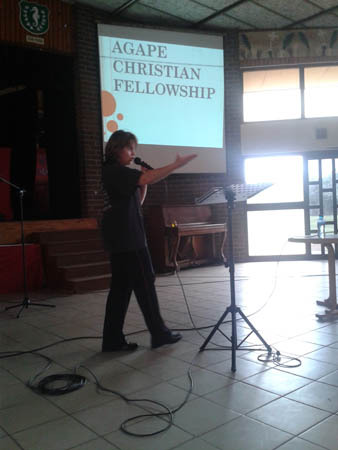 The fellowship is open to any further truth which the Holy Spirit may illuminate from the Scriptures. 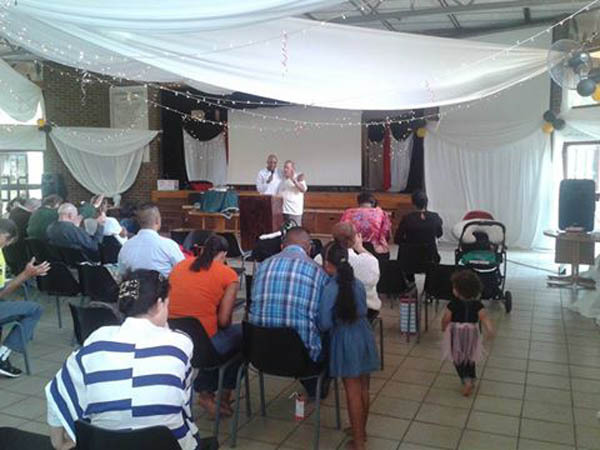 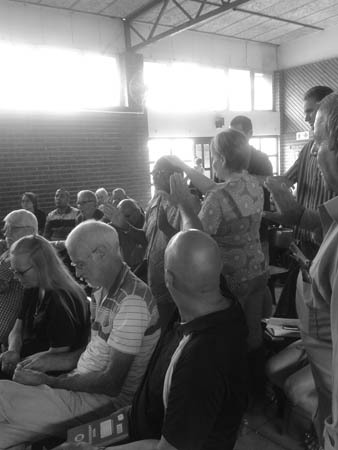 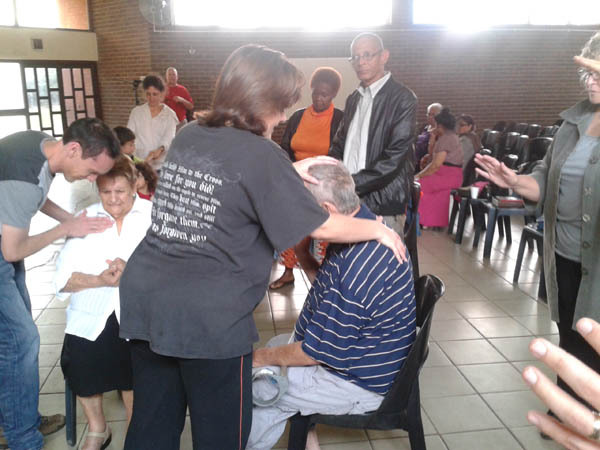 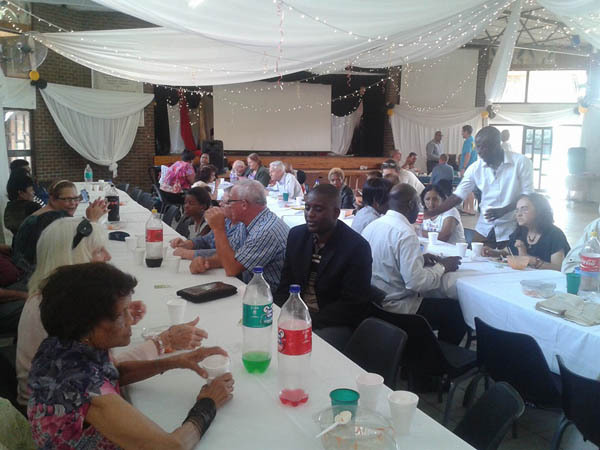 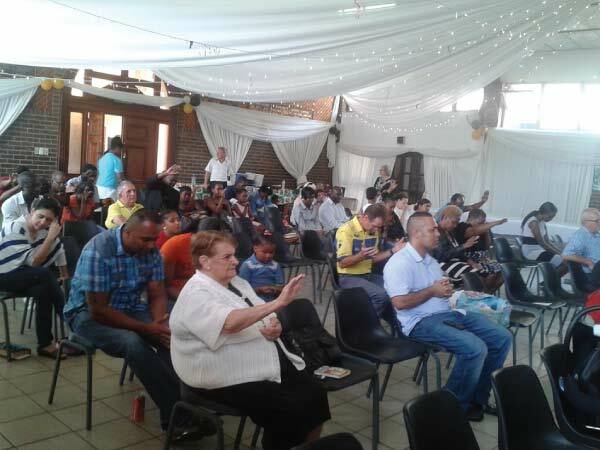 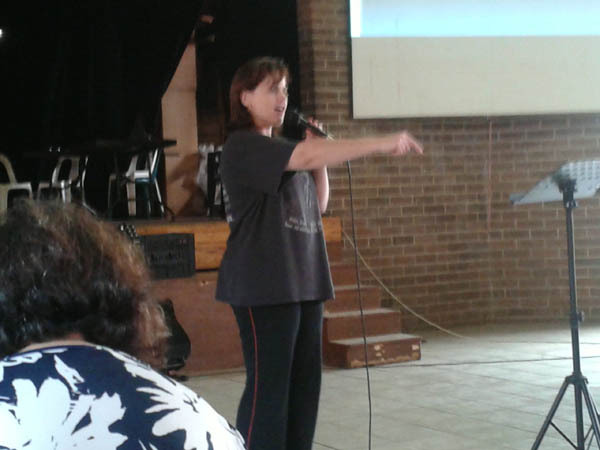 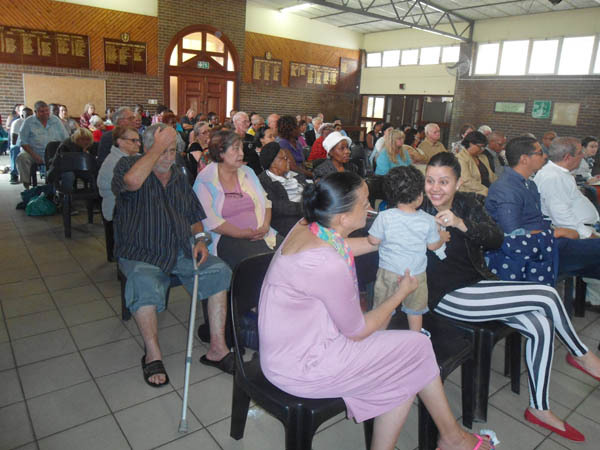 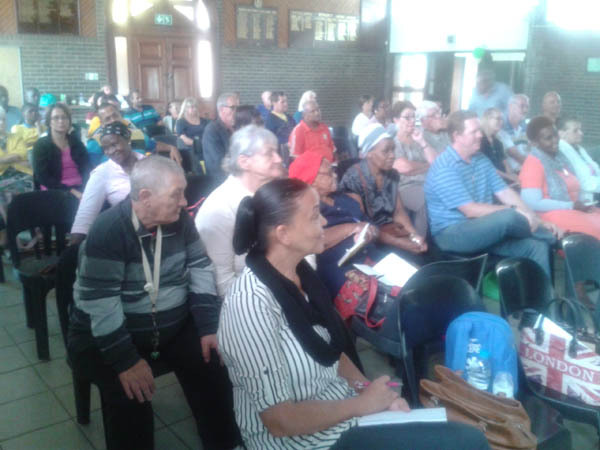 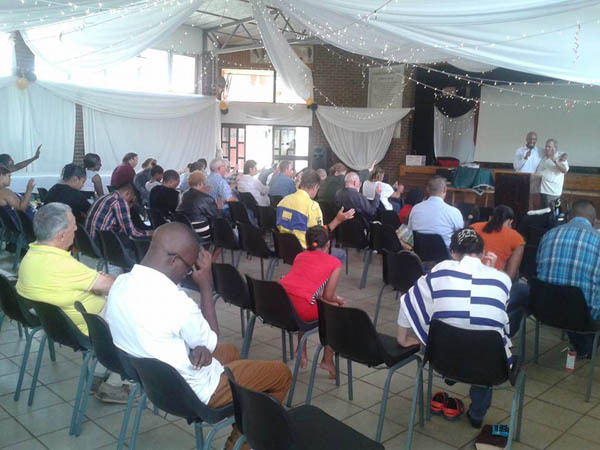 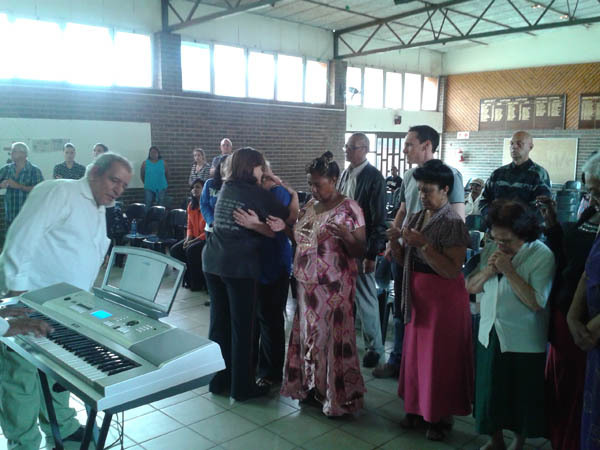 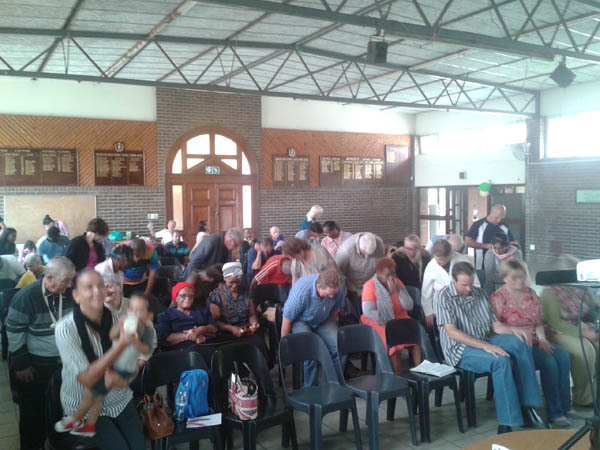 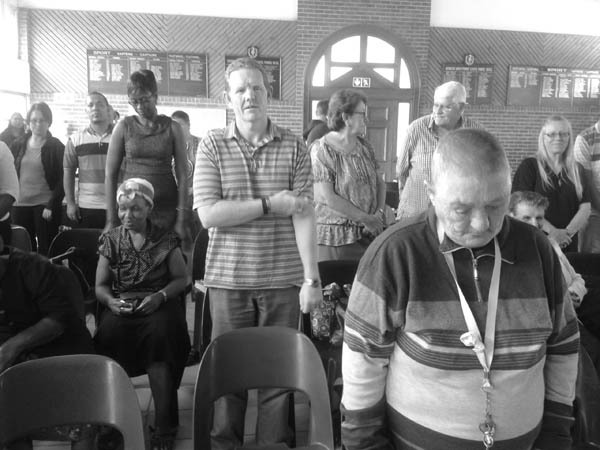 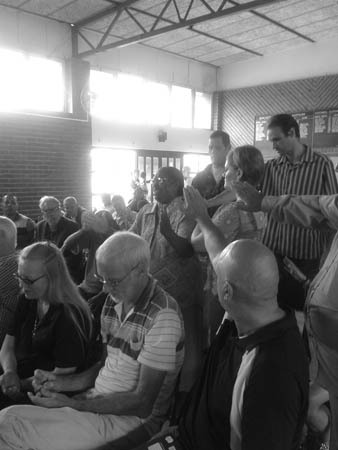 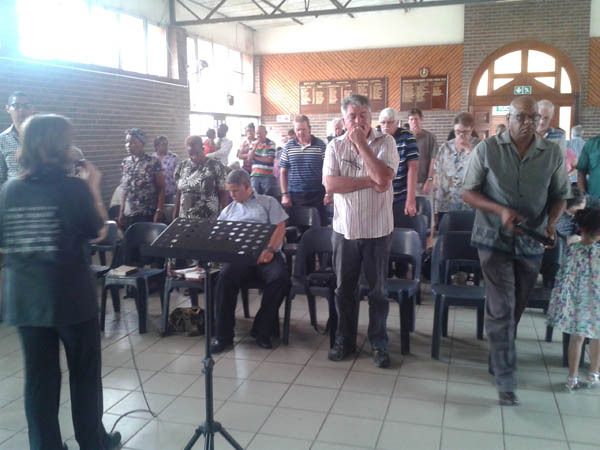 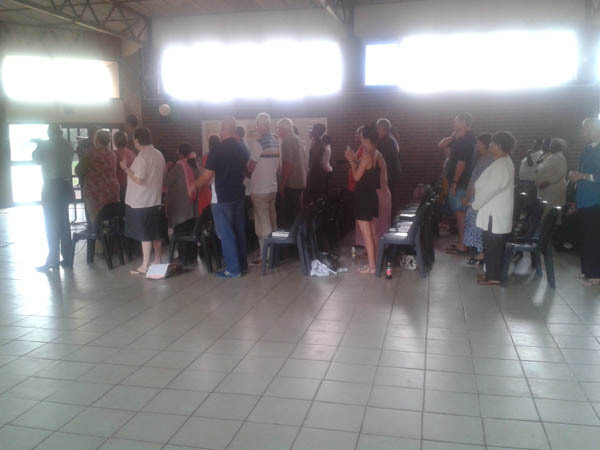 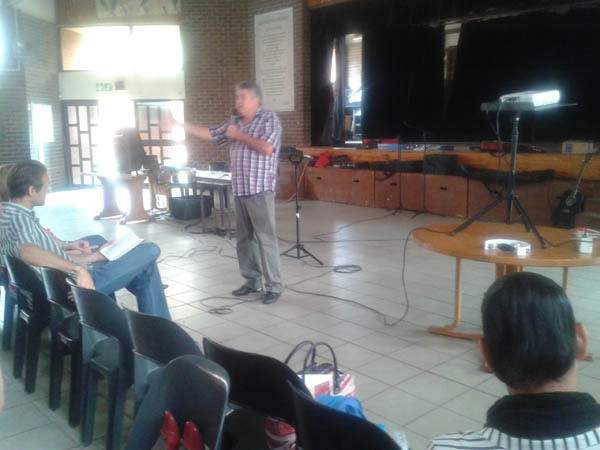 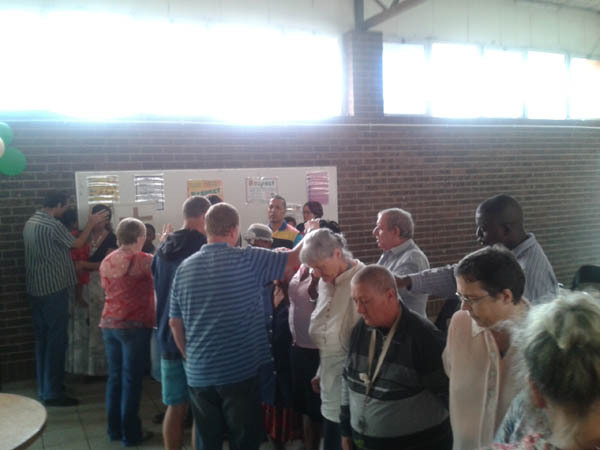 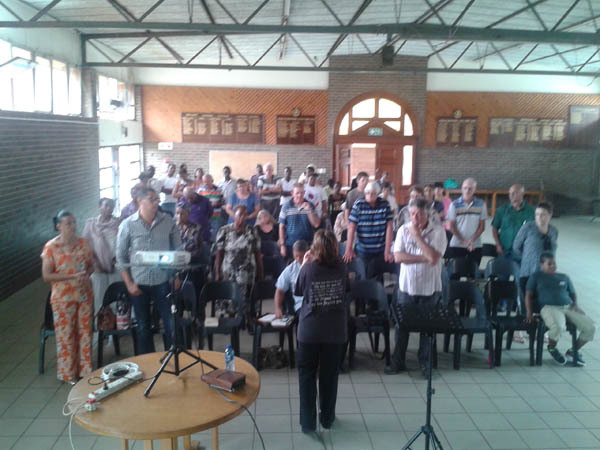 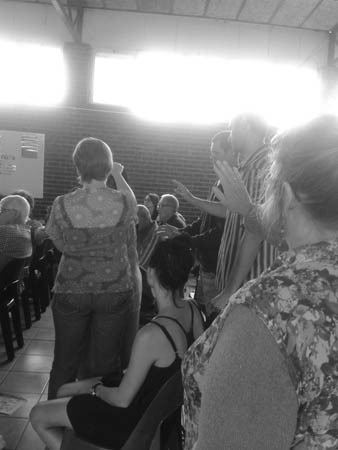 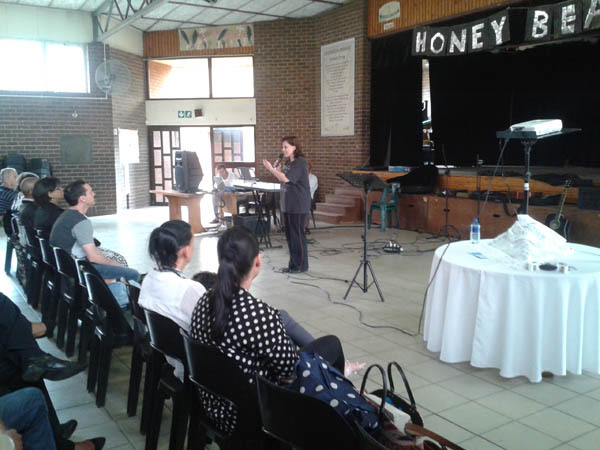 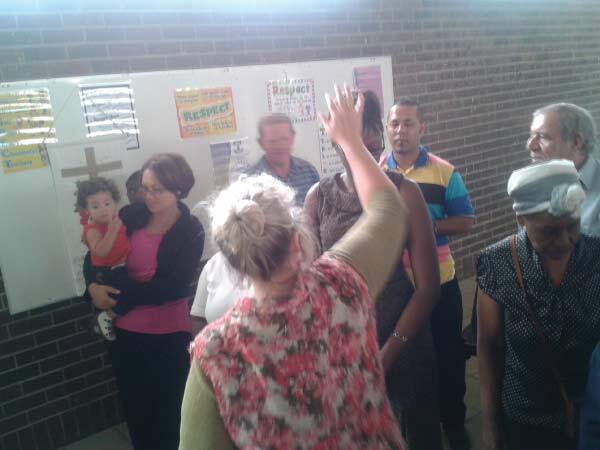 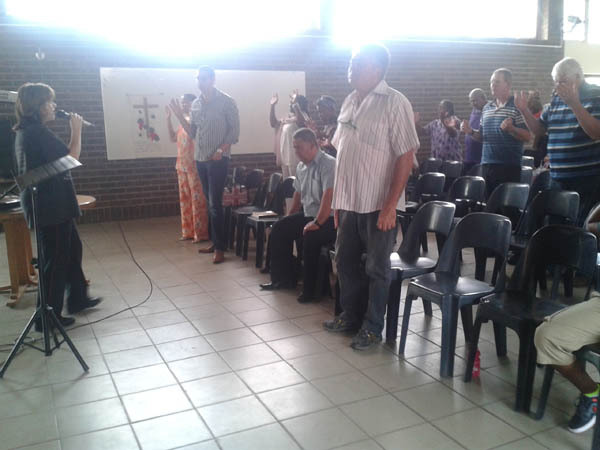 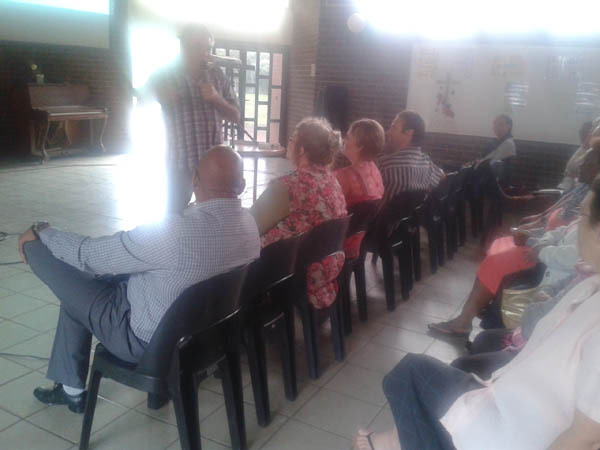 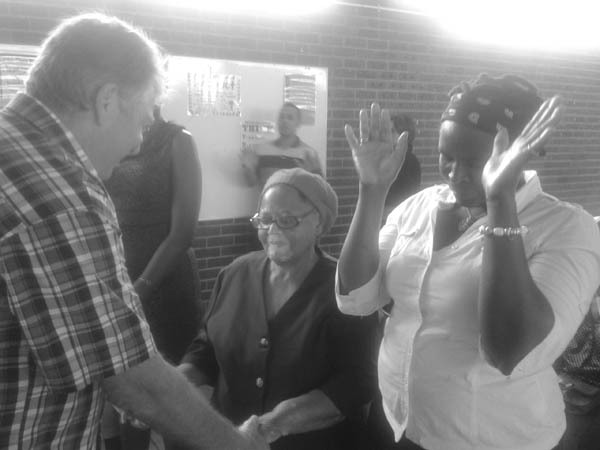 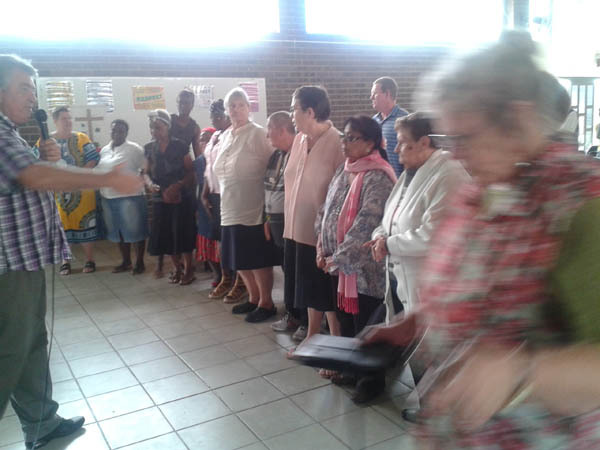 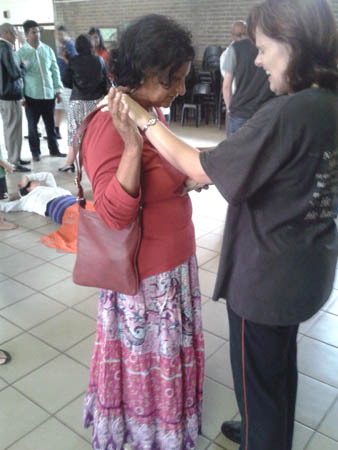 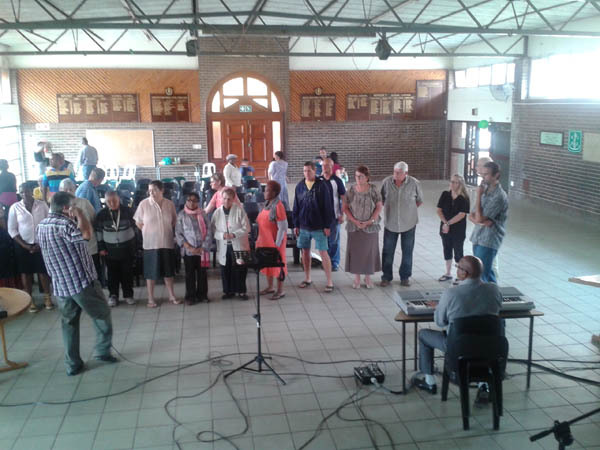 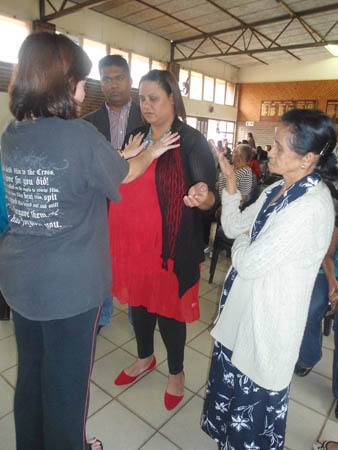 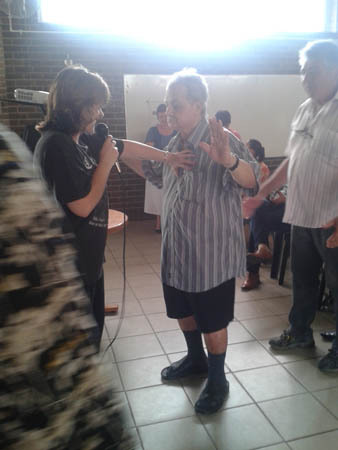 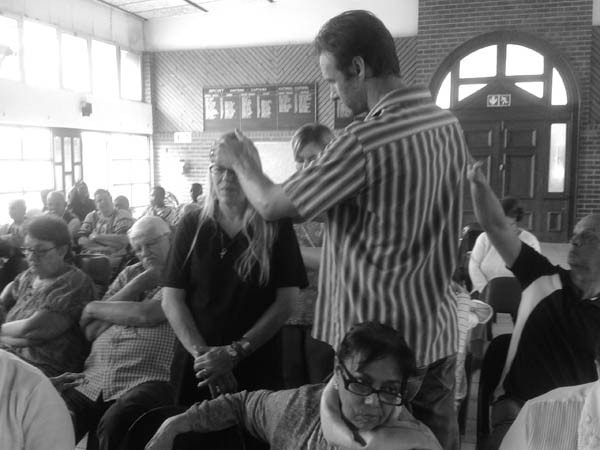 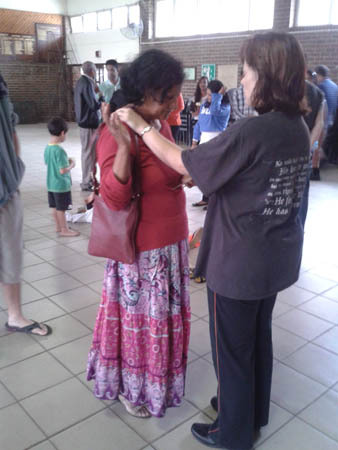 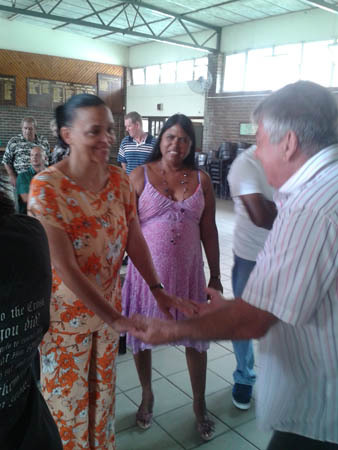 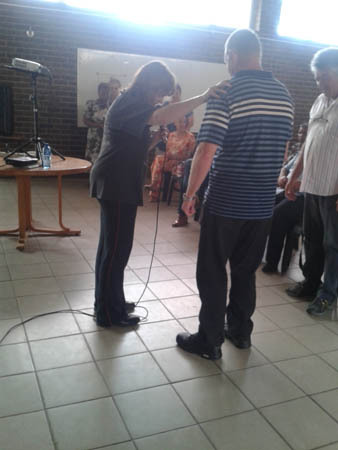 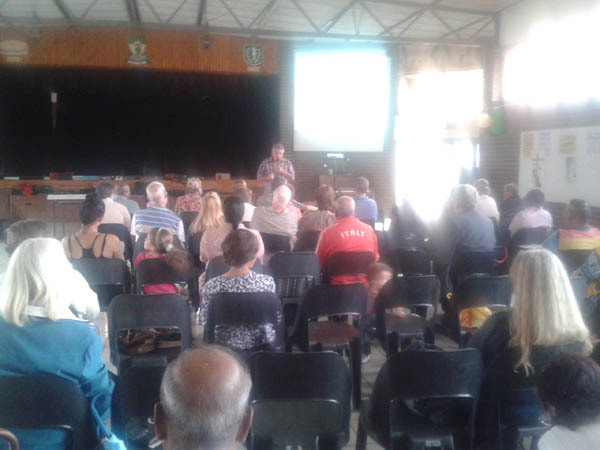 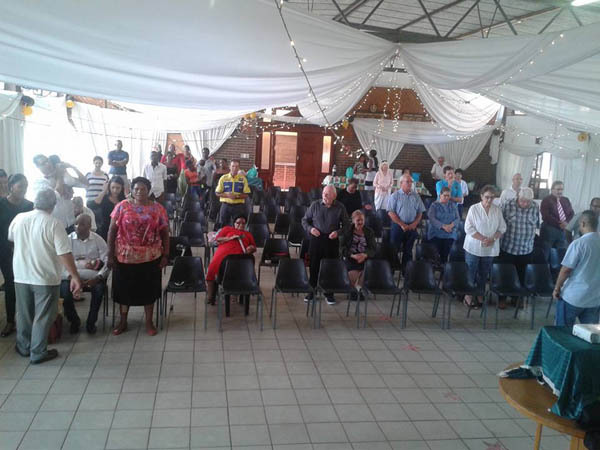 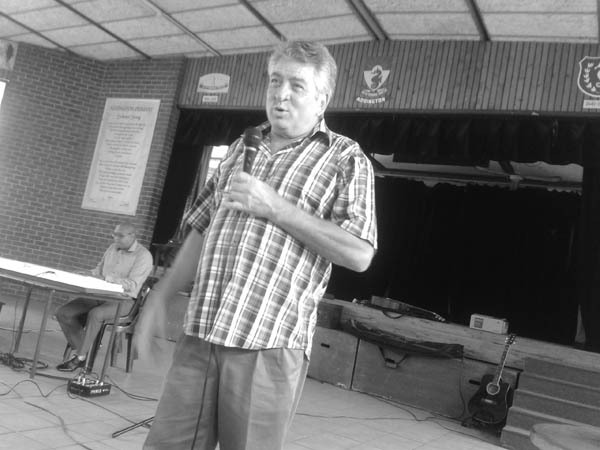 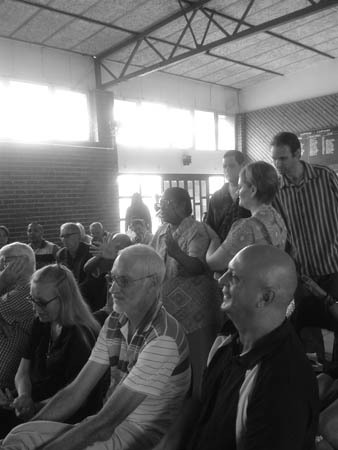 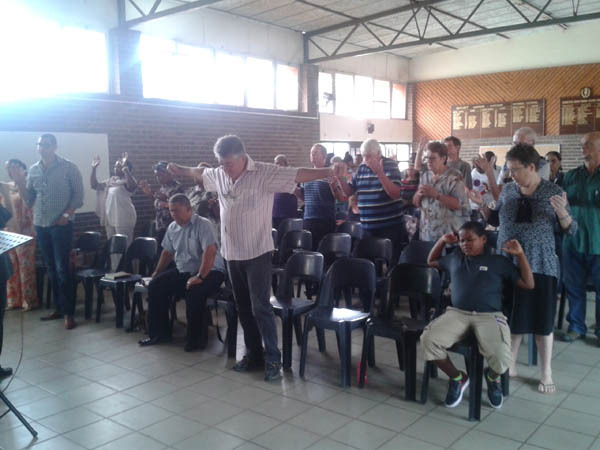 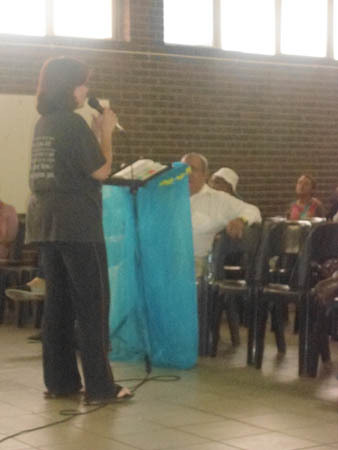 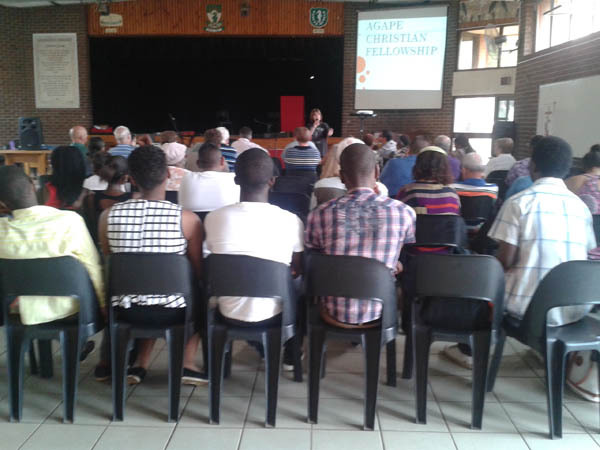 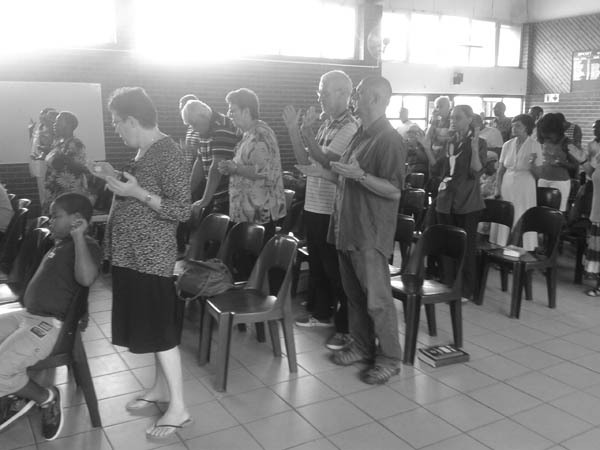 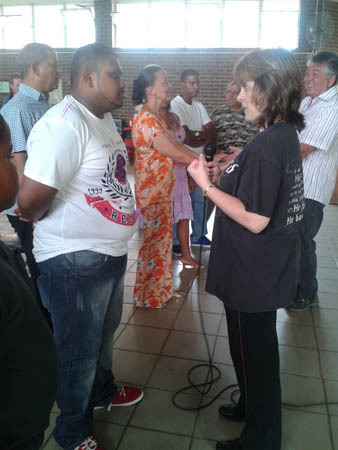 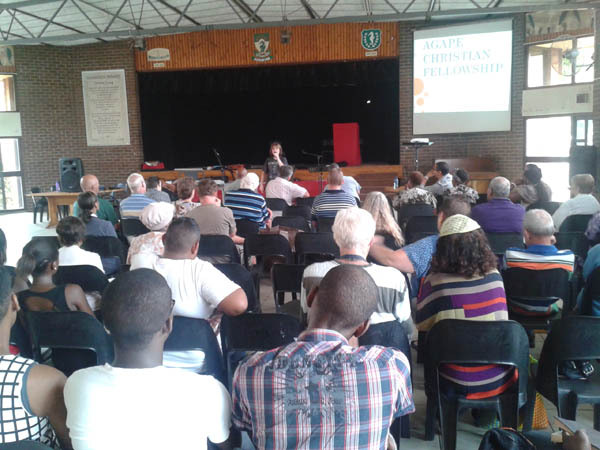 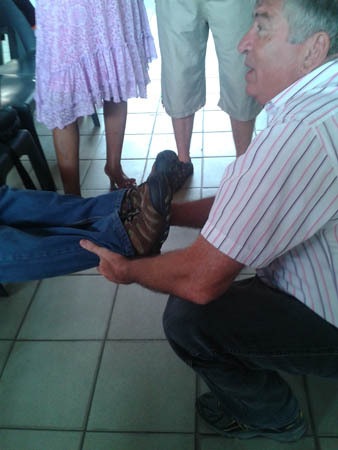 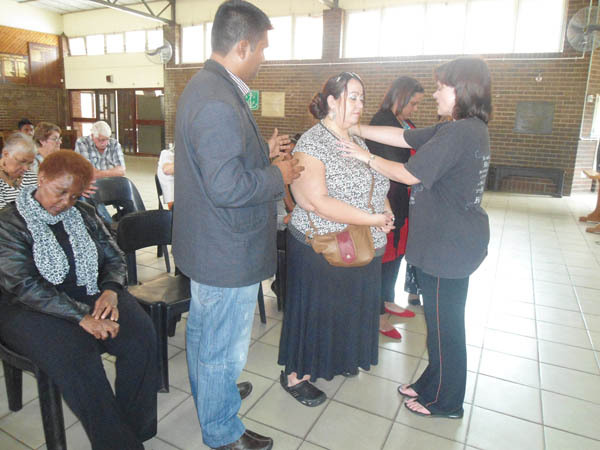 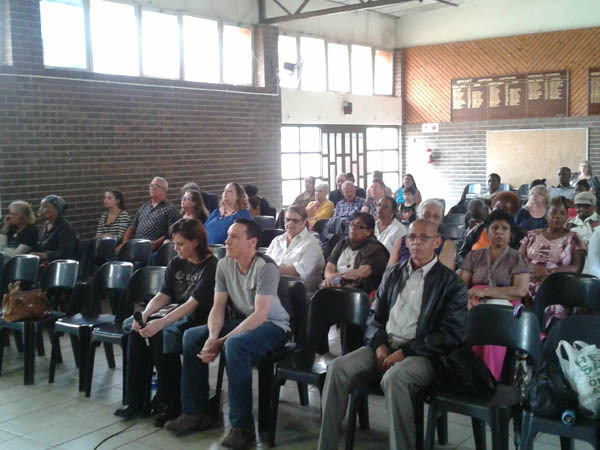 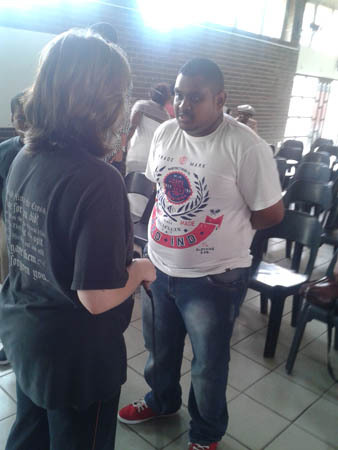 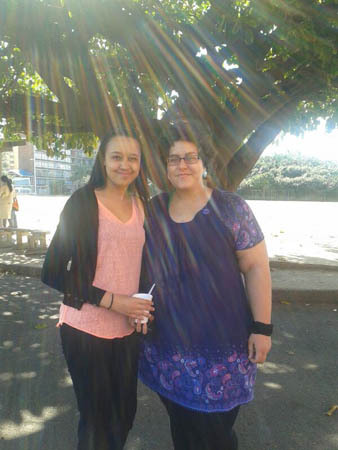 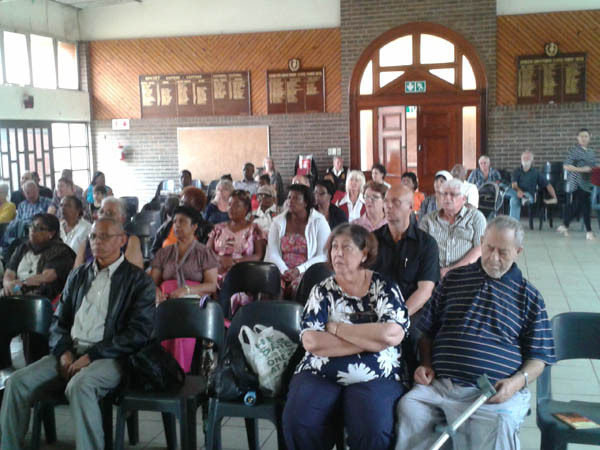 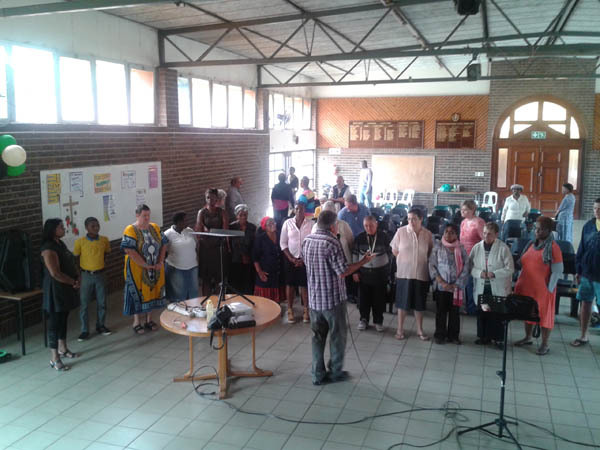 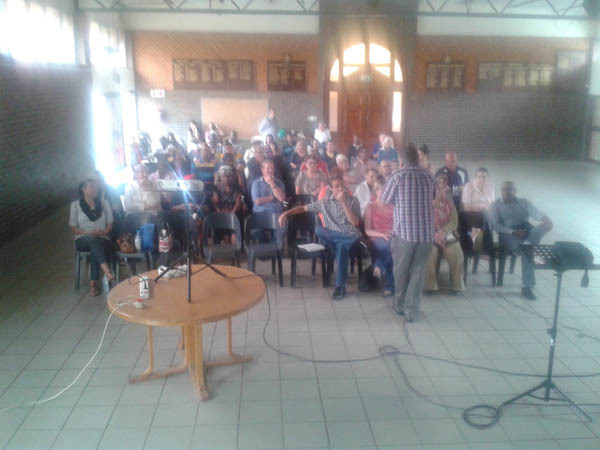 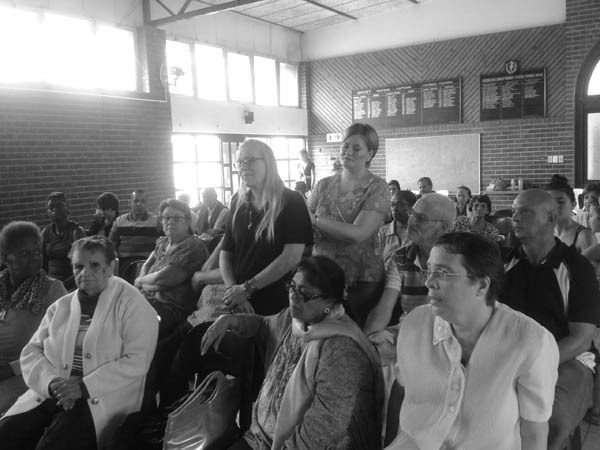 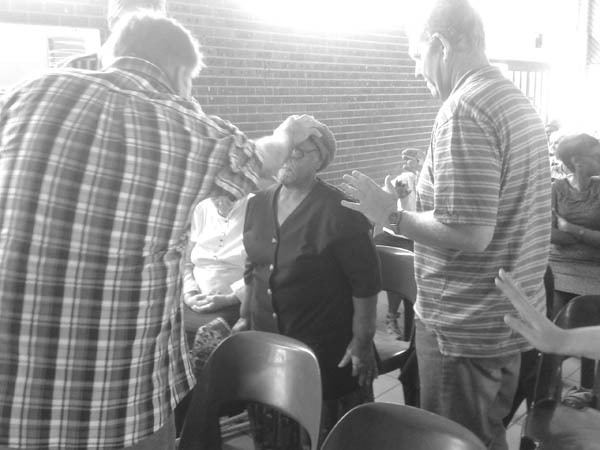 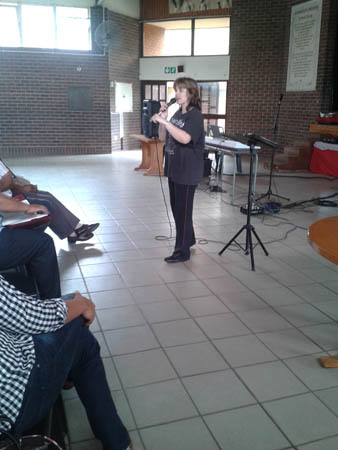 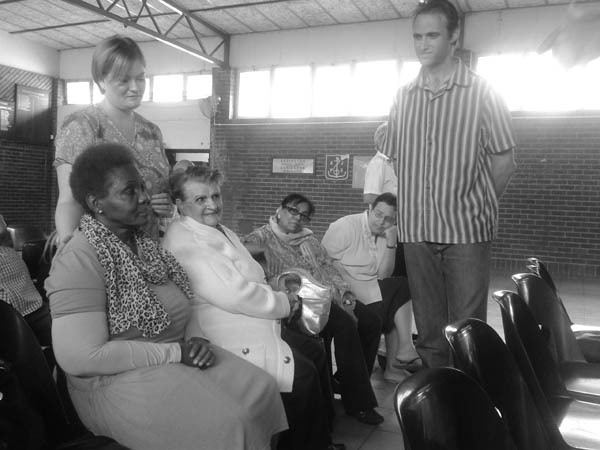 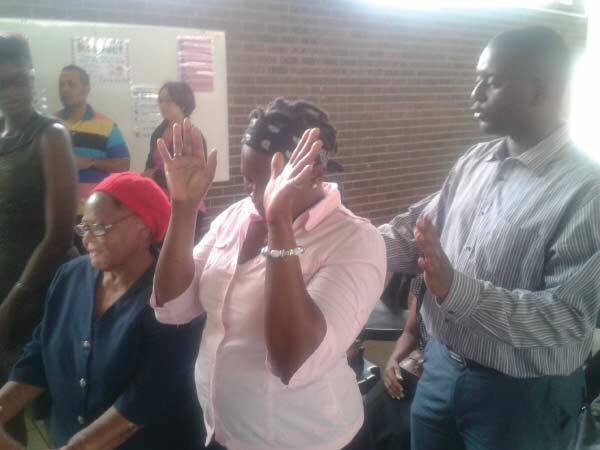 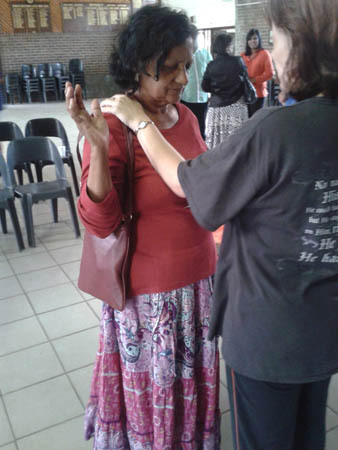 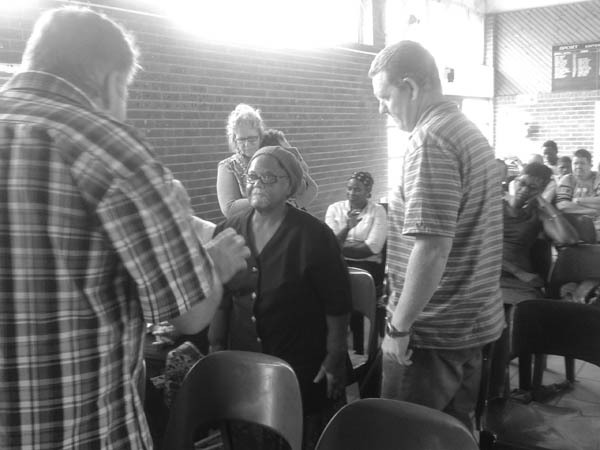 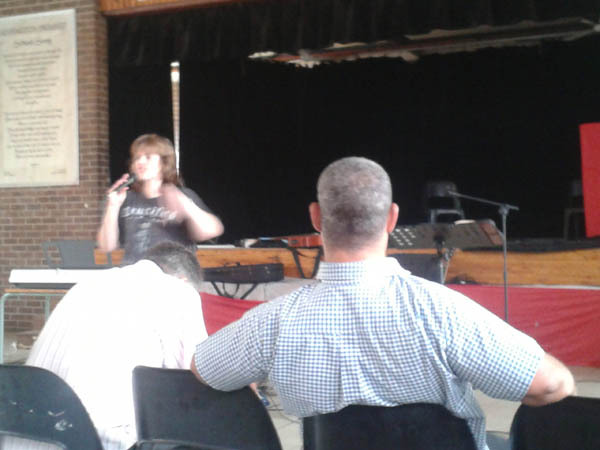 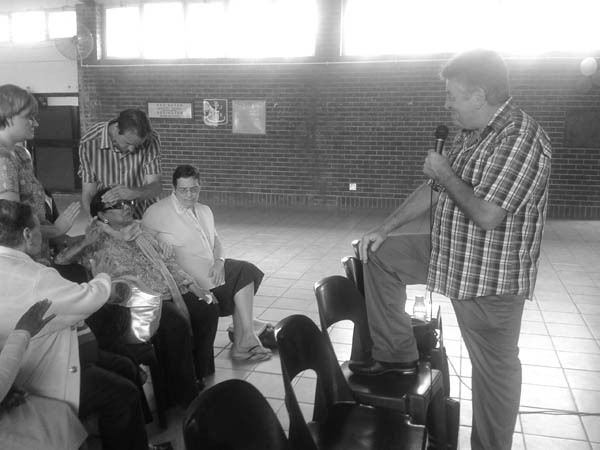 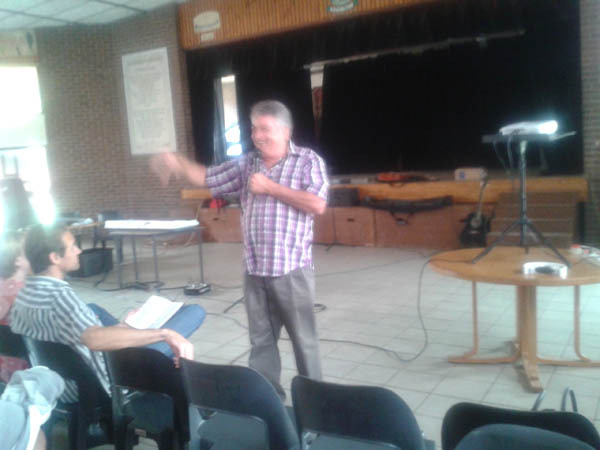 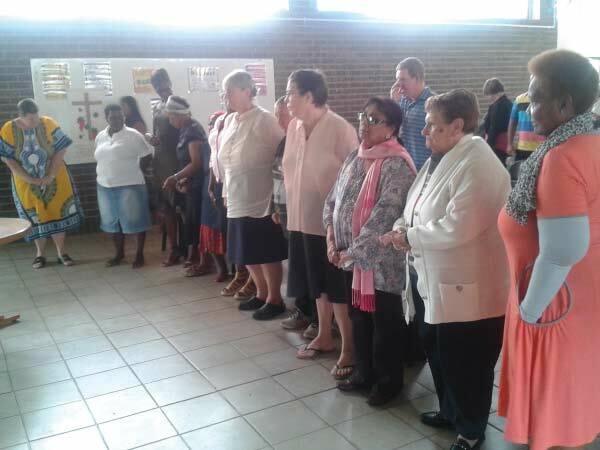 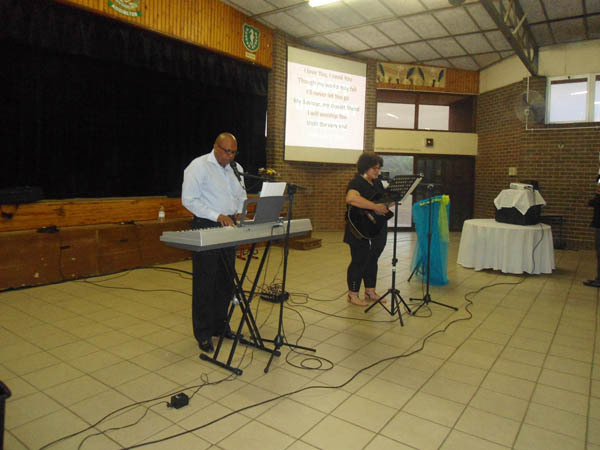 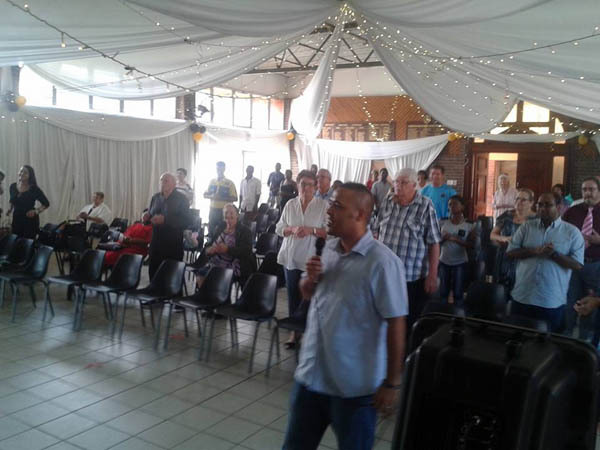 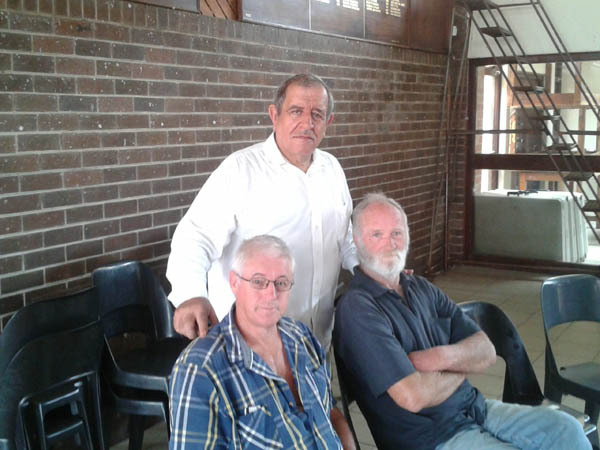 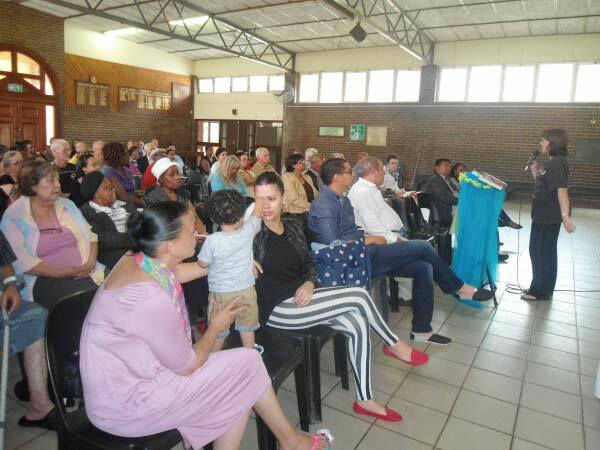 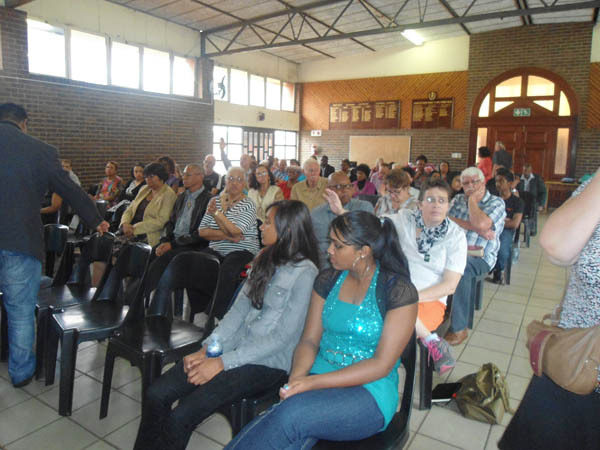 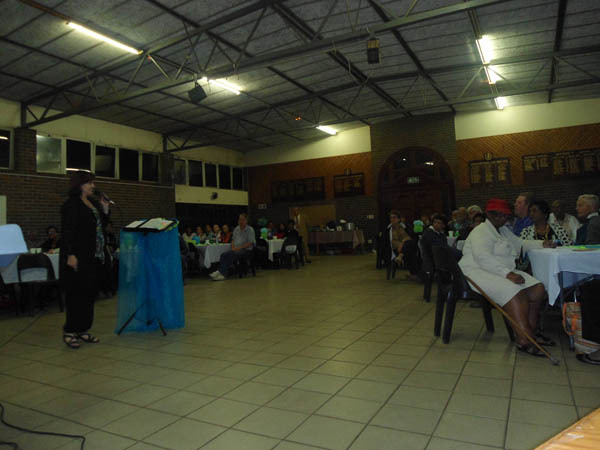 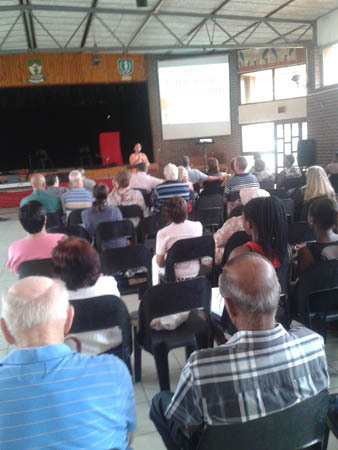 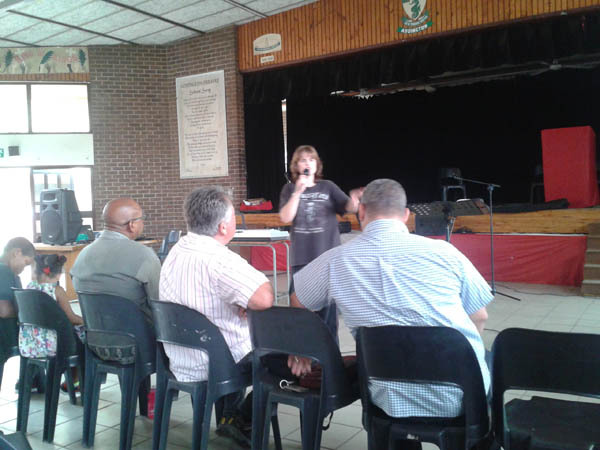 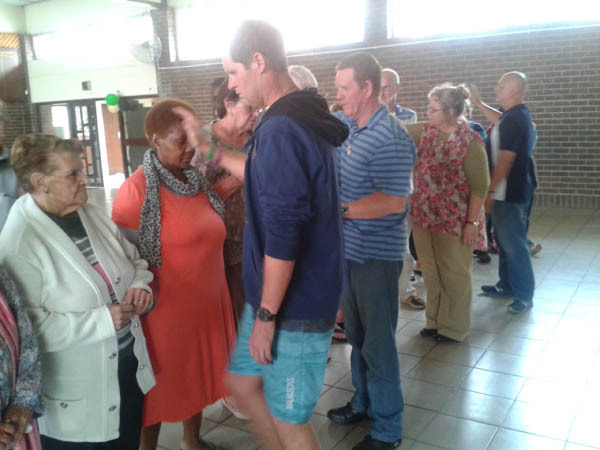 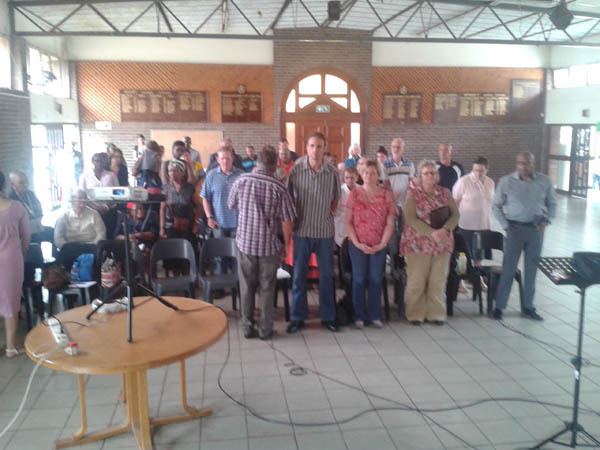 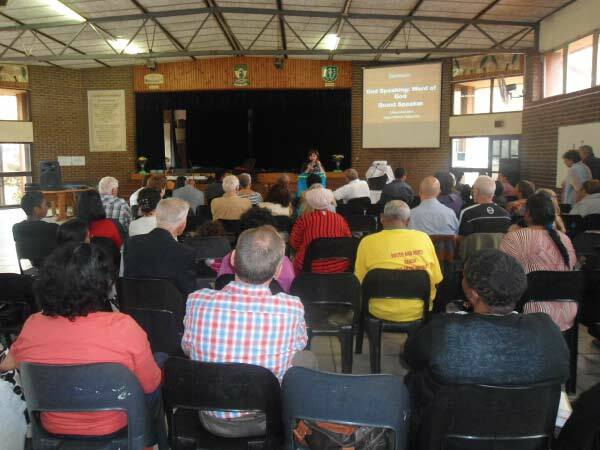 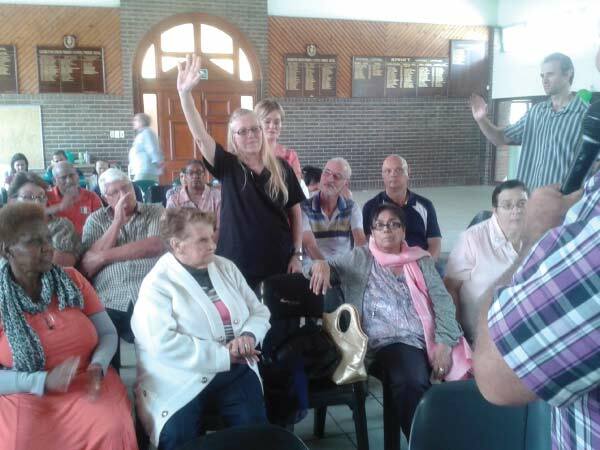 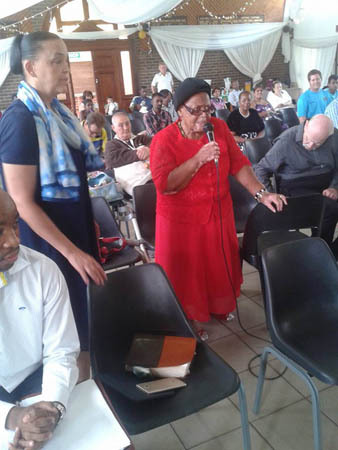 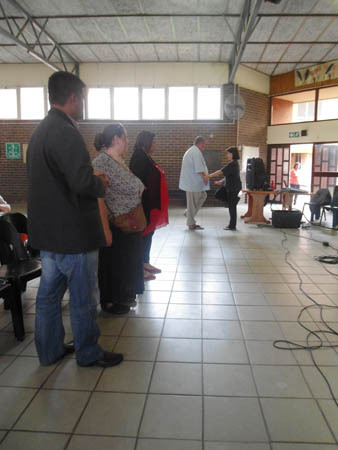 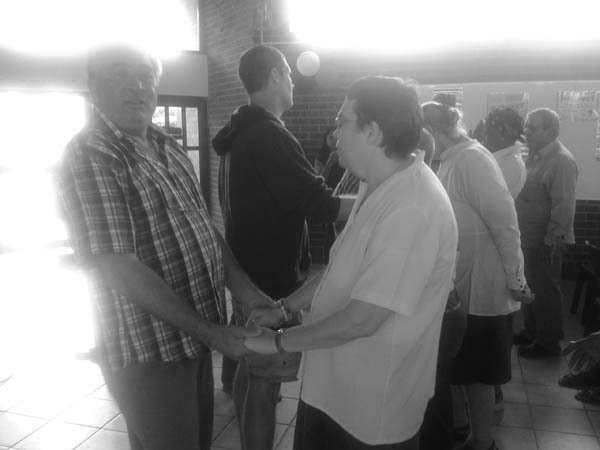 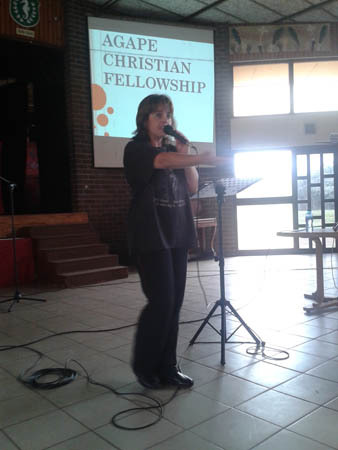 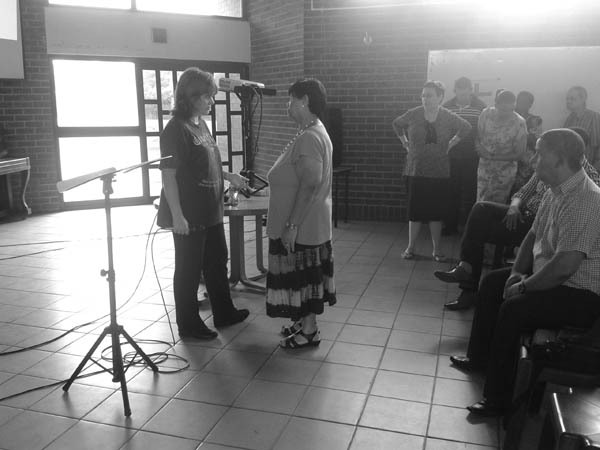 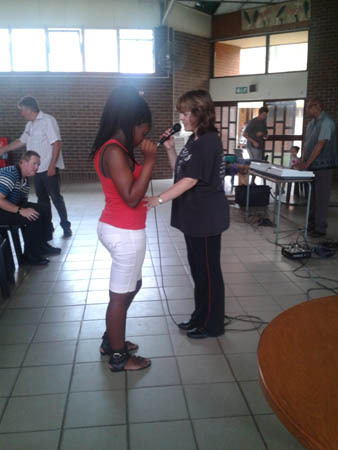 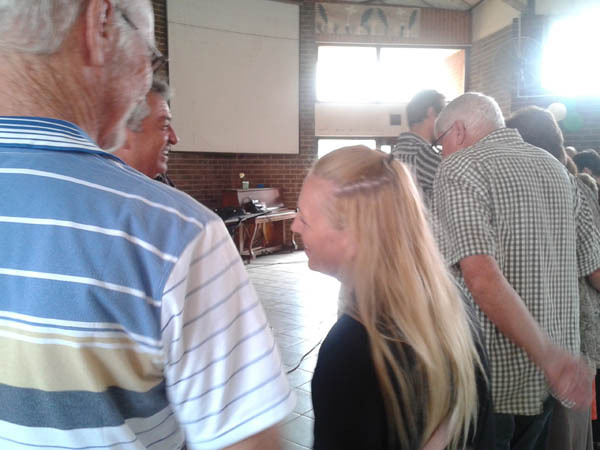 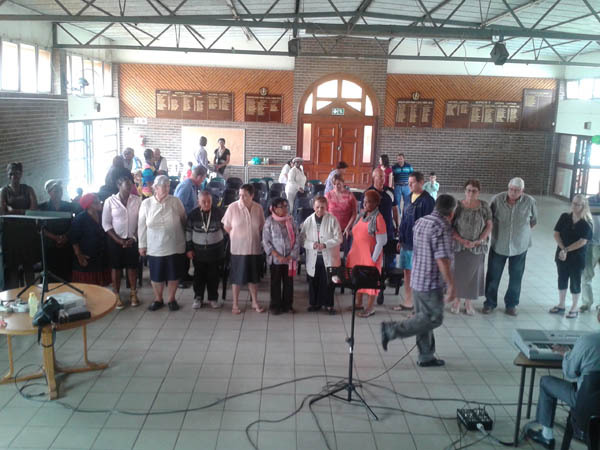 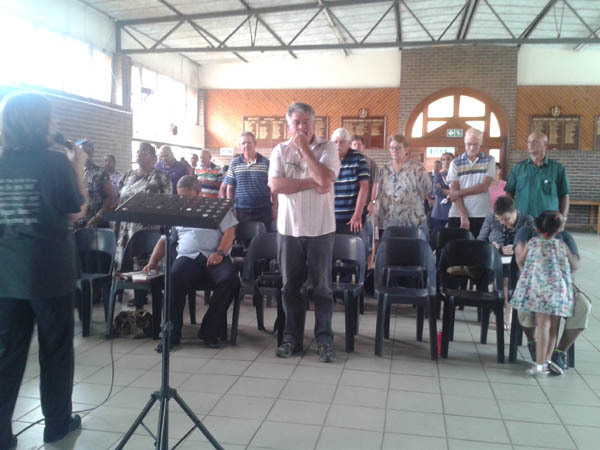 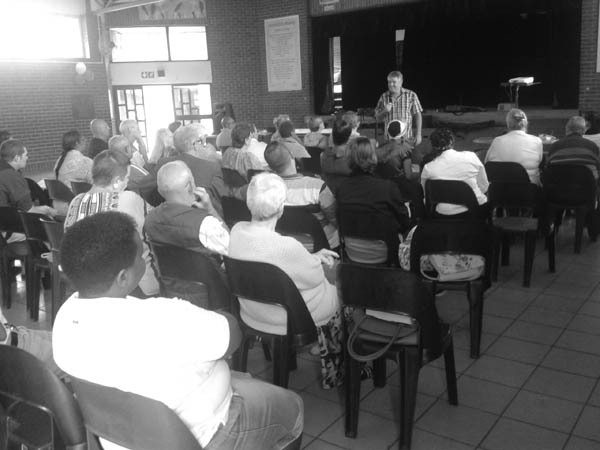 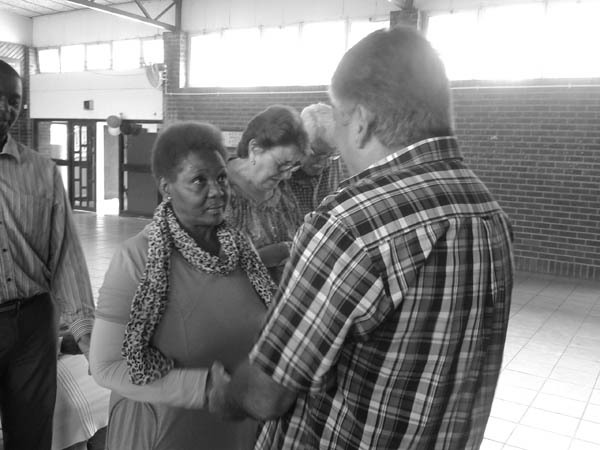 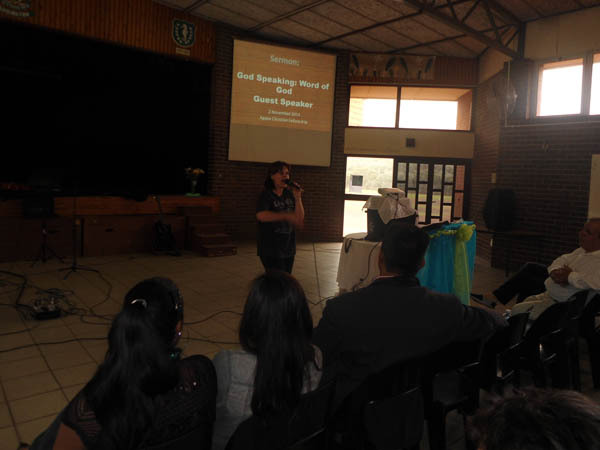 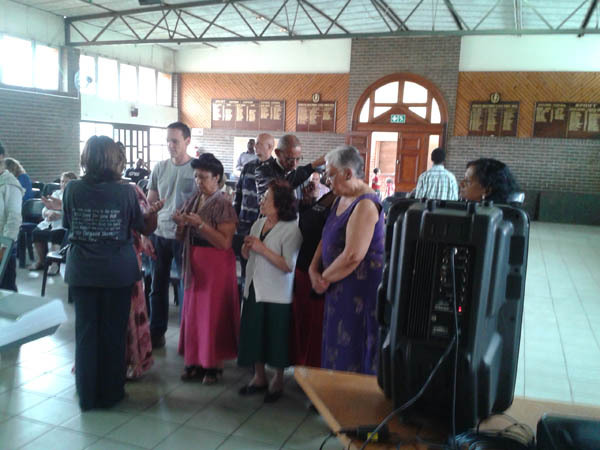 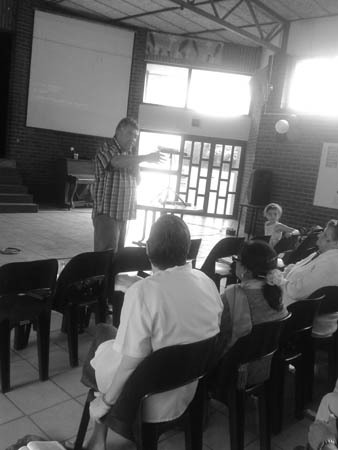 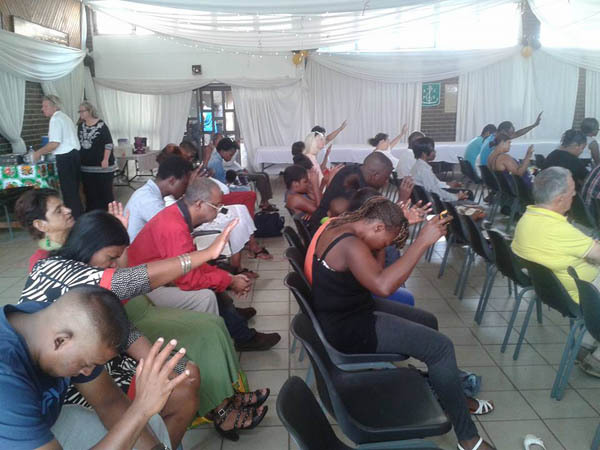 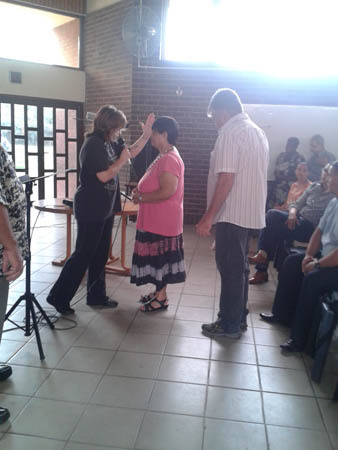 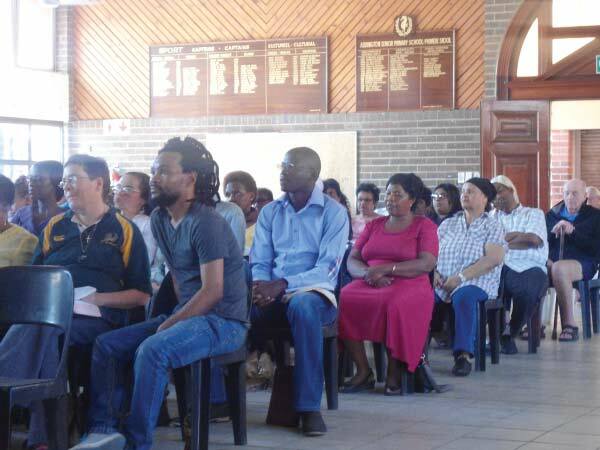 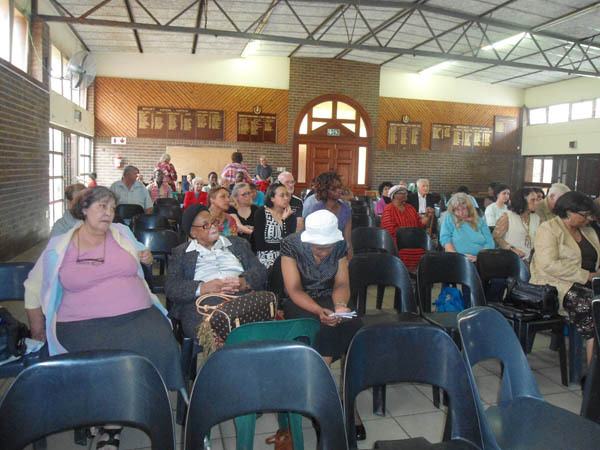 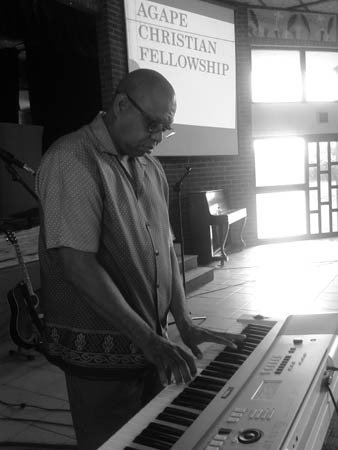 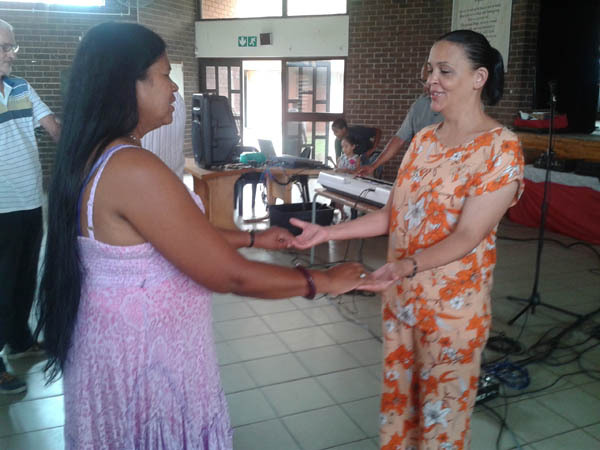 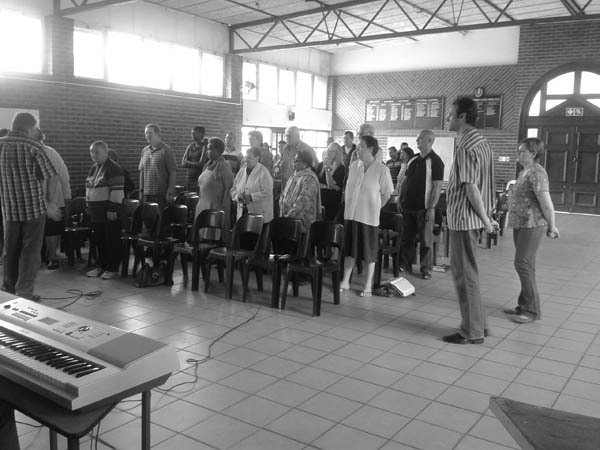 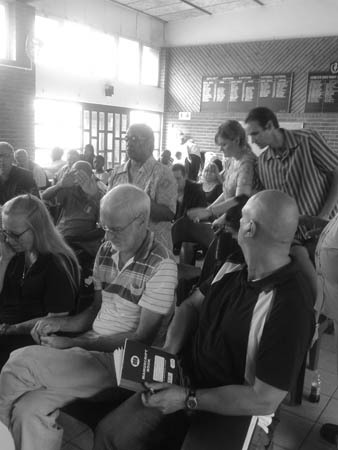 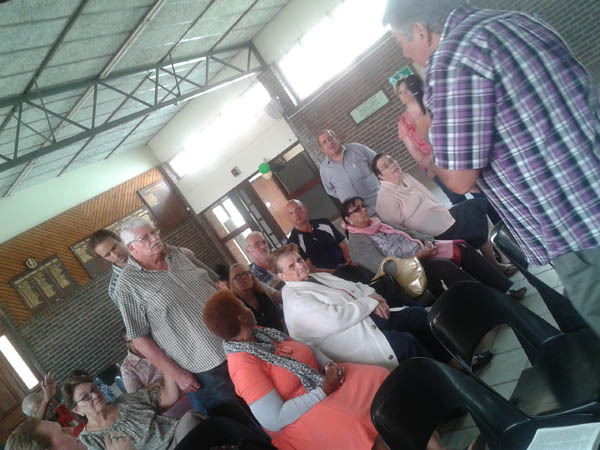 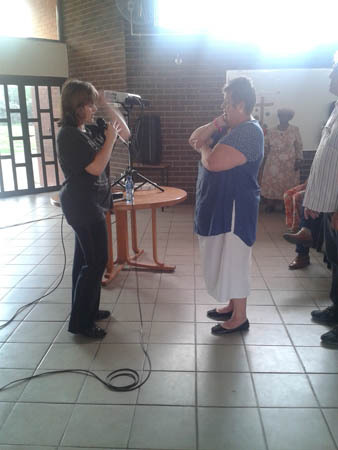 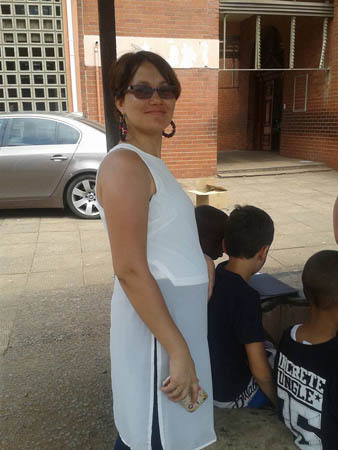 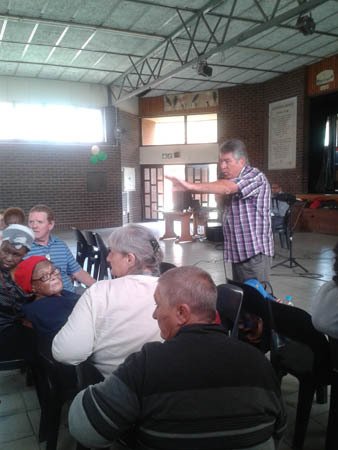 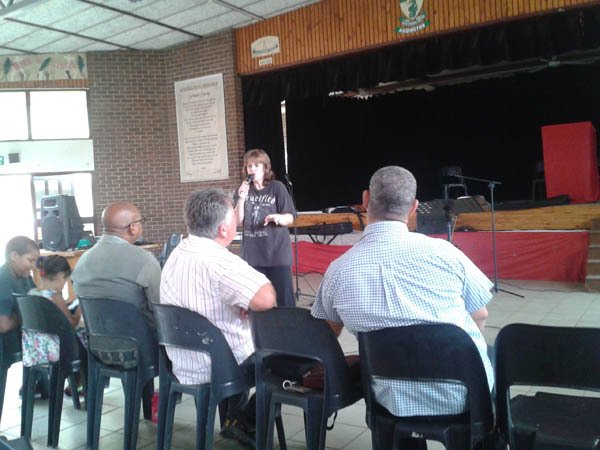 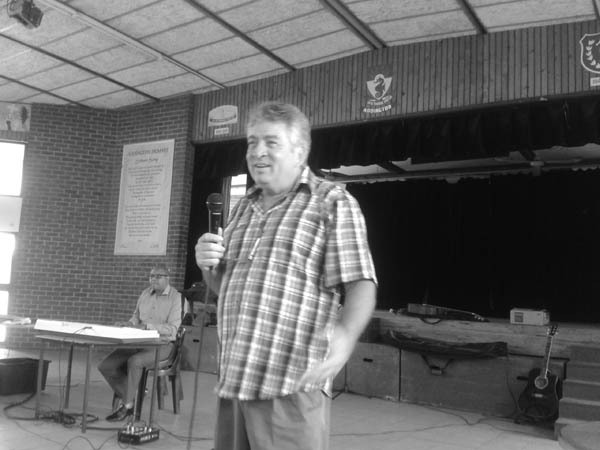 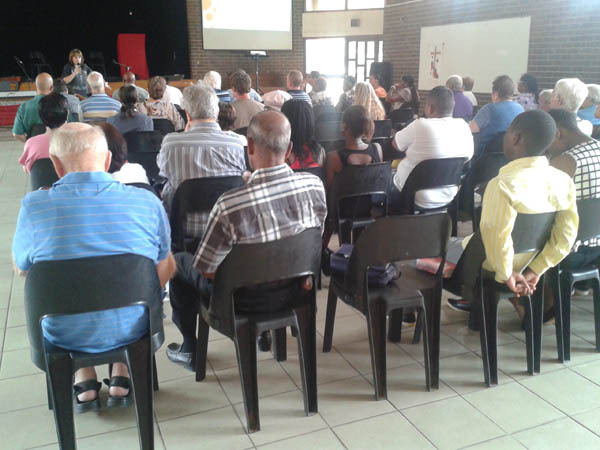 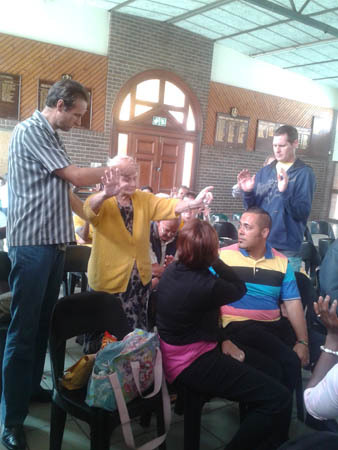 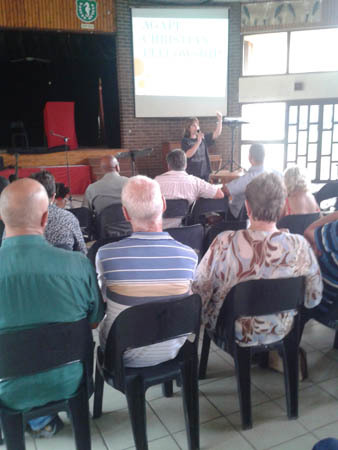 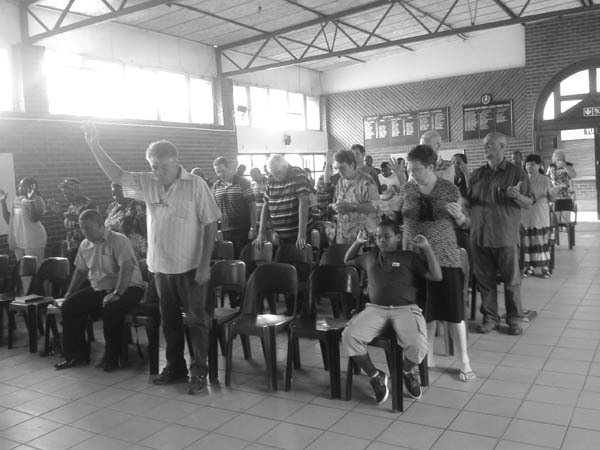 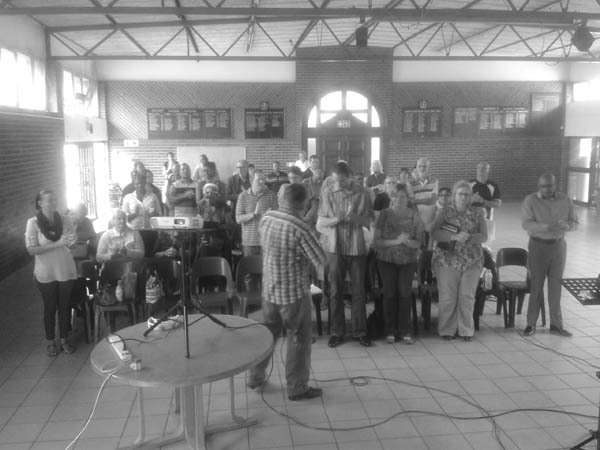 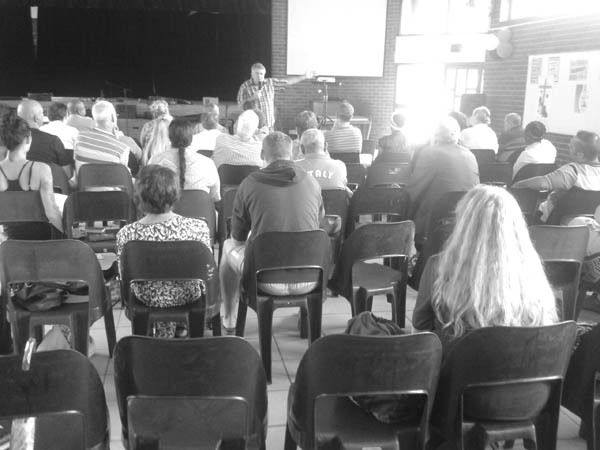 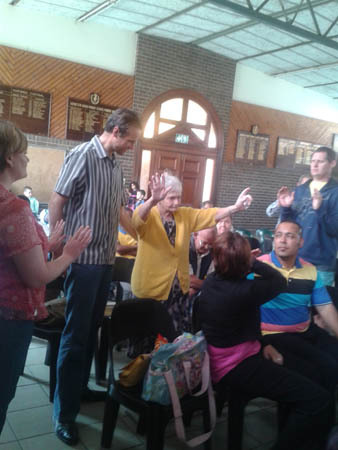 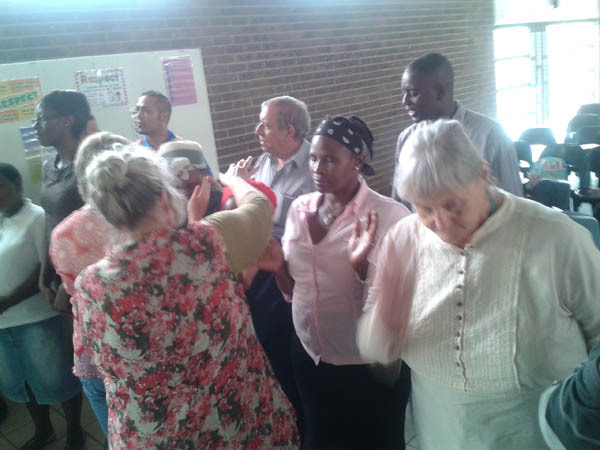 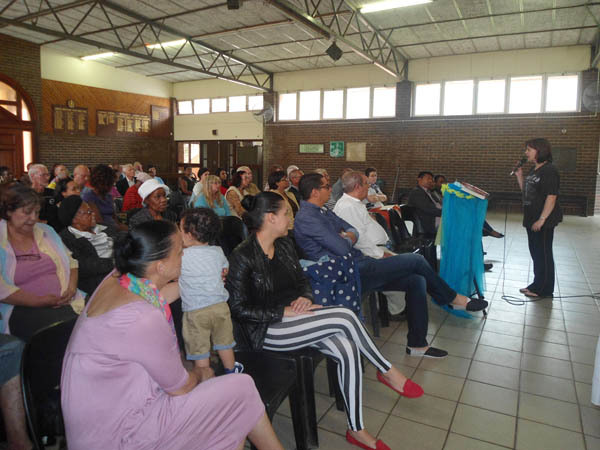 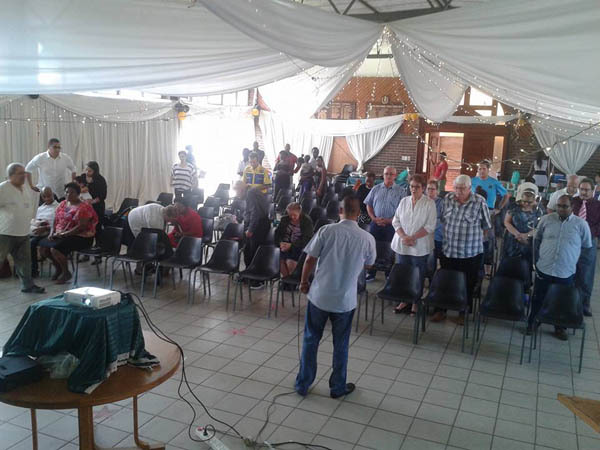 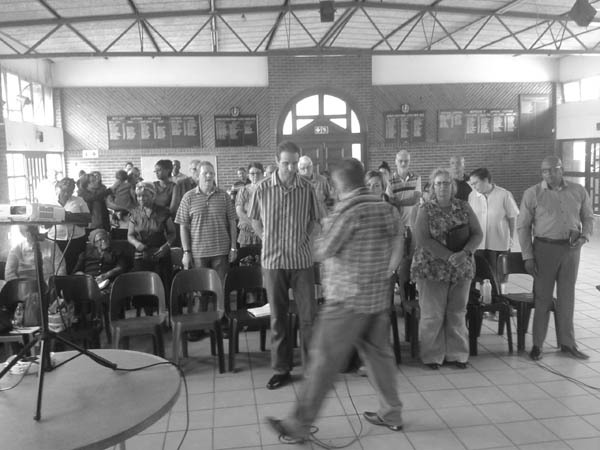 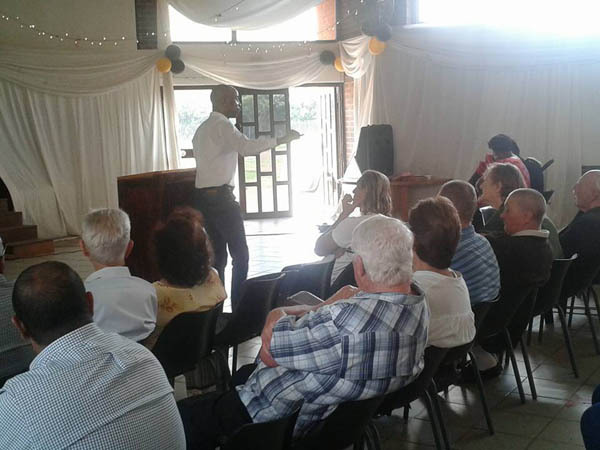 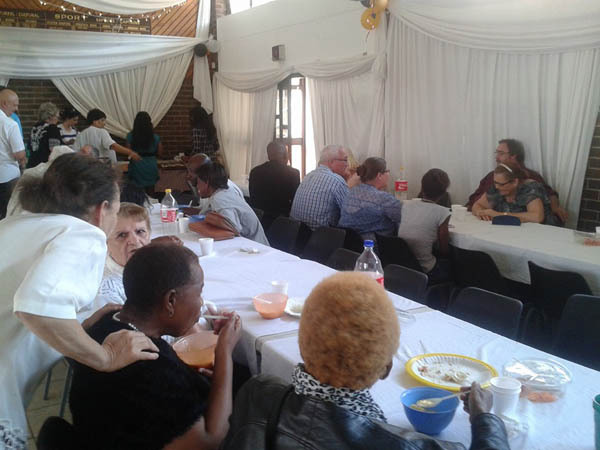 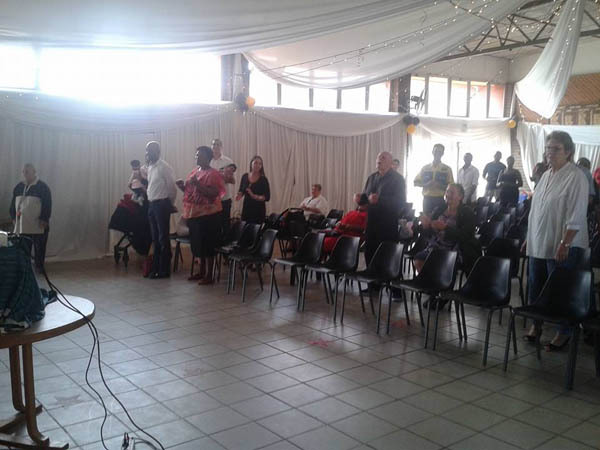 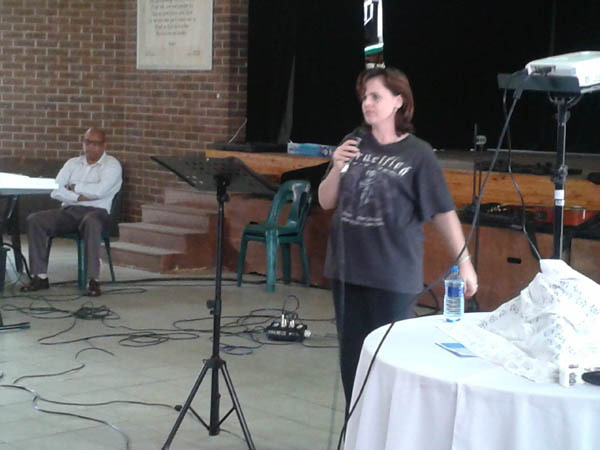 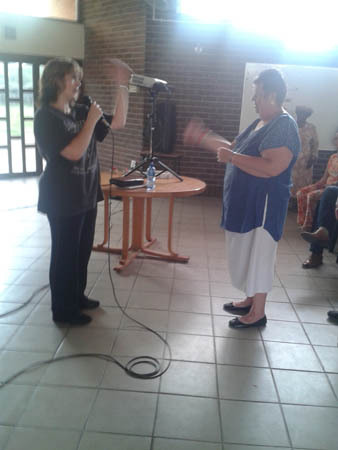 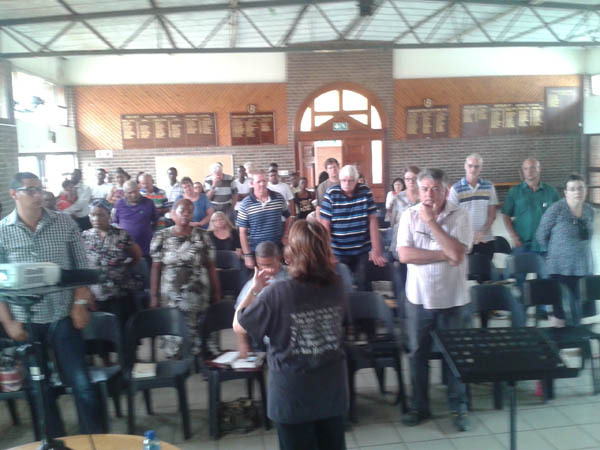 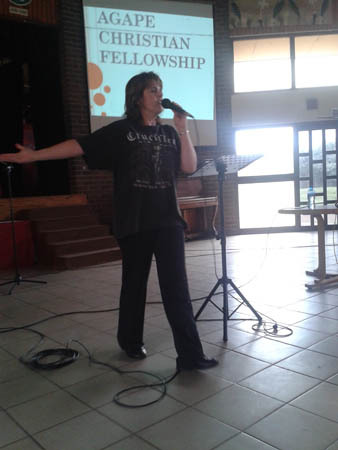 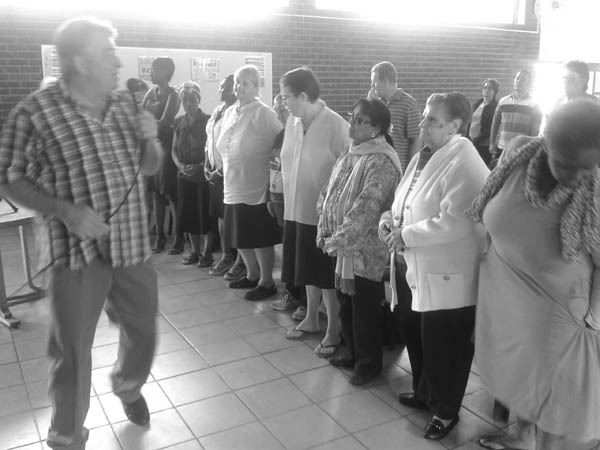 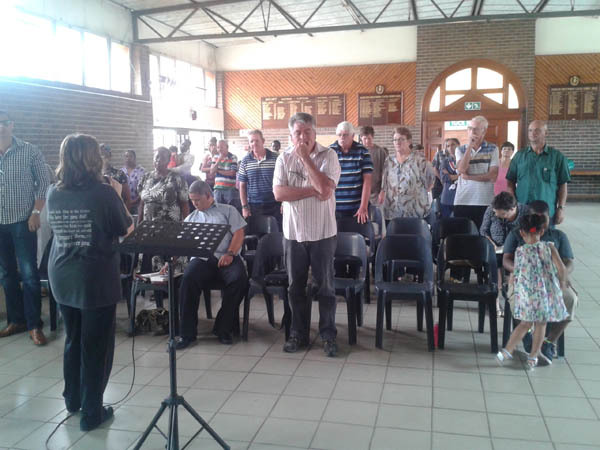 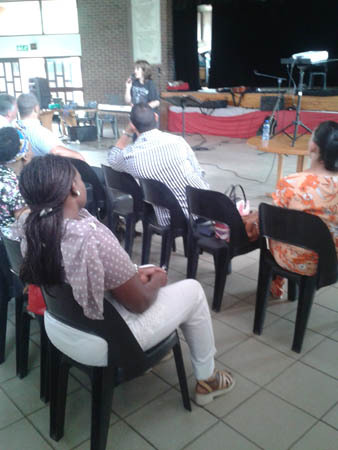 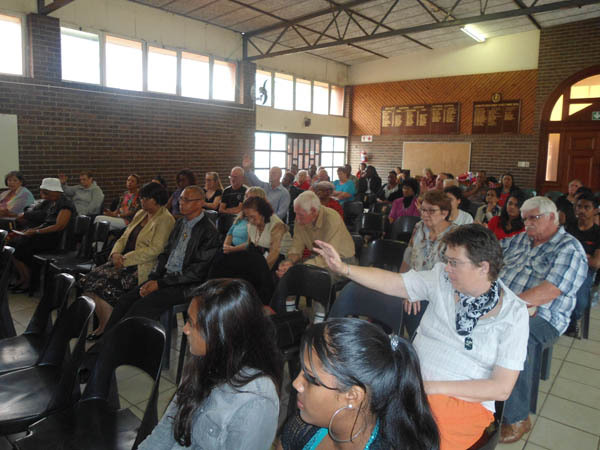 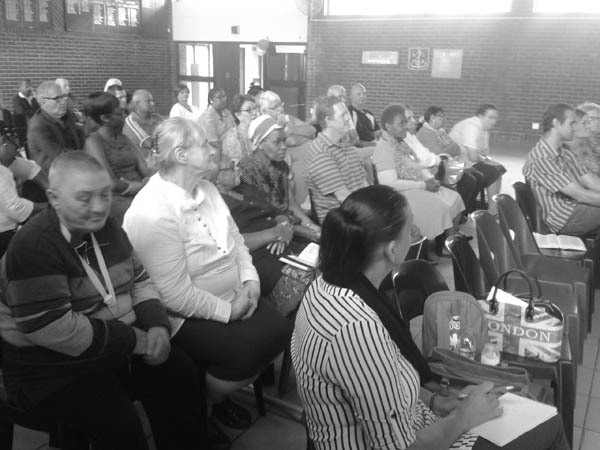 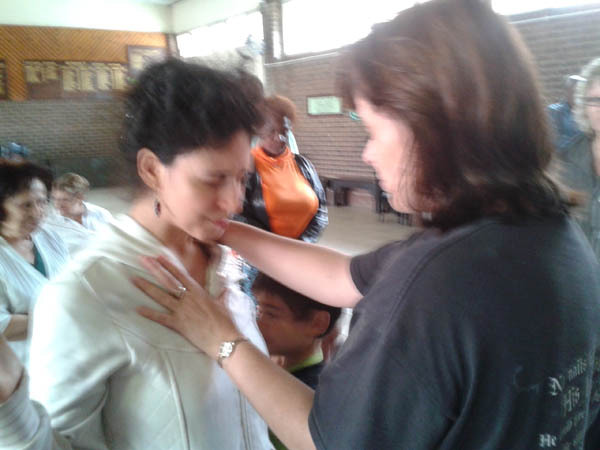 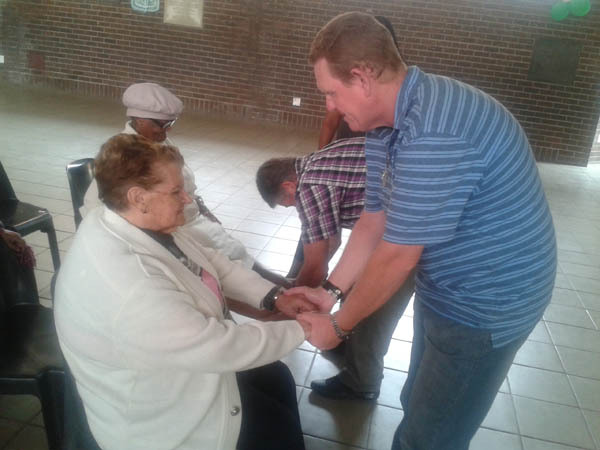 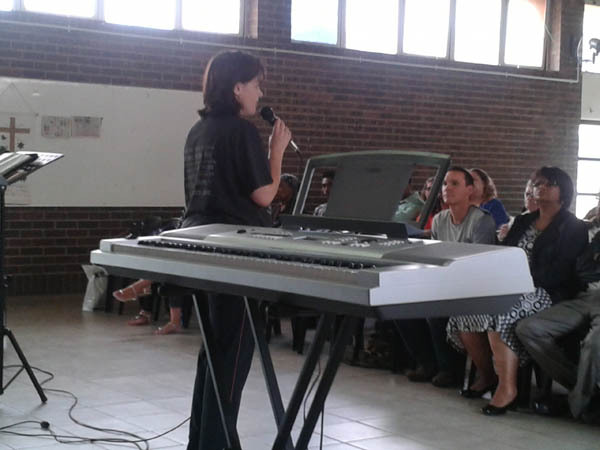 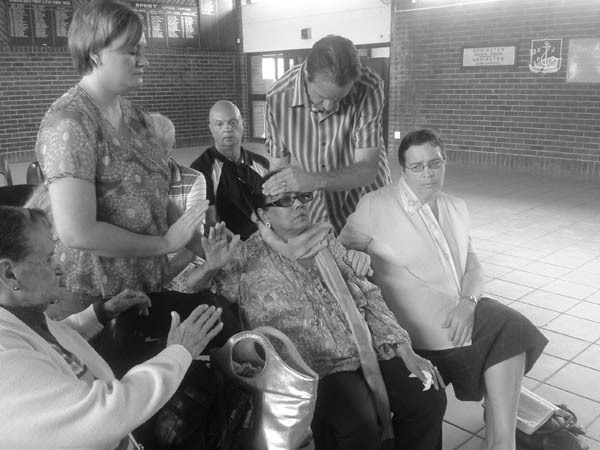 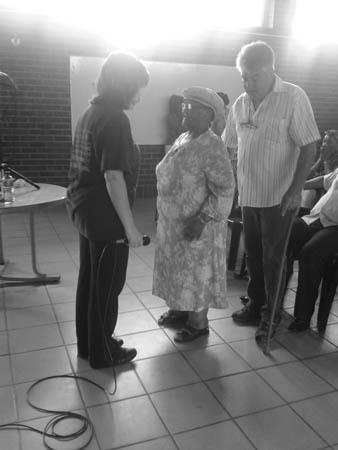 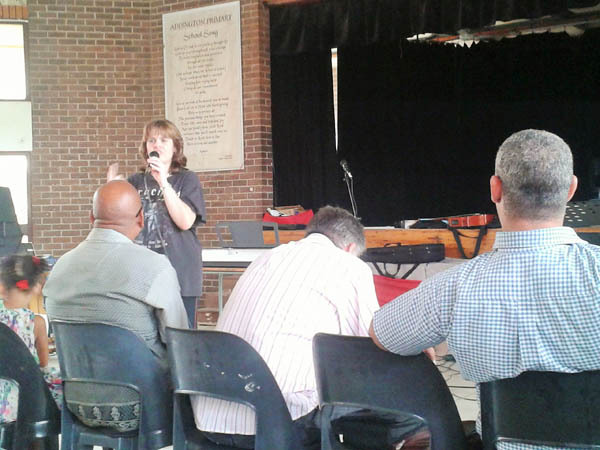 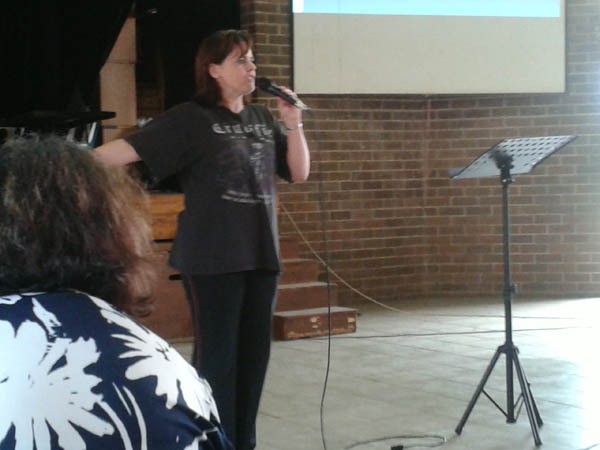 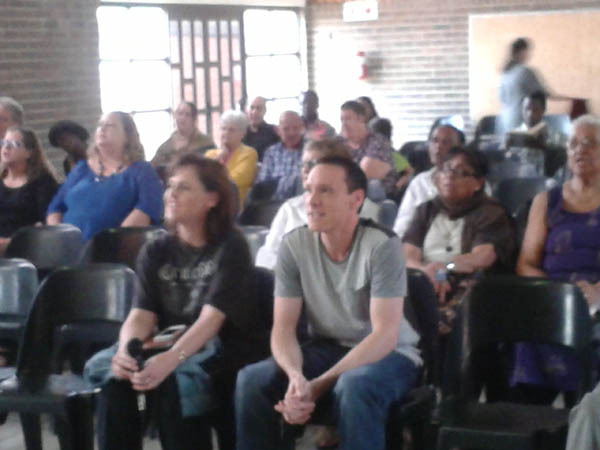 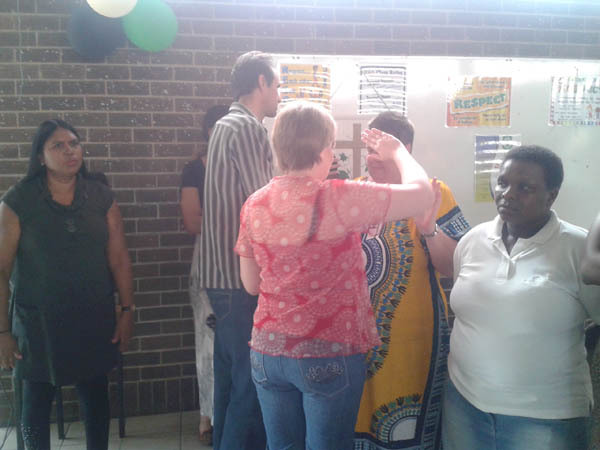 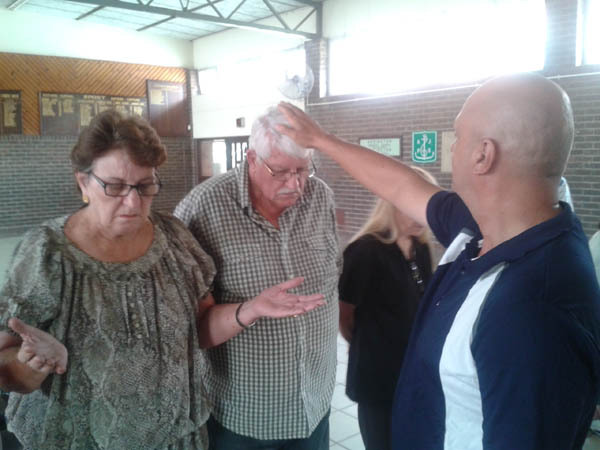 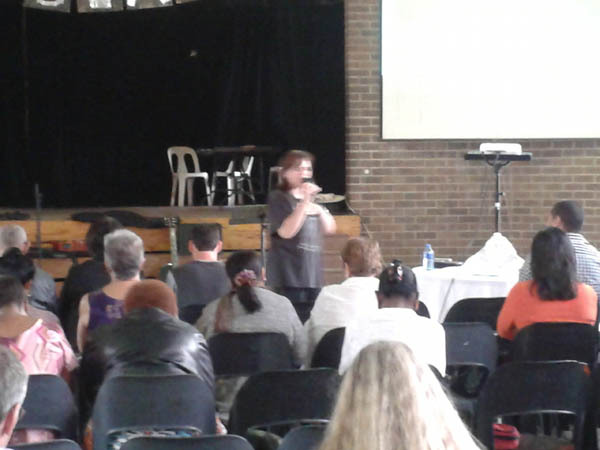 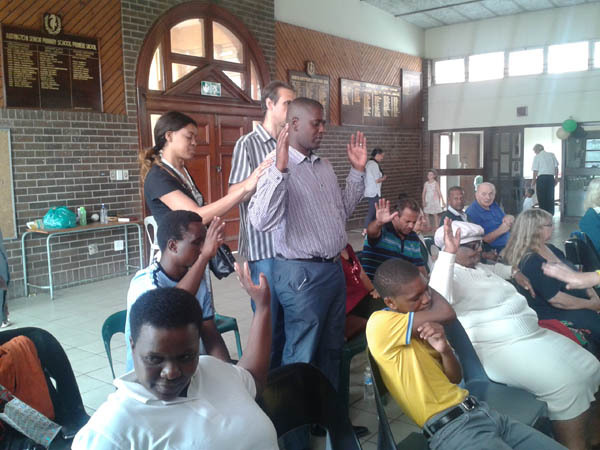 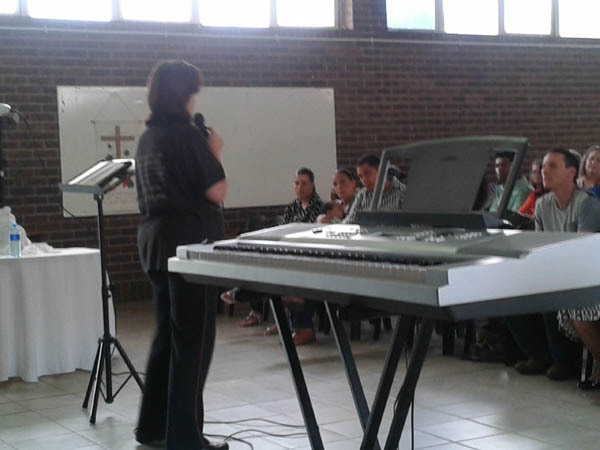 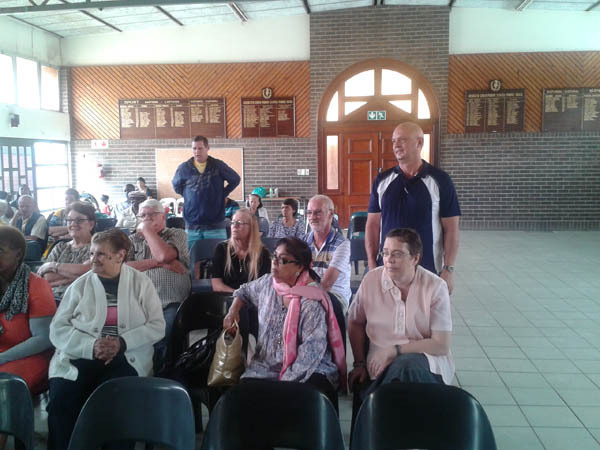 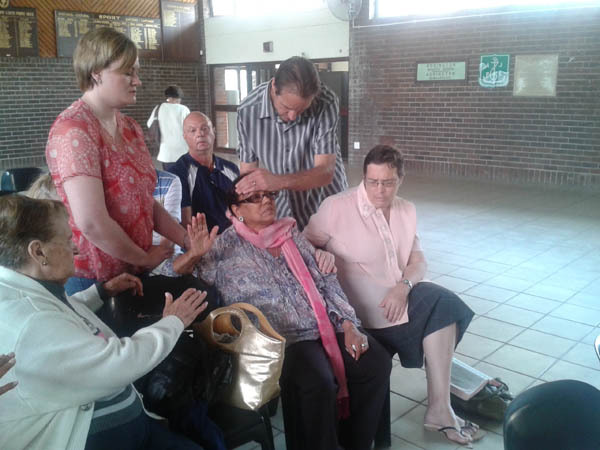 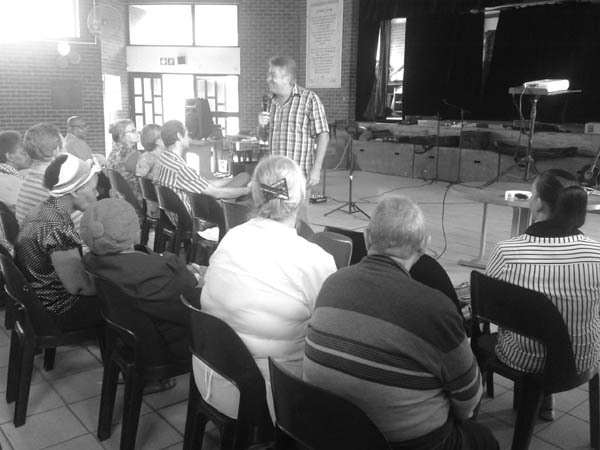 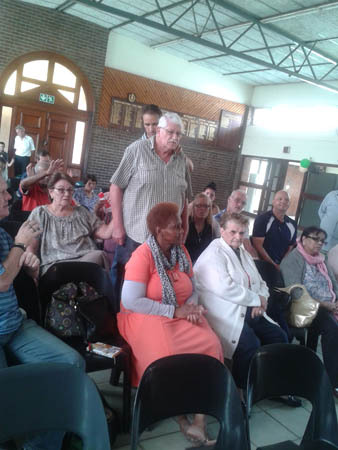 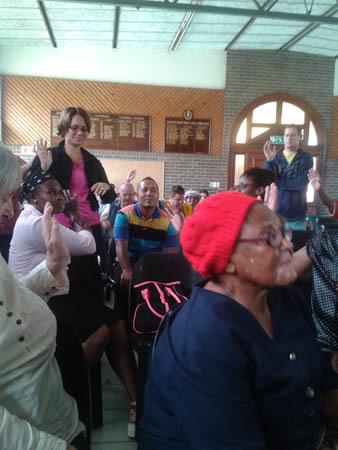 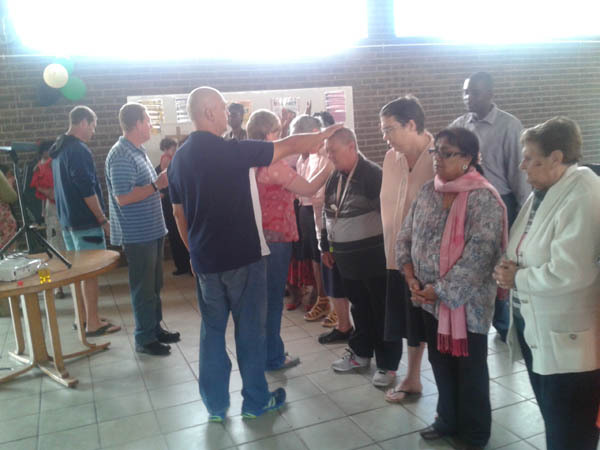 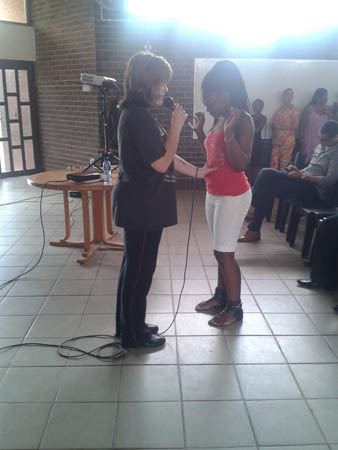 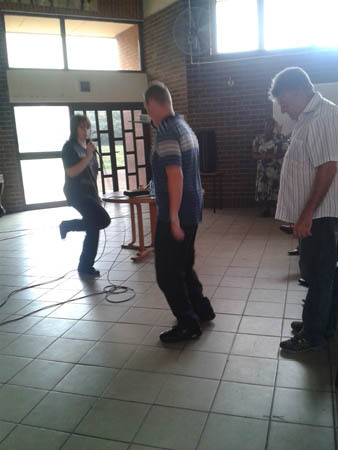 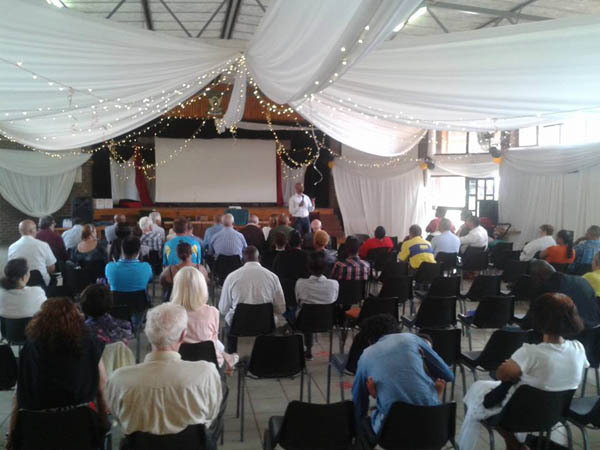 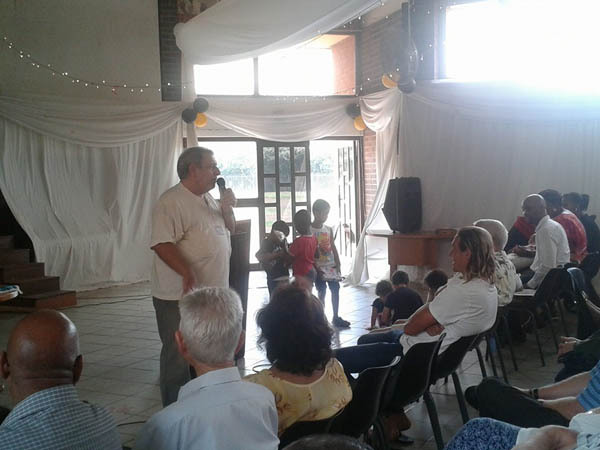 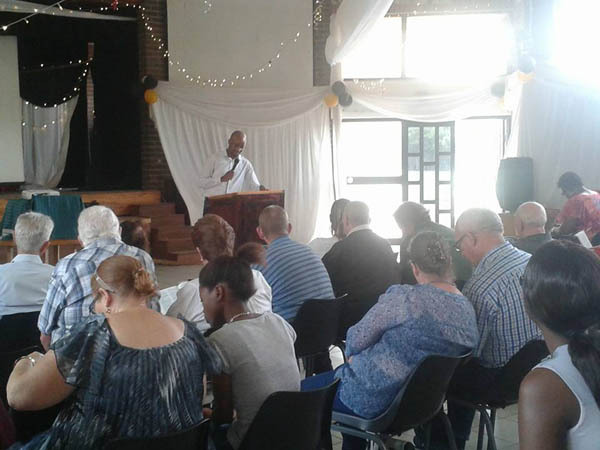 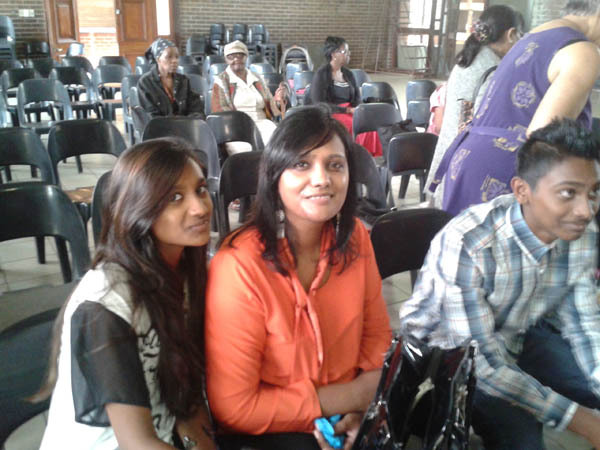 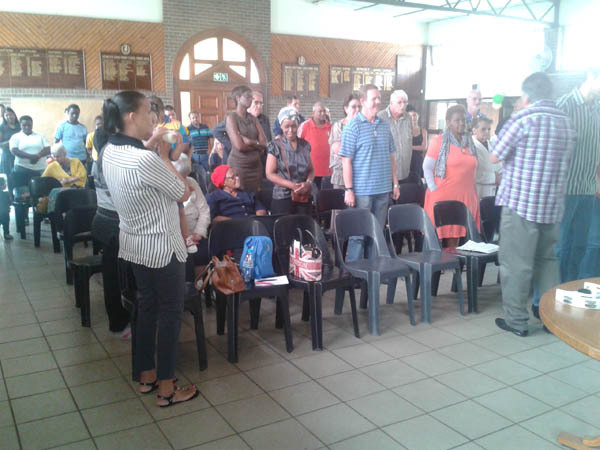 Every Saturday from 2:30pm – Evangelising the whole of Durban, suburb by suburb, going from house to house, to all complexes and flats, placing envelopes each containing an evangelical letter and tracts into the post boxes. 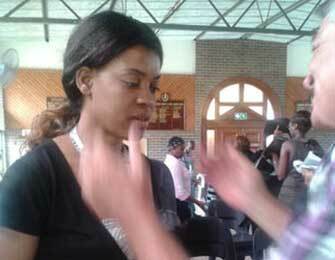 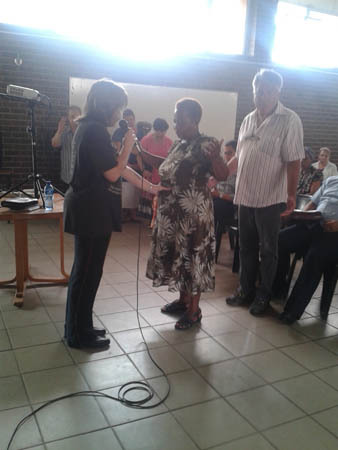 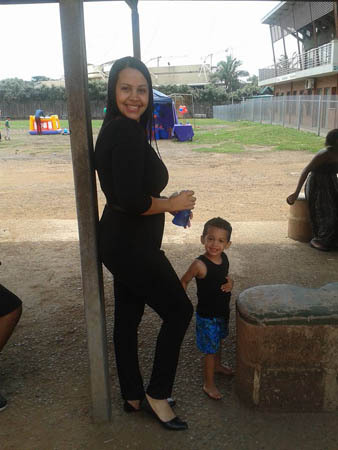 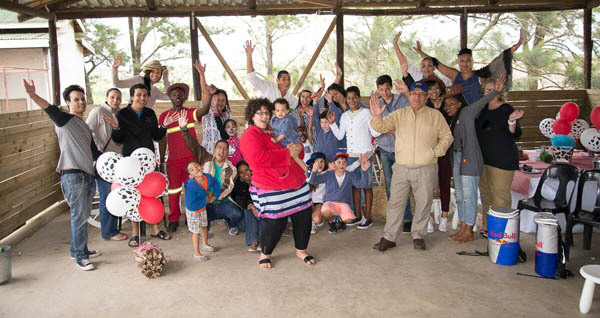 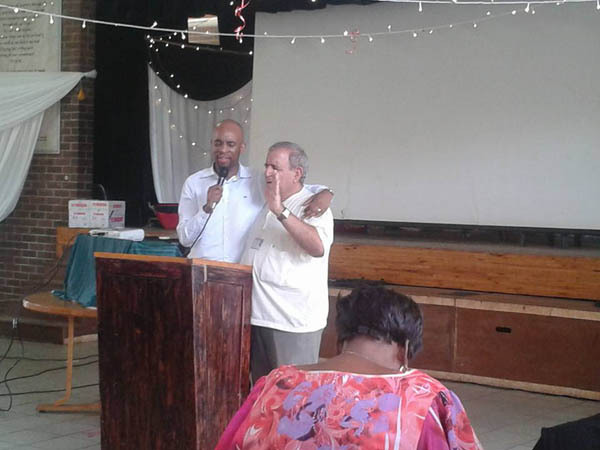 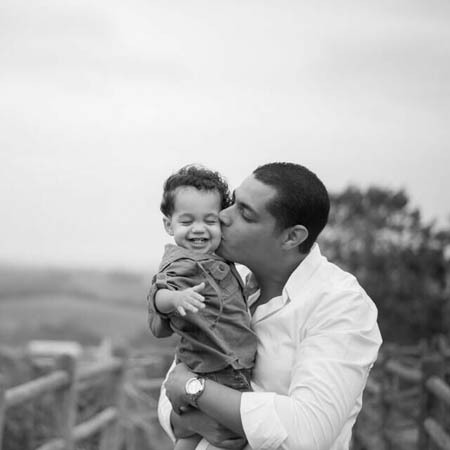 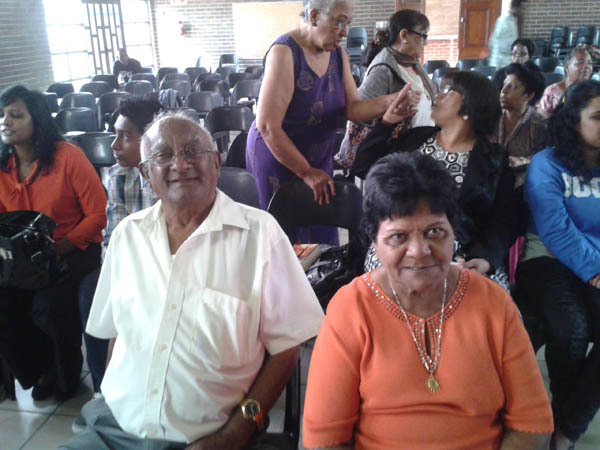 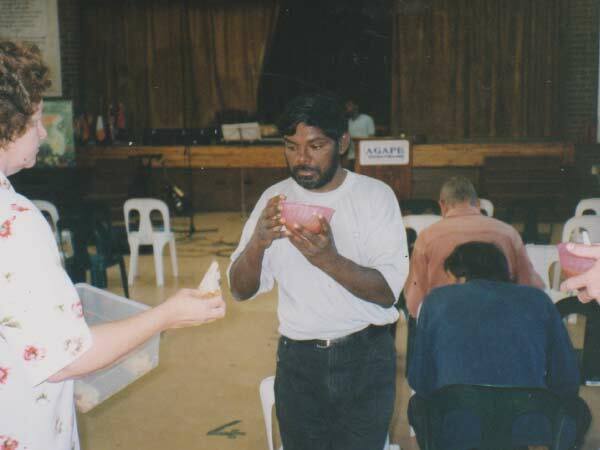 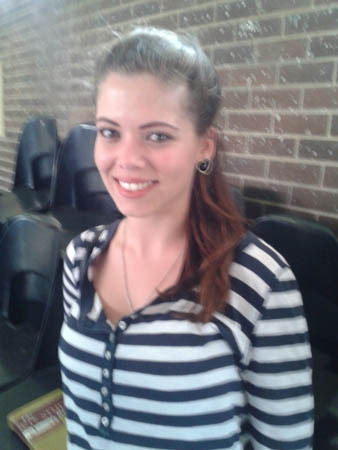 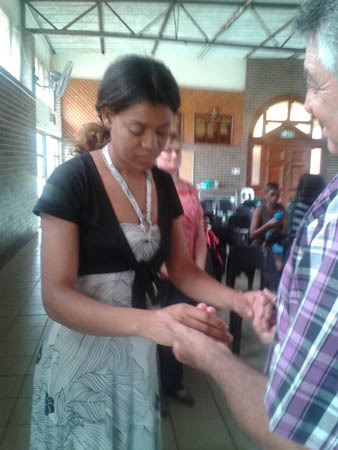 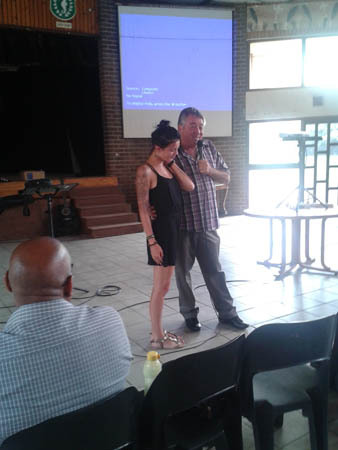 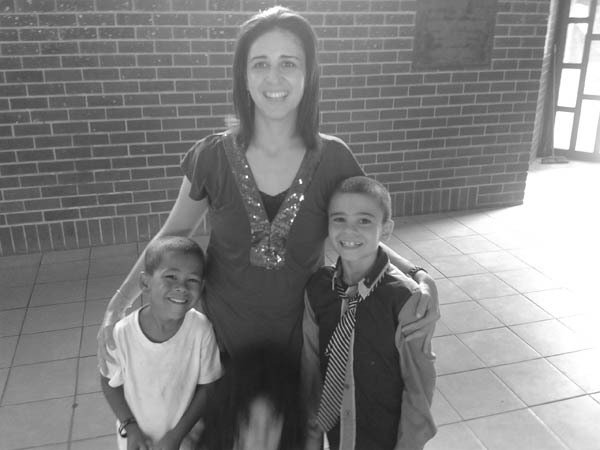 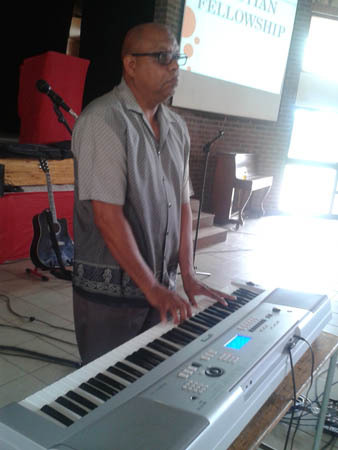 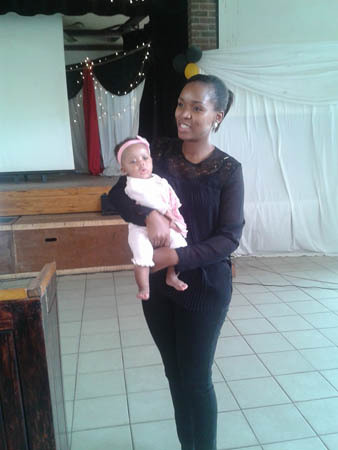 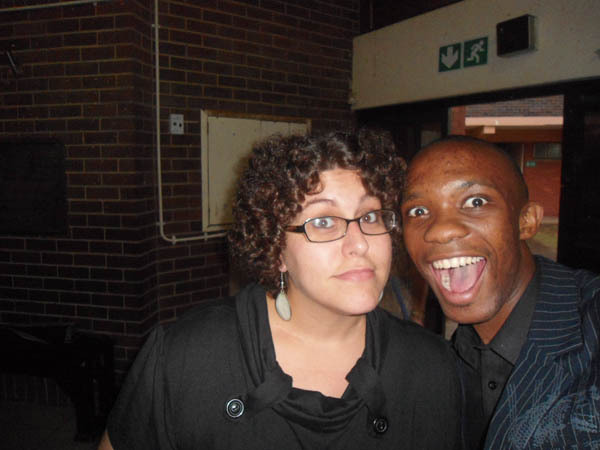 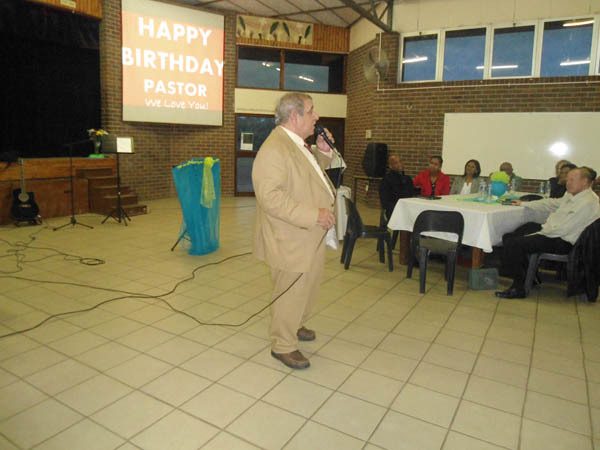 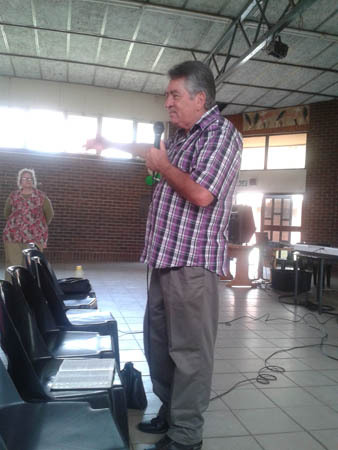 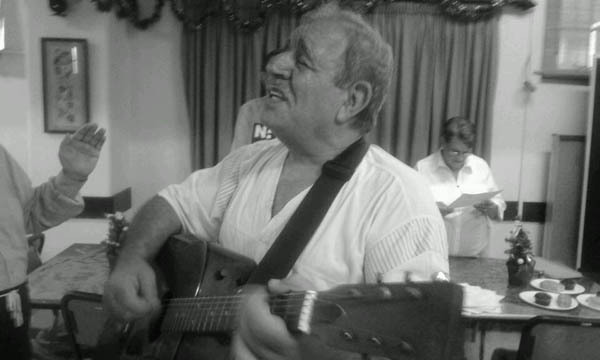 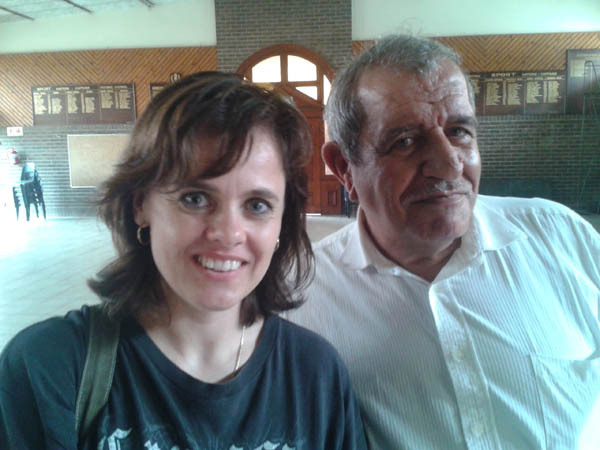 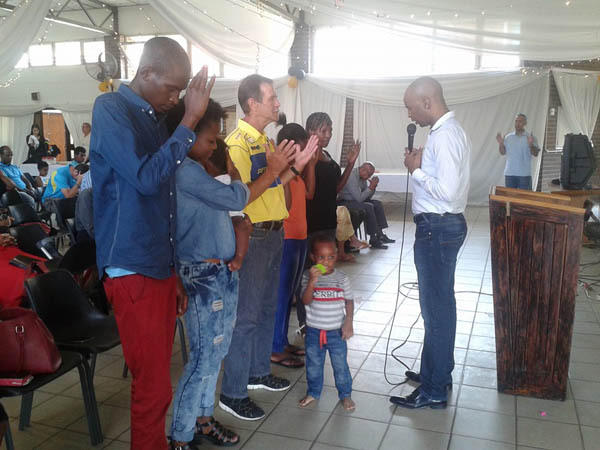 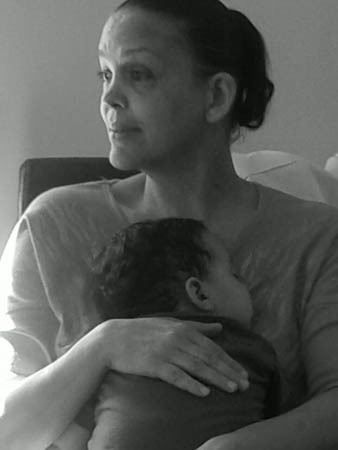 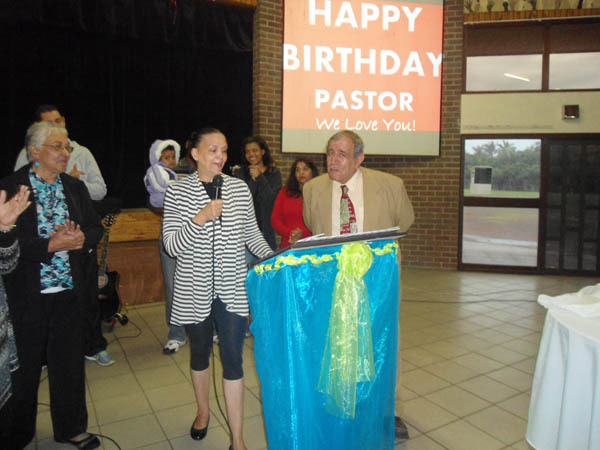 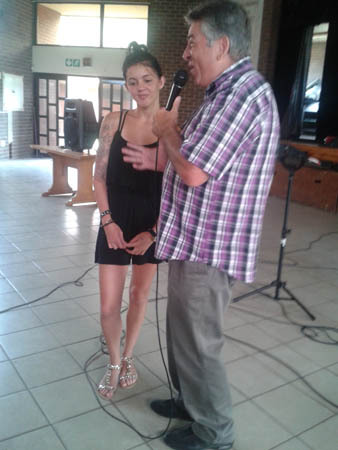 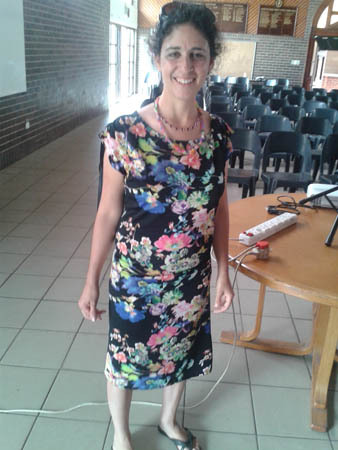 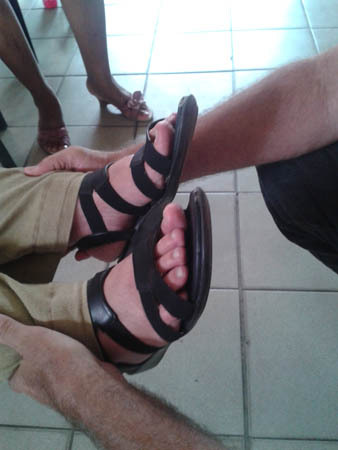 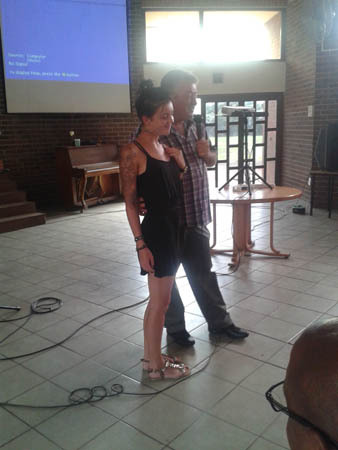 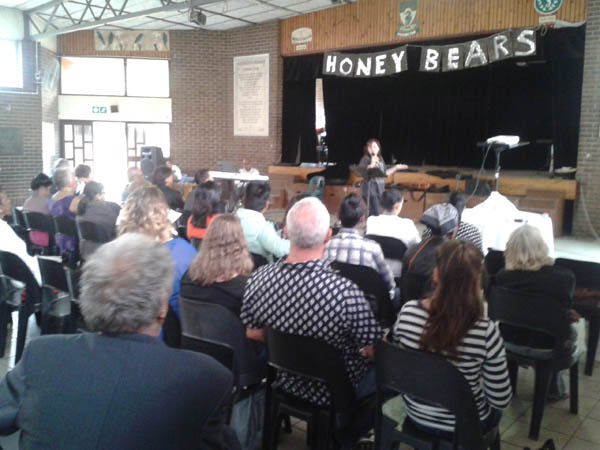 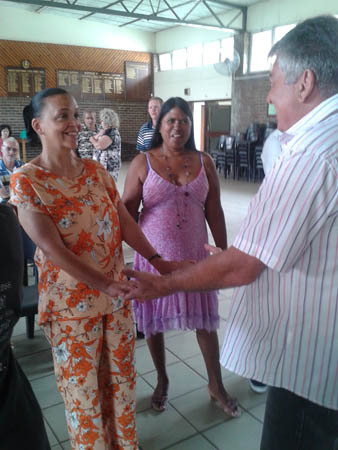 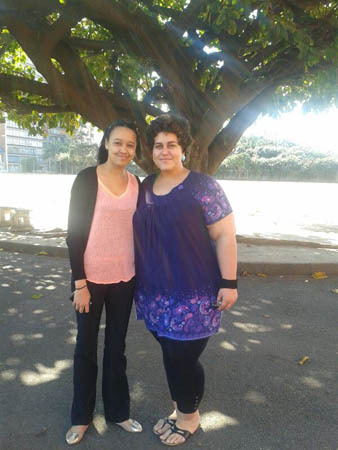 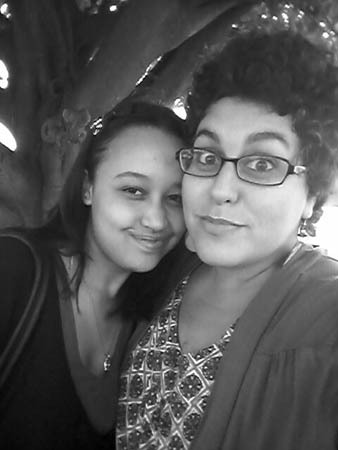 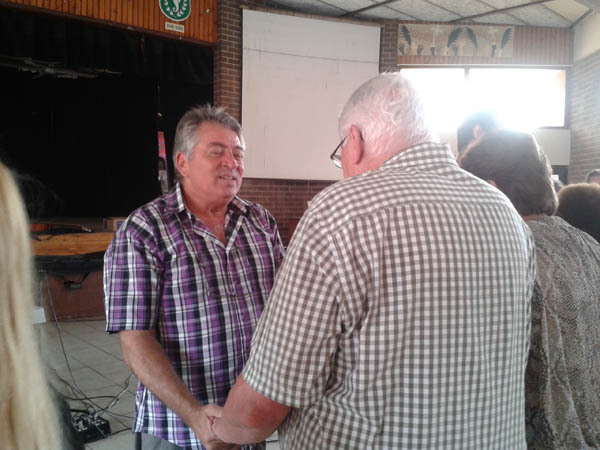 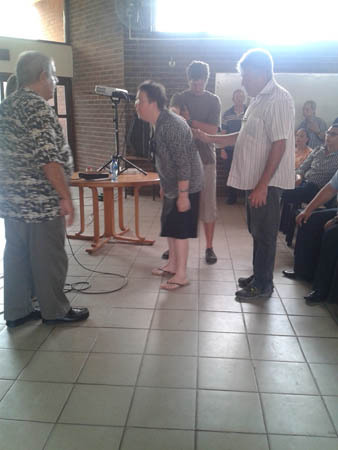 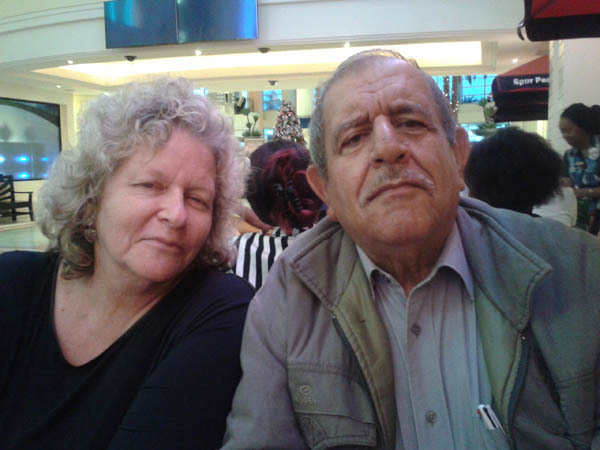 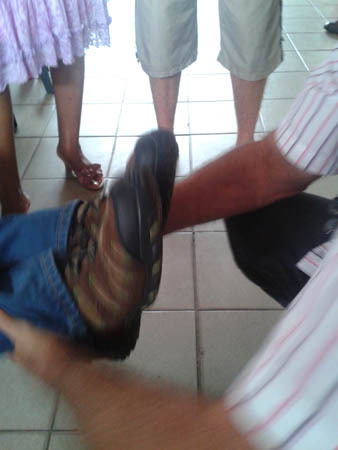 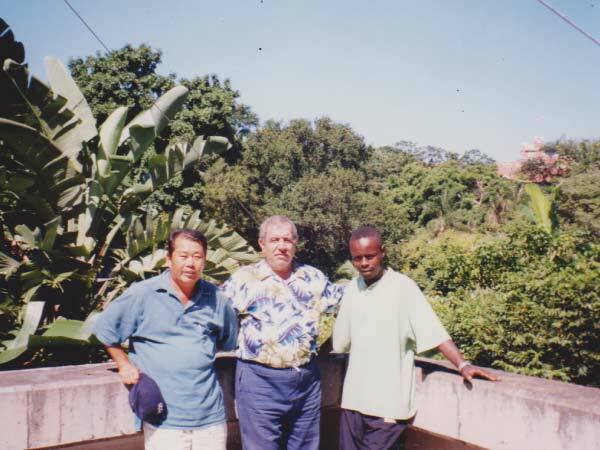 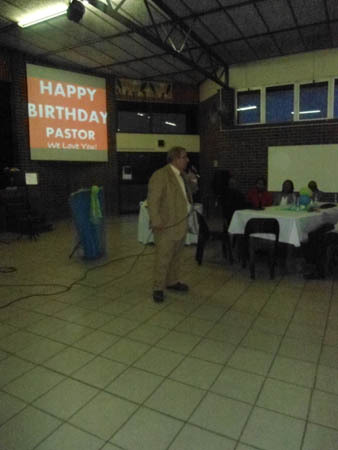 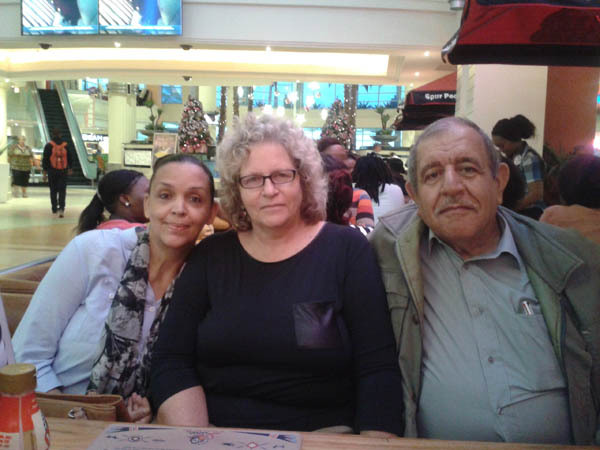 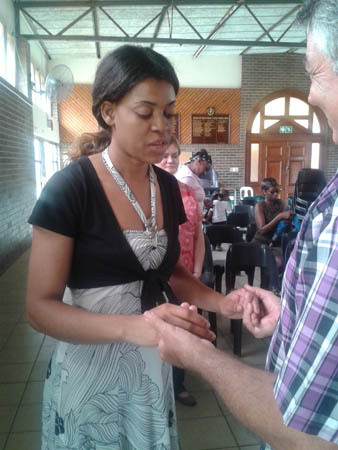 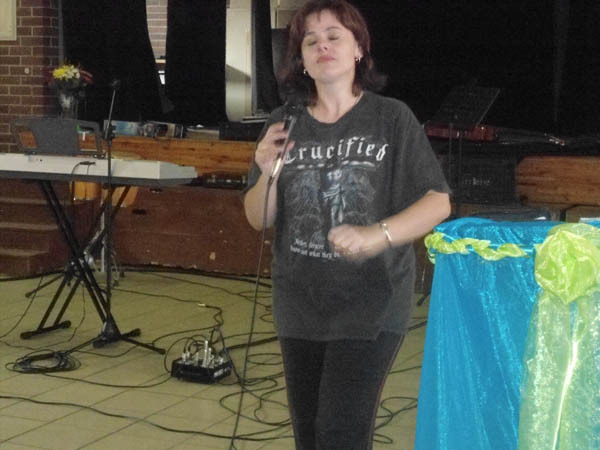 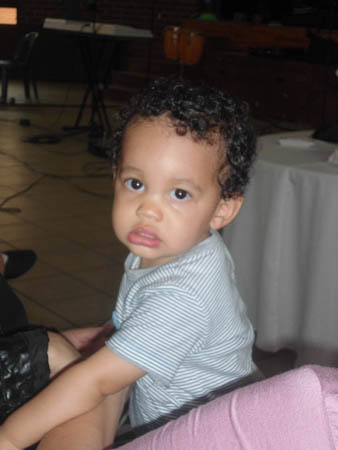 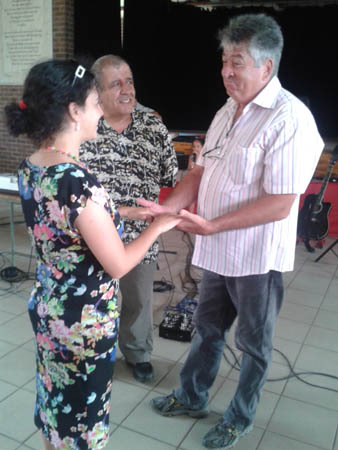 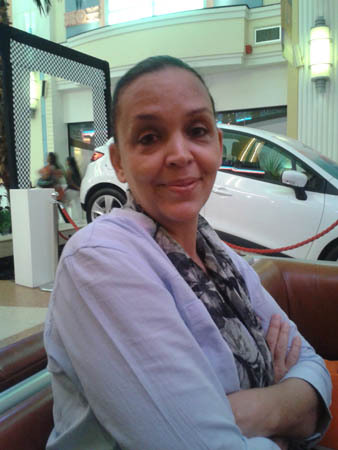 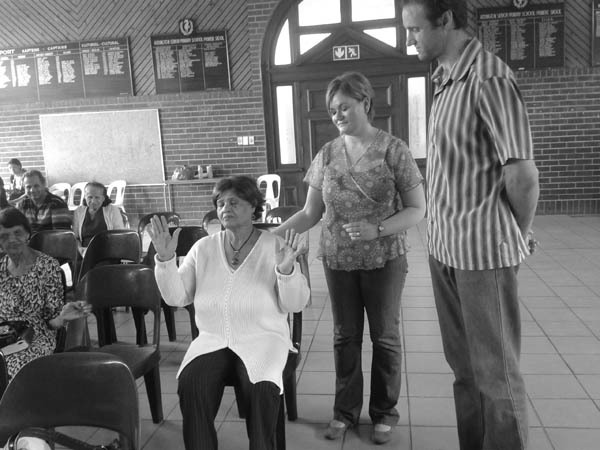 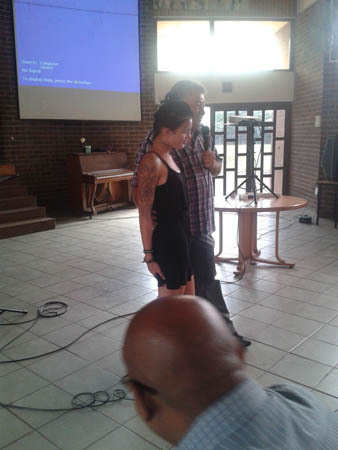 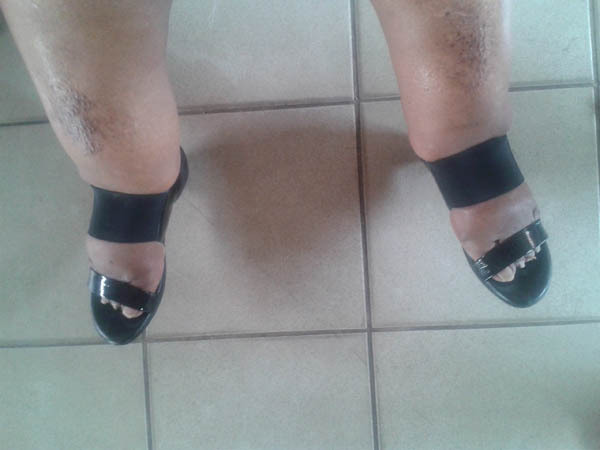 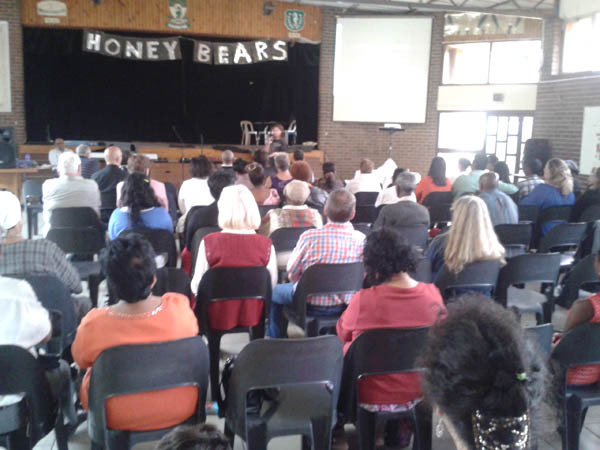 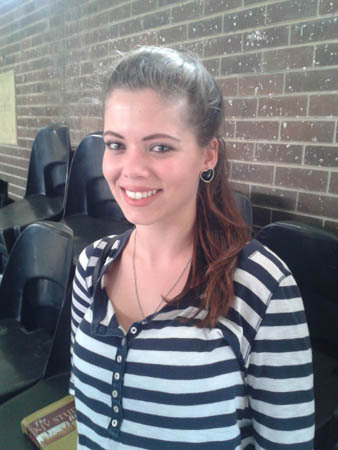 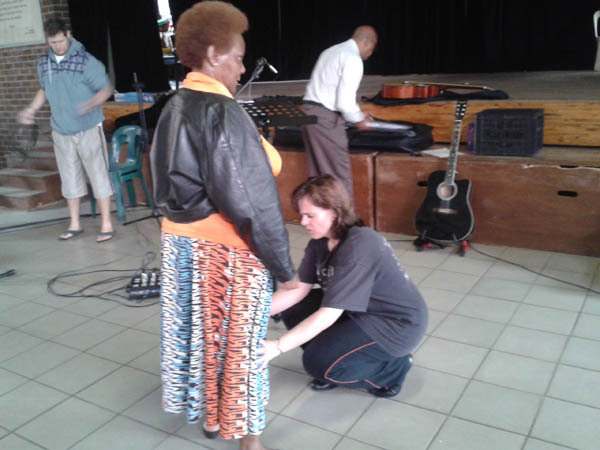 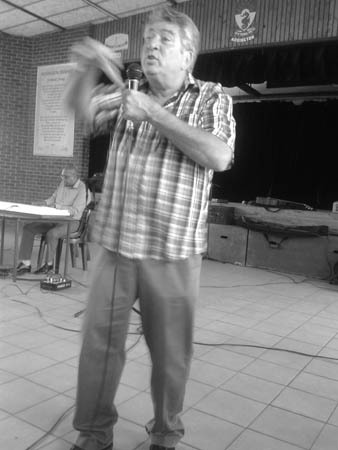 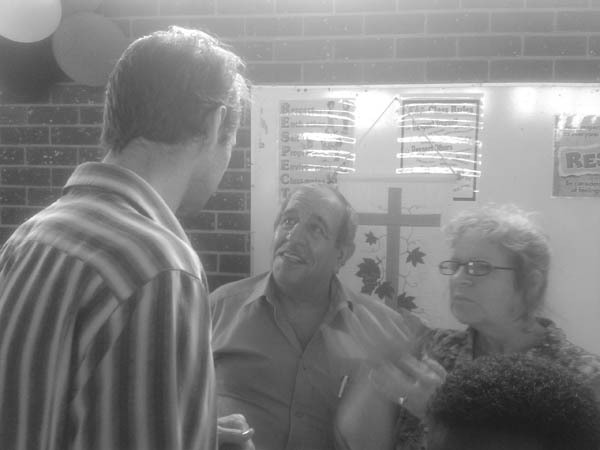 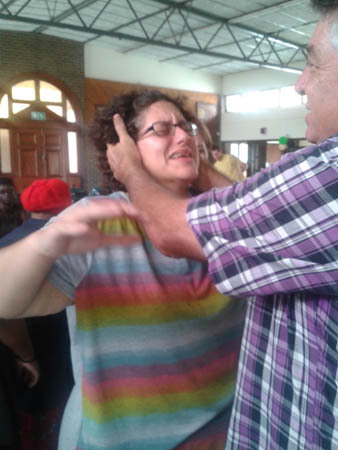 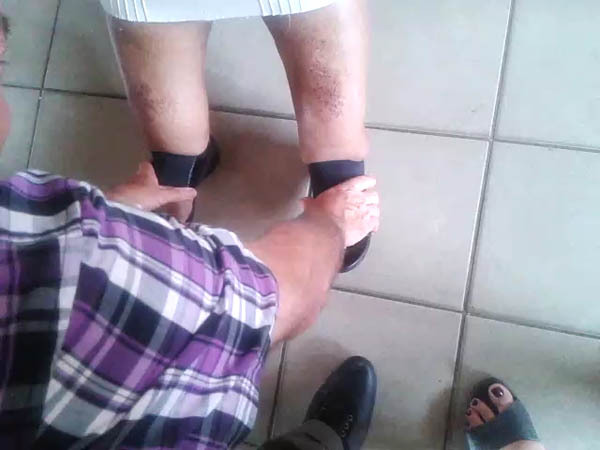 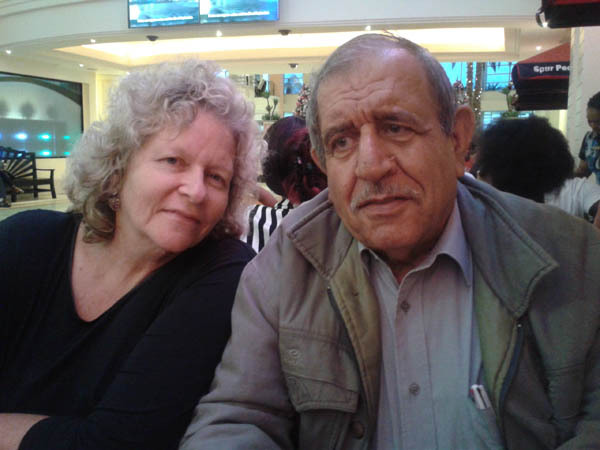 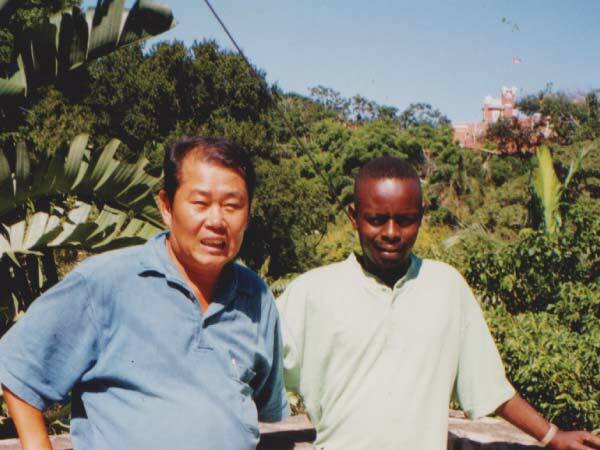 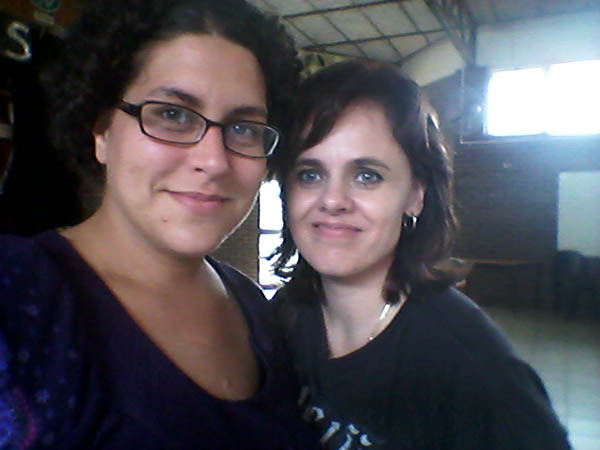 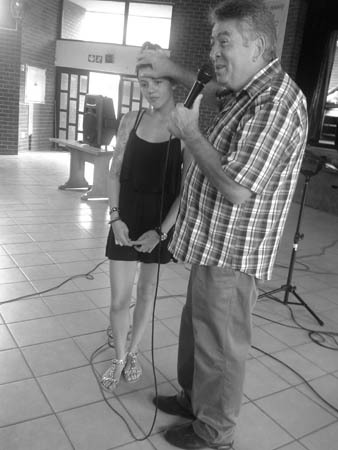 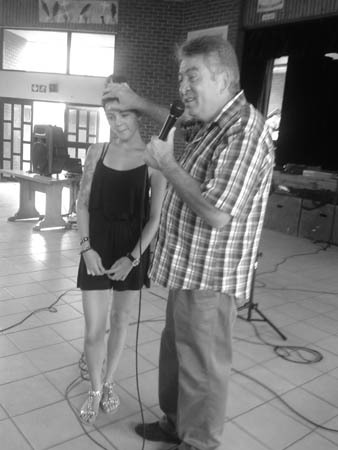 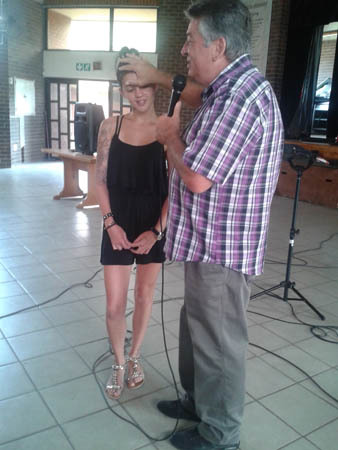 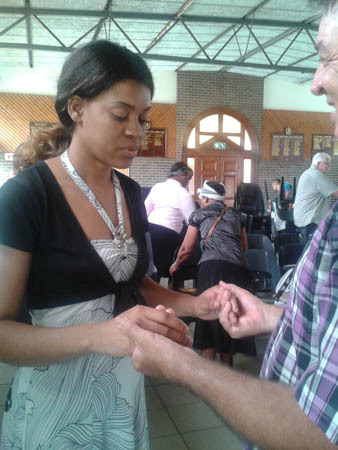 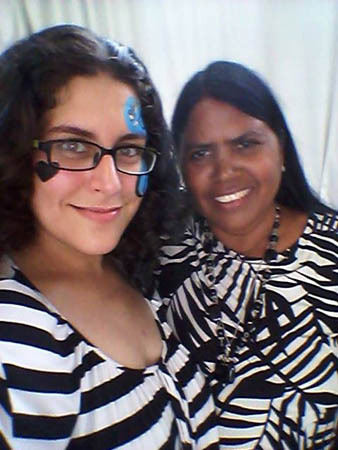 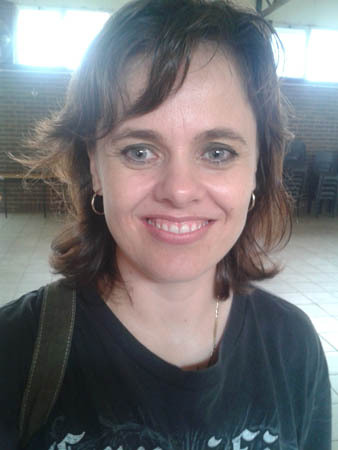 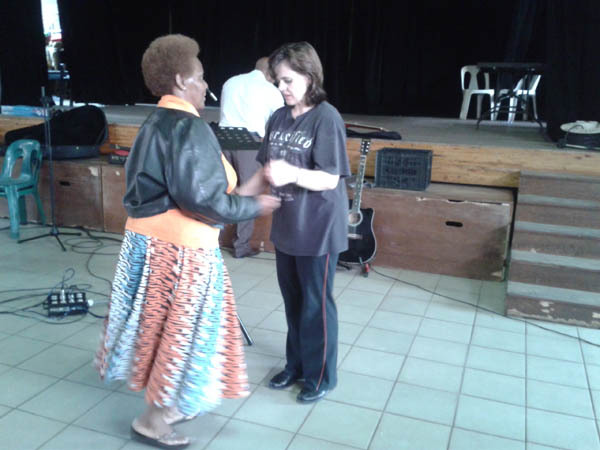 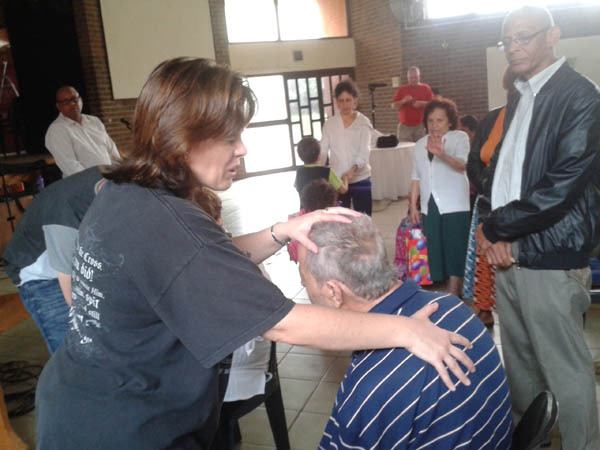 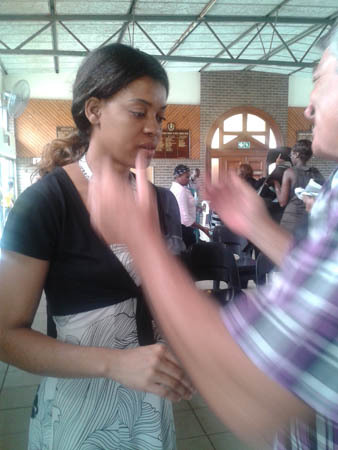 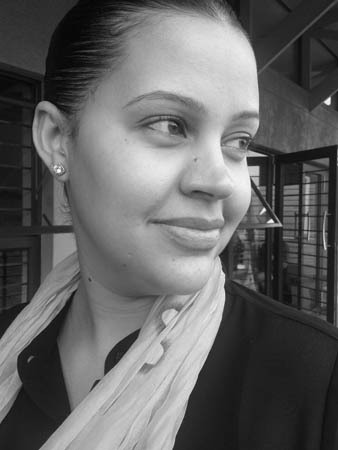 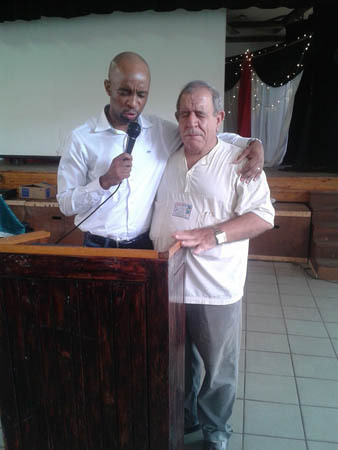 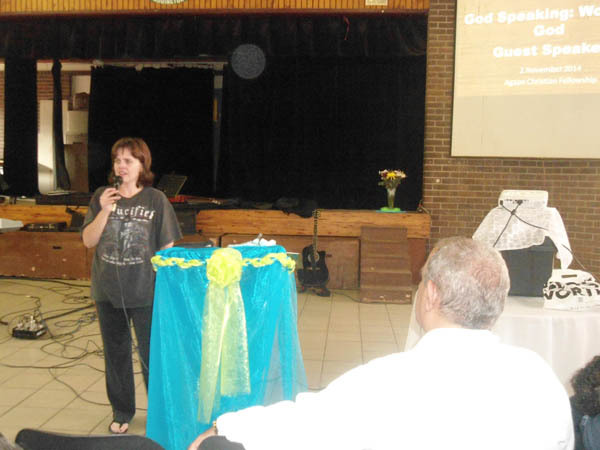 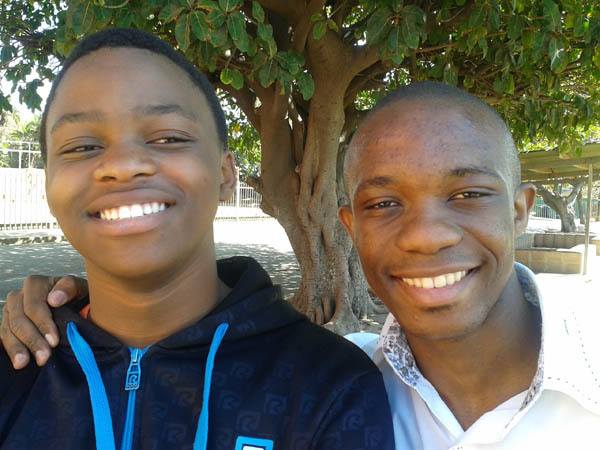 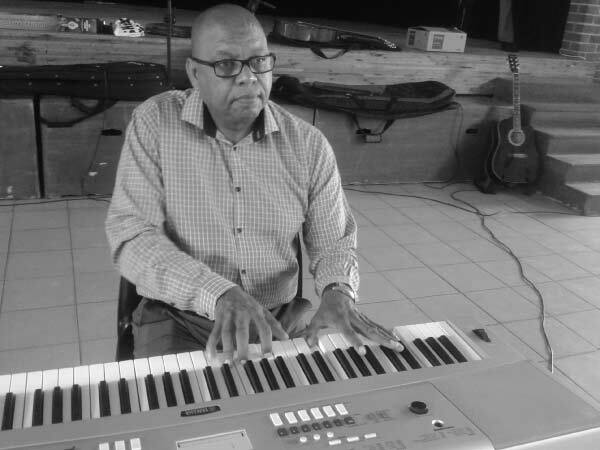 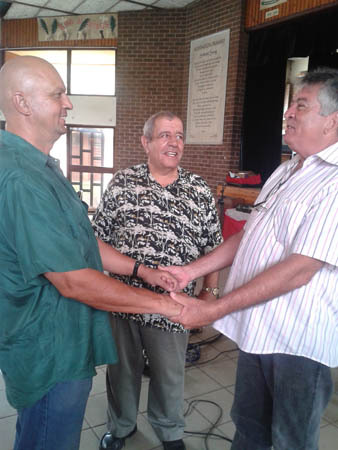 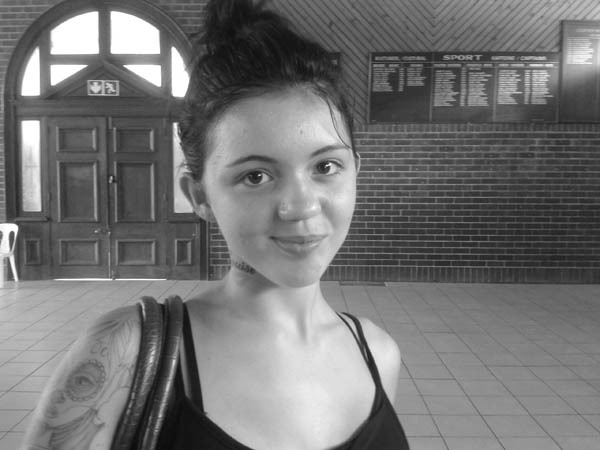 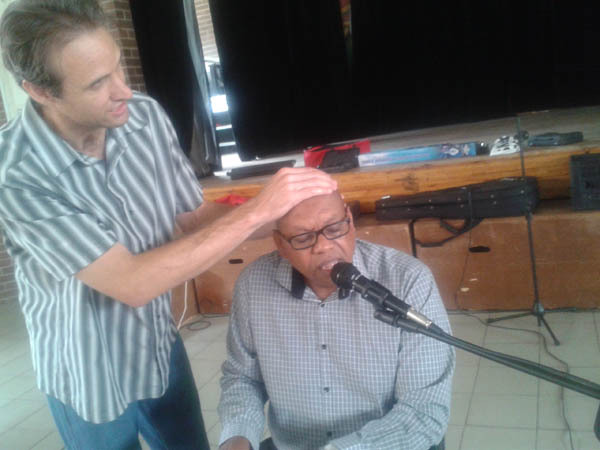 Example: Honey – Pastor Aimilios first met him by the beach where Ushaka is today. 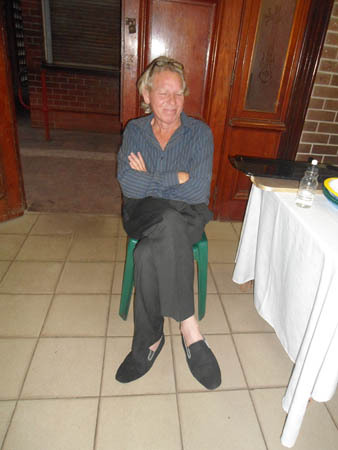 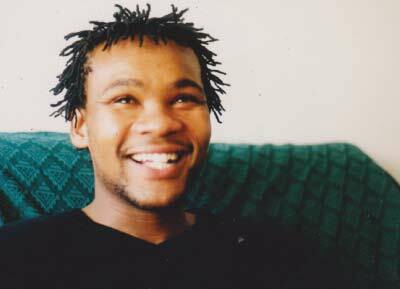 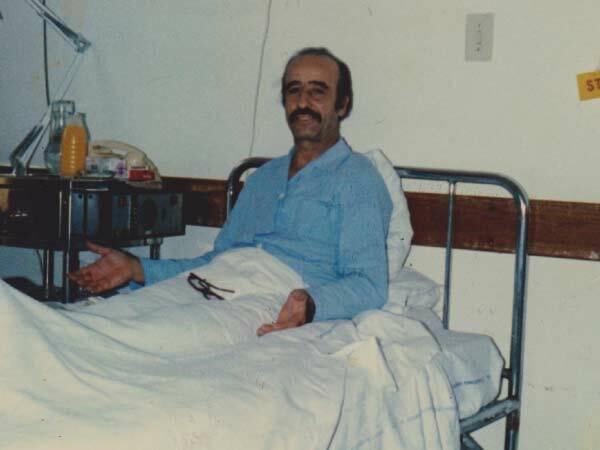 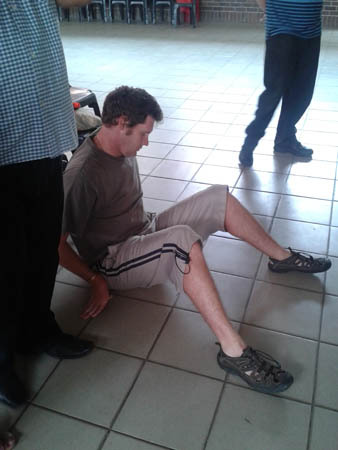 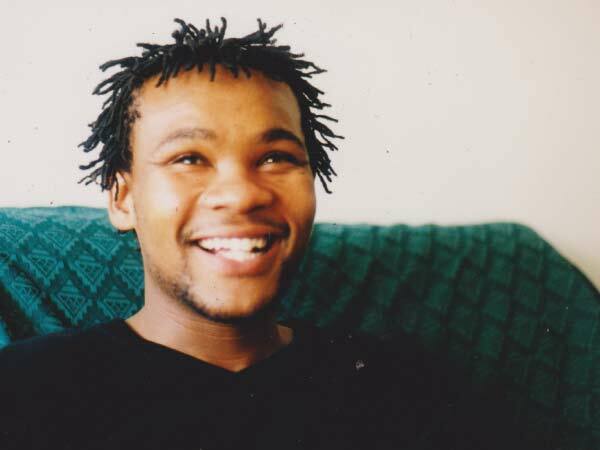 He was living on the street and would rob the people, and the spoils would be used to obtain alcohol and dagga. 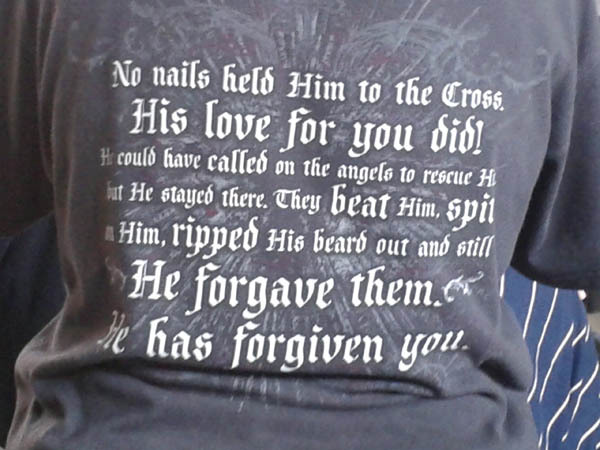 He never worried about tomorrow. 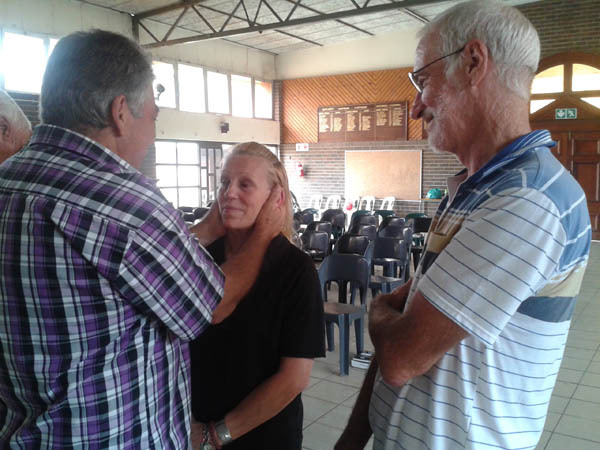 Honey heard about the unconditional love of the Lord and was touched by God’s love. 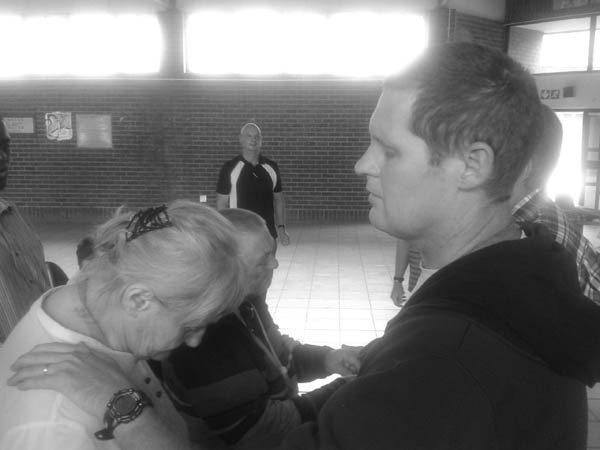 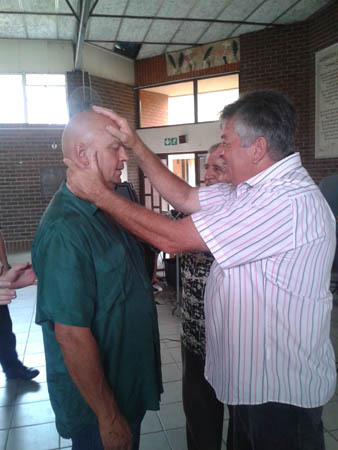 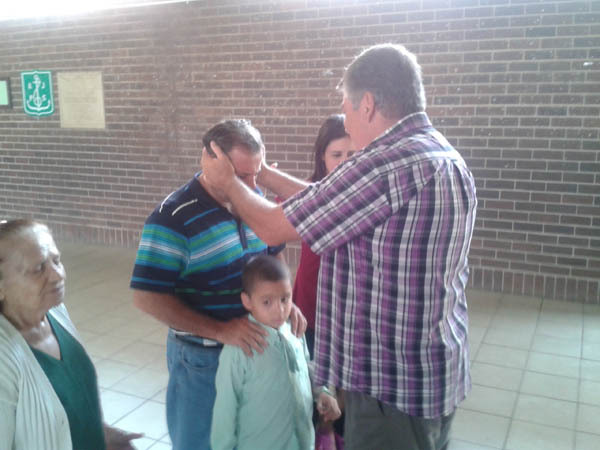 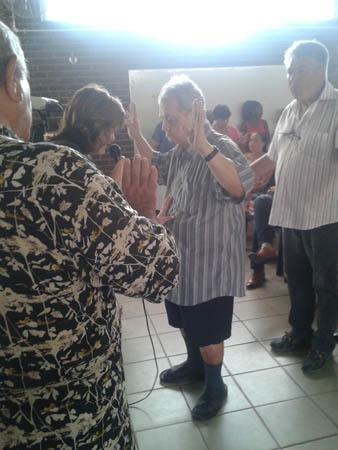 He committed his life to the Lord and started attending our services at church. 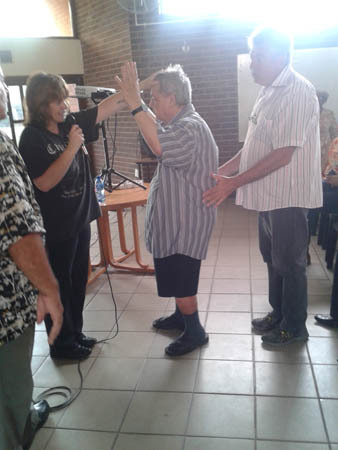 Pastor assisted him by paying for his stay at the Ark and later by renting a flat for him along with other members of the church. 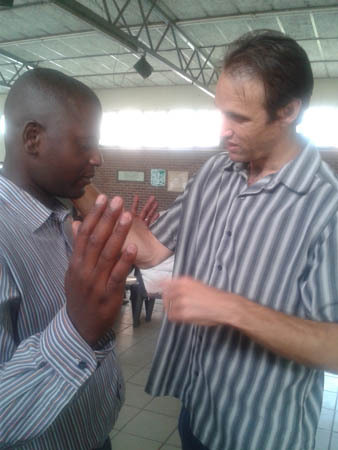 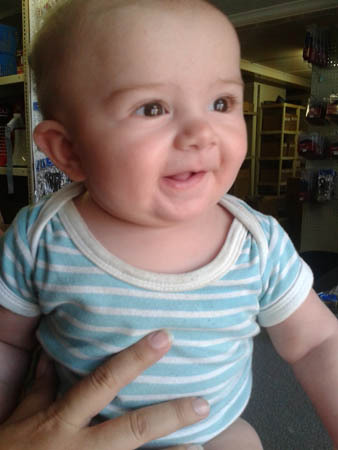 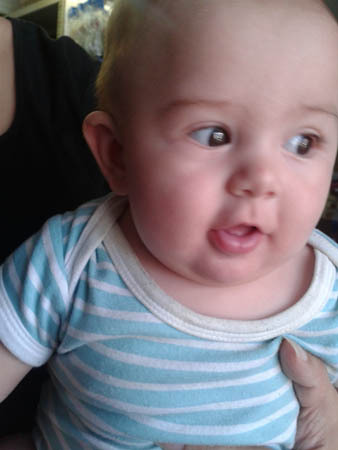 Today he is a qualified mechanic and runs his own successful business. 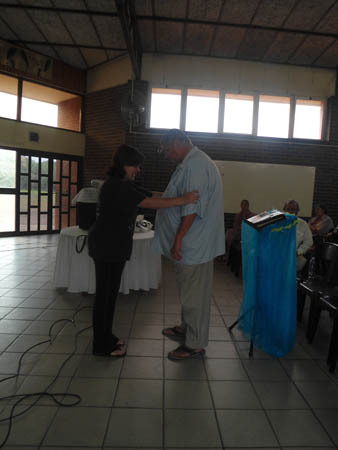 This is a perfect example of how we teach people to fish so that they can feed themselves and their loved ones. 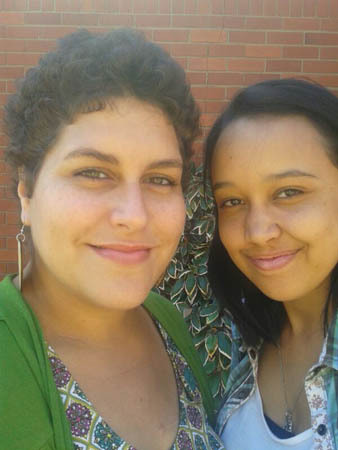 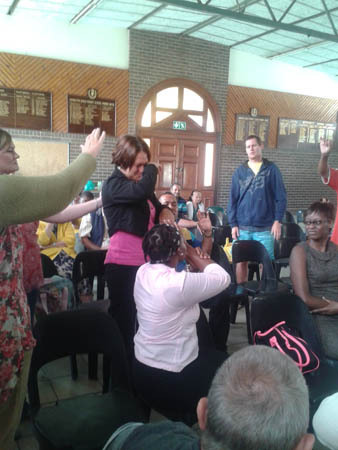 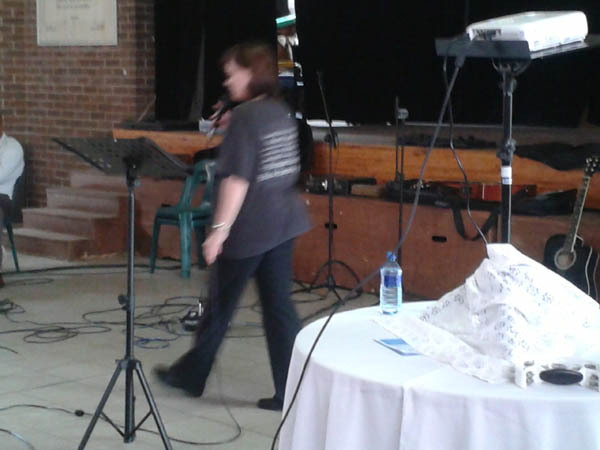 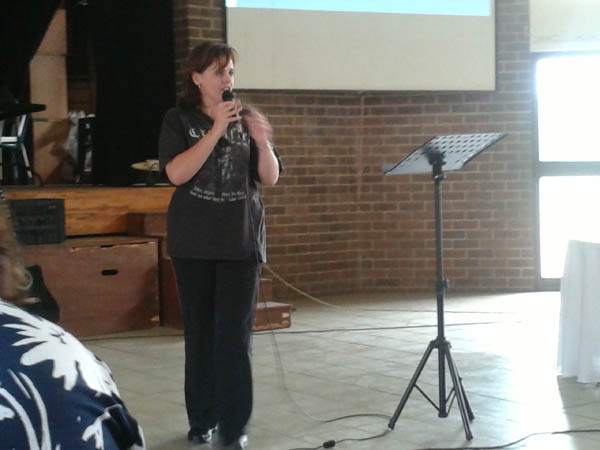 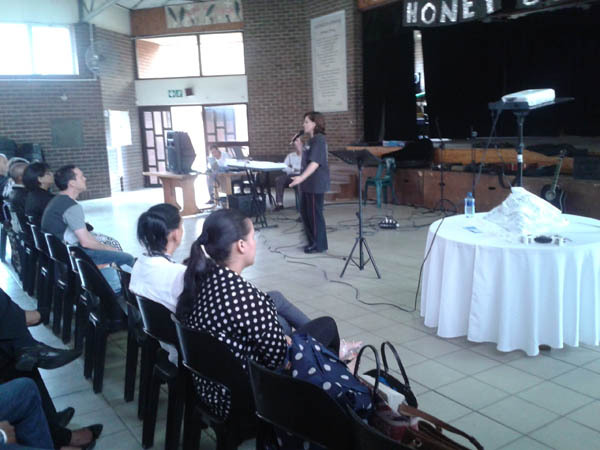 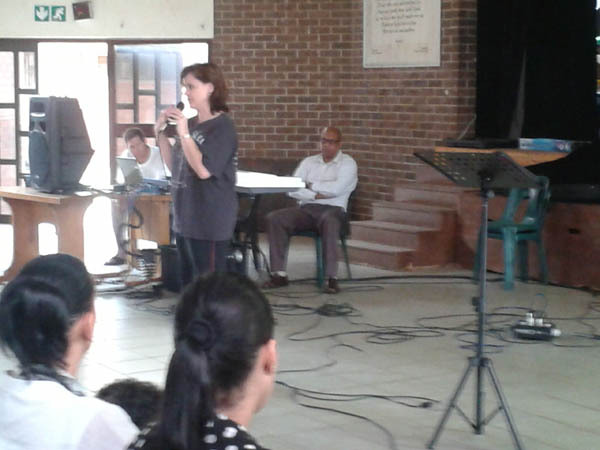 Addington School: As a Church we need to become more visible in assisting with projects around the school. 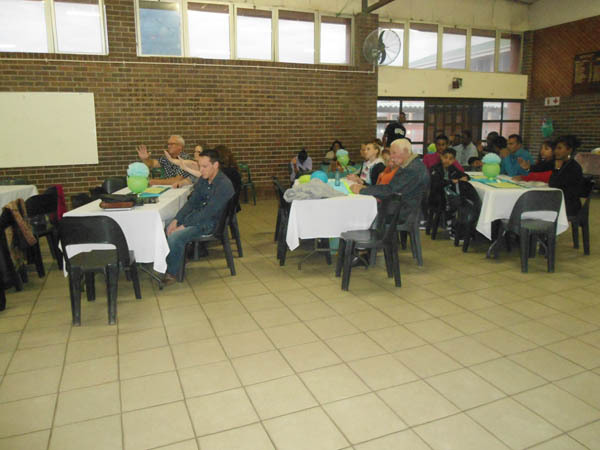 The Church has since been invited to assist with ministering to the pupils by CRAFT and with extra Language coaching i.e. 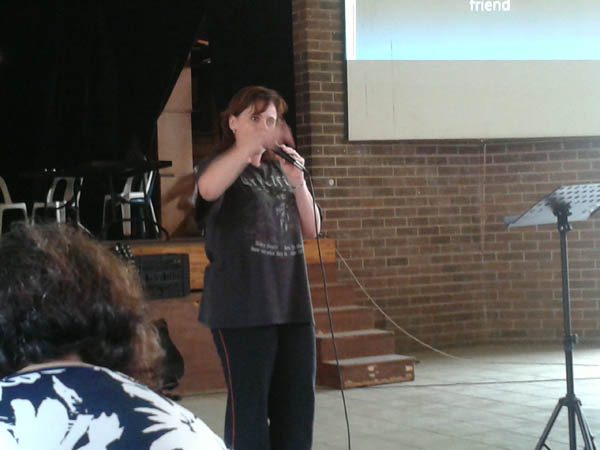 Phonics, reading, grammar. 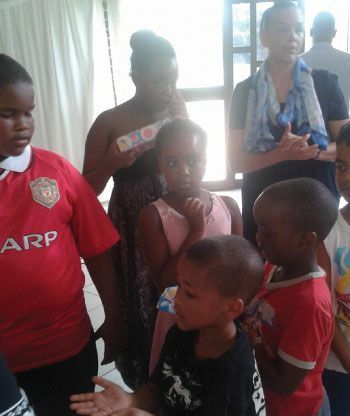 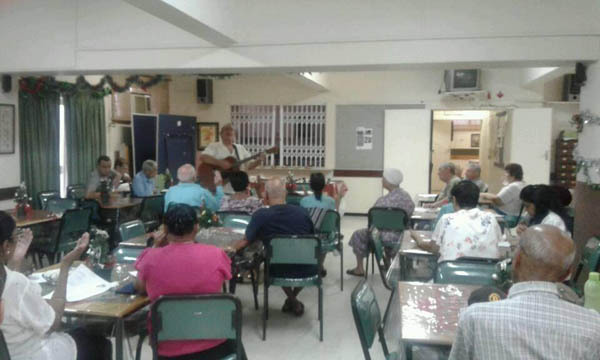 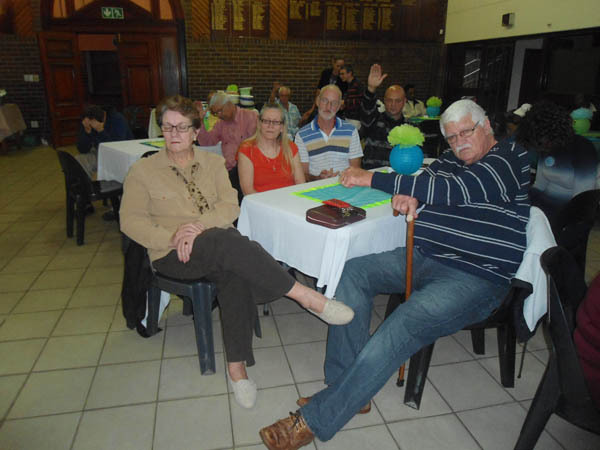 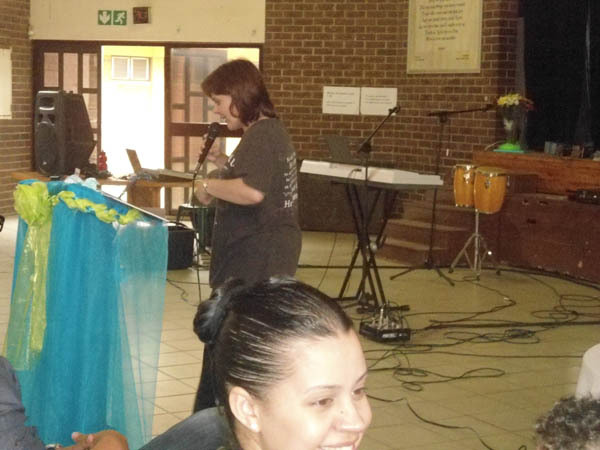 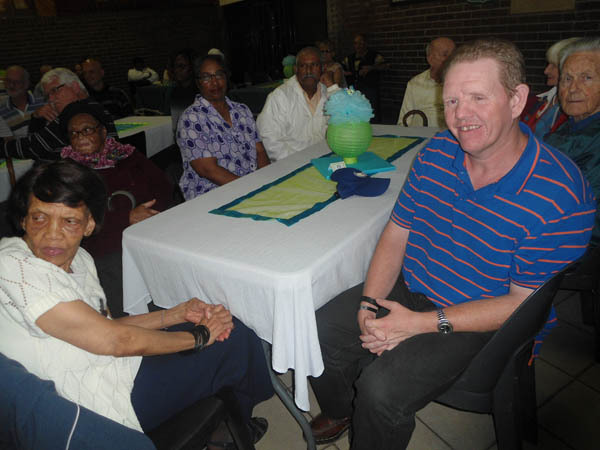 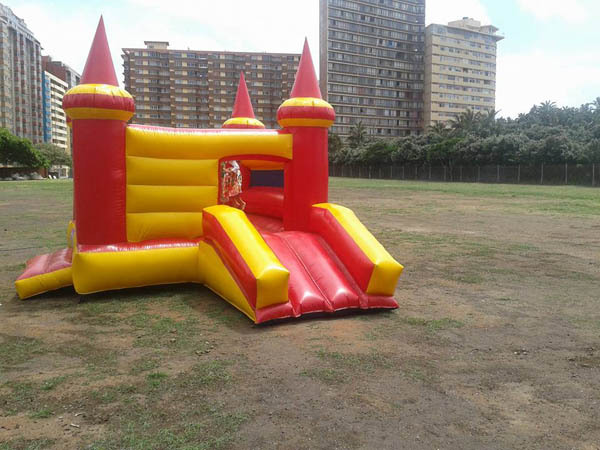 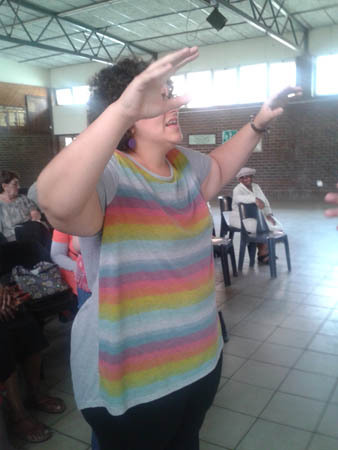 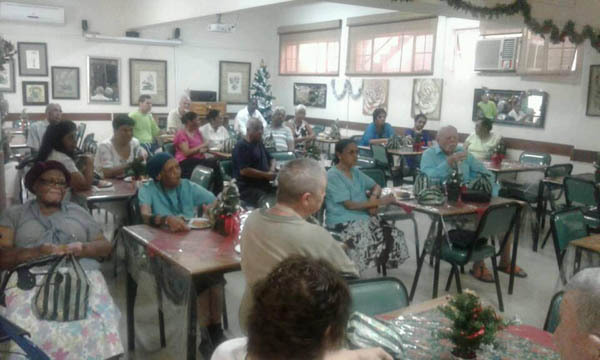 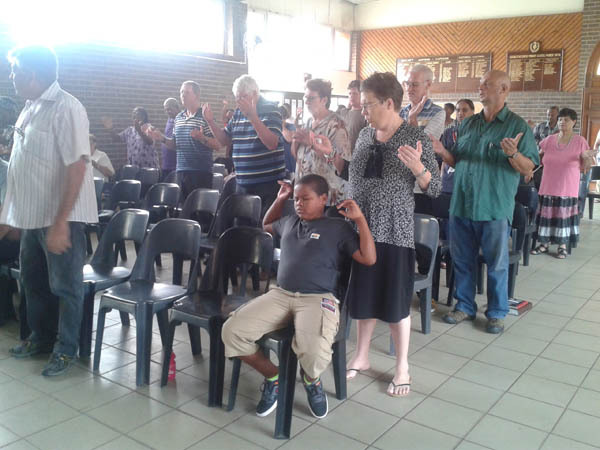 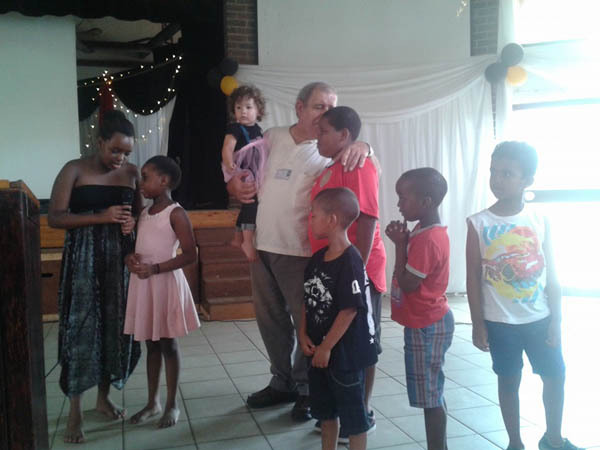 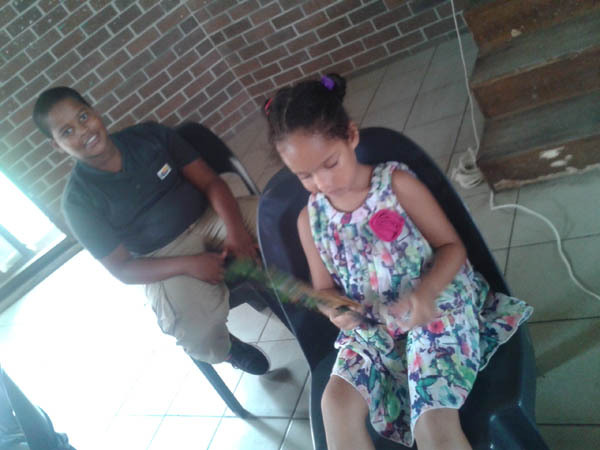 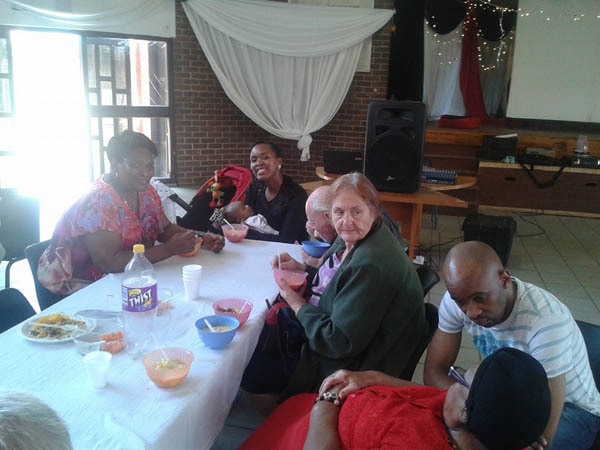 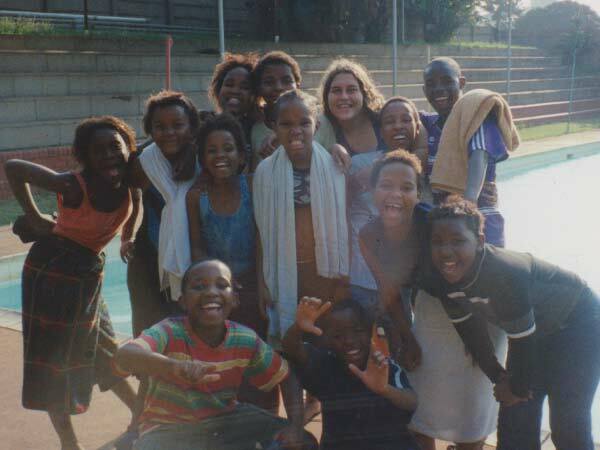 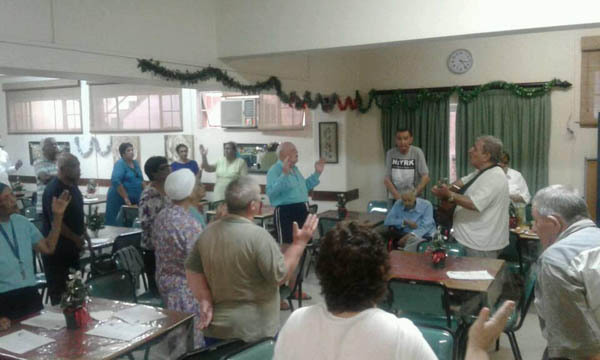 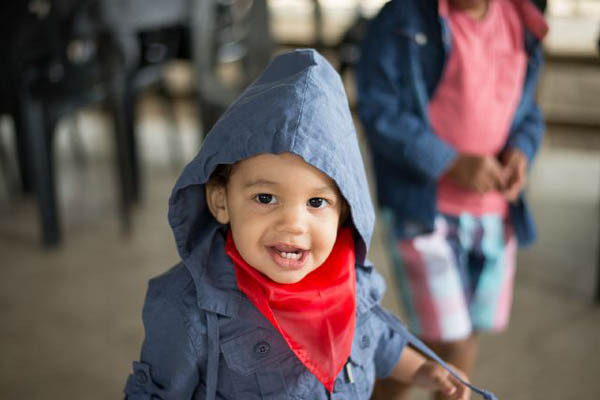 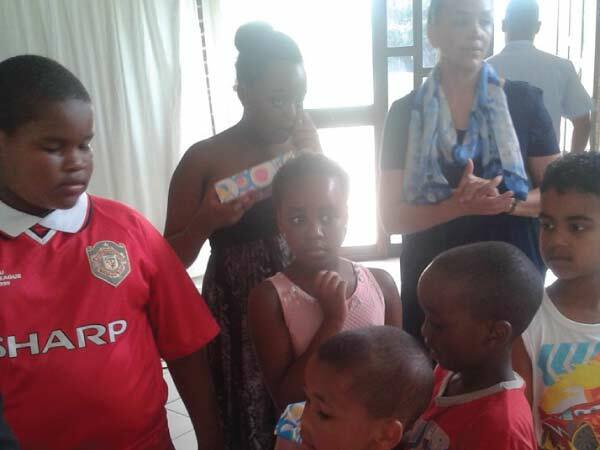 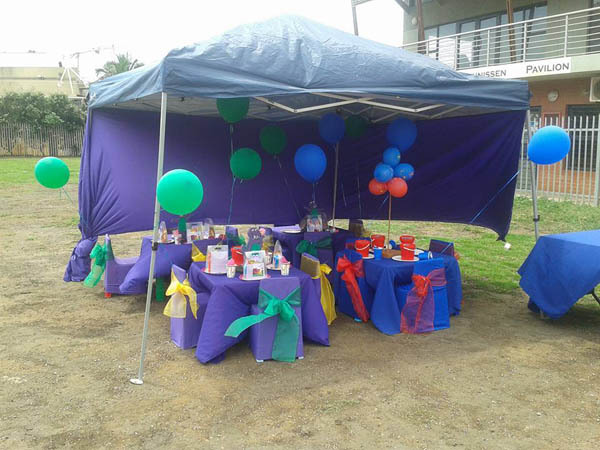 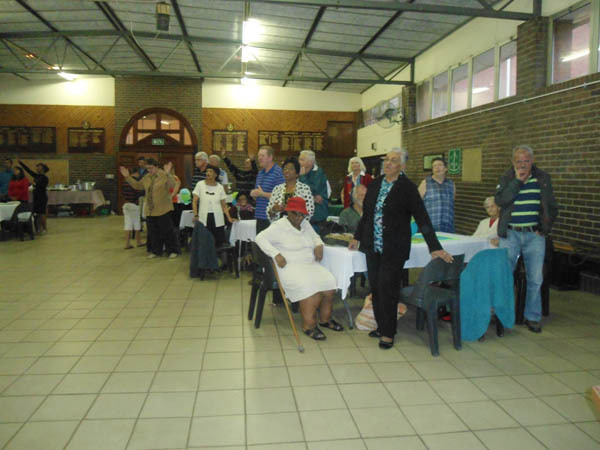 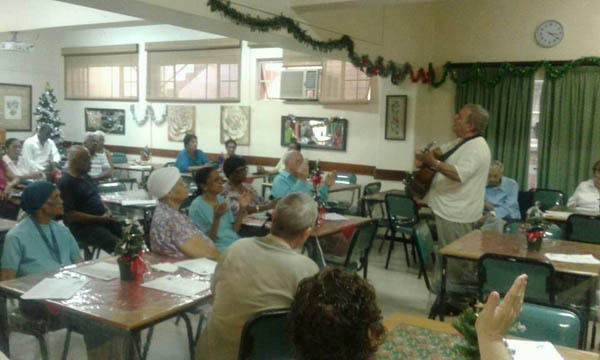 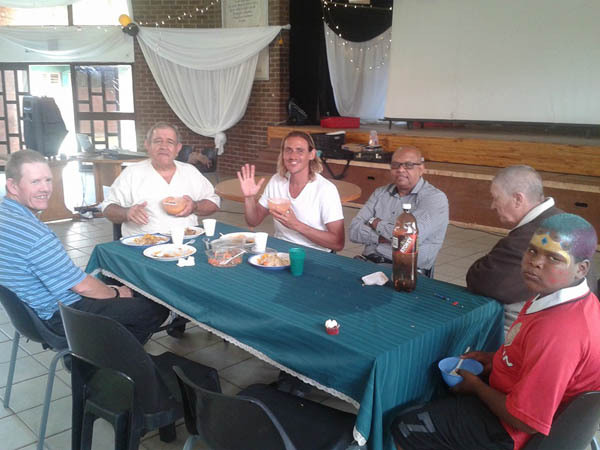 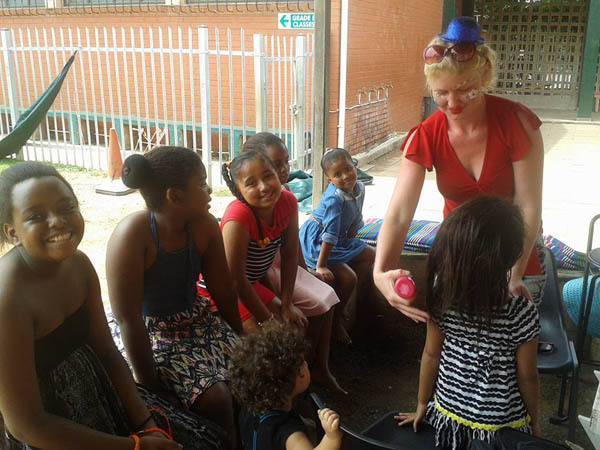 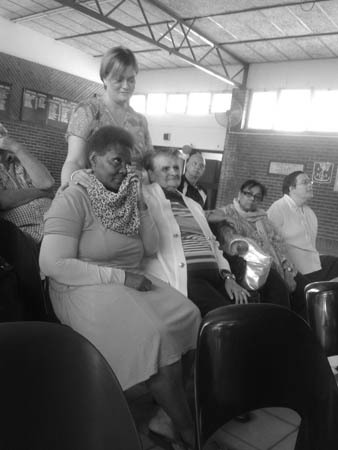 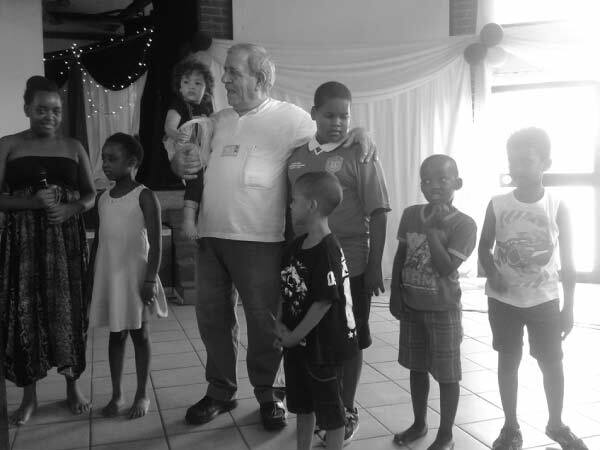 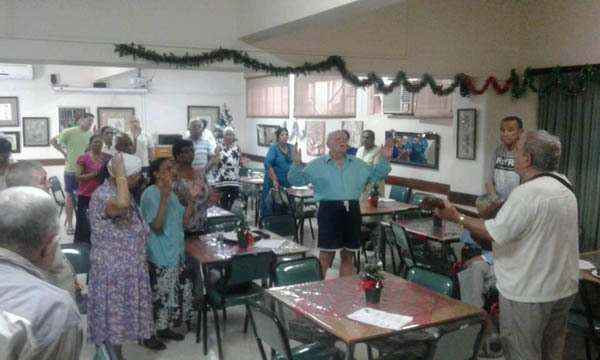 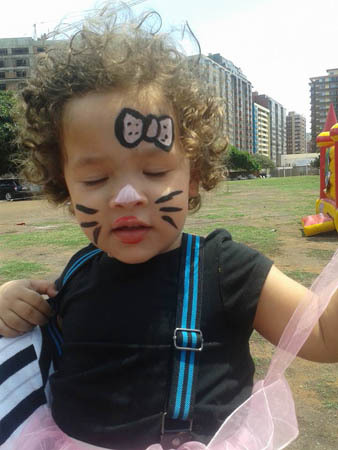 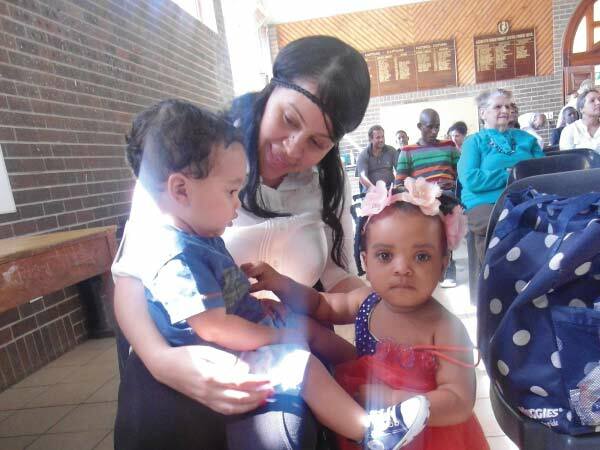 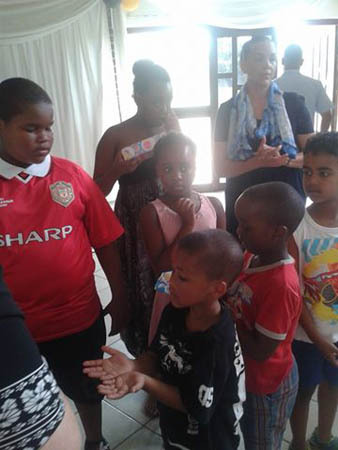 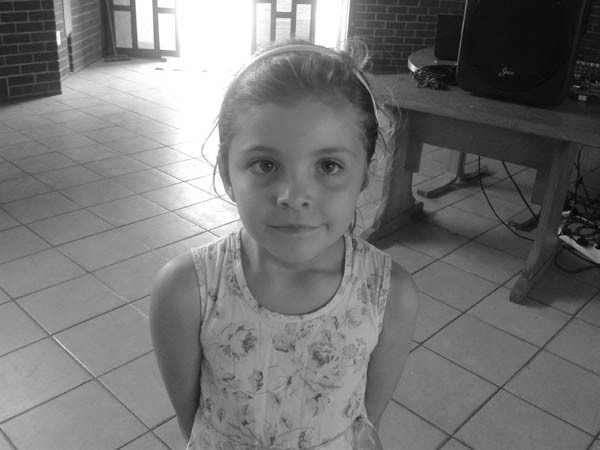 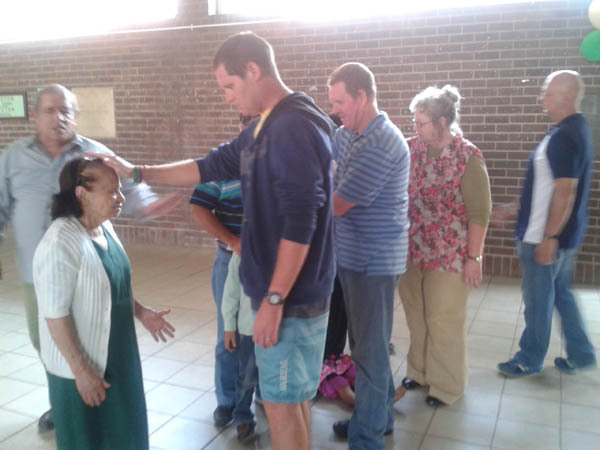 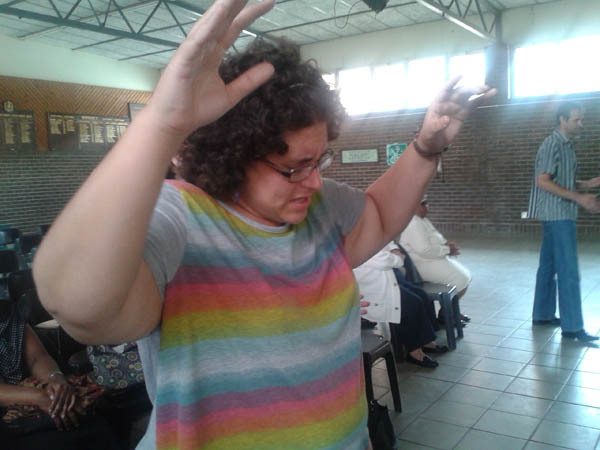 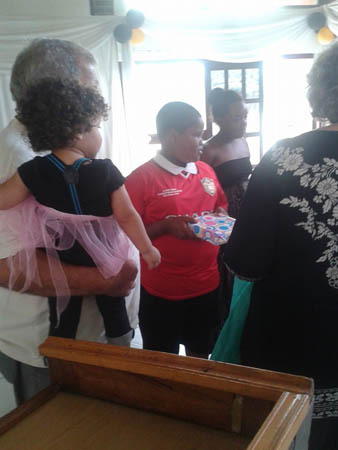 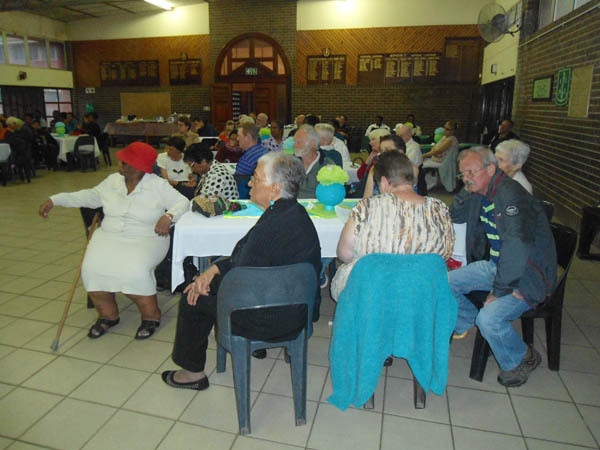 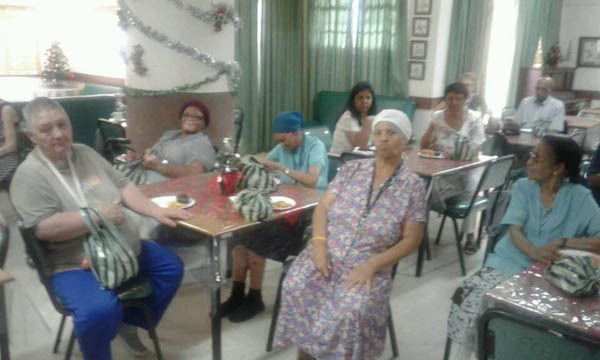 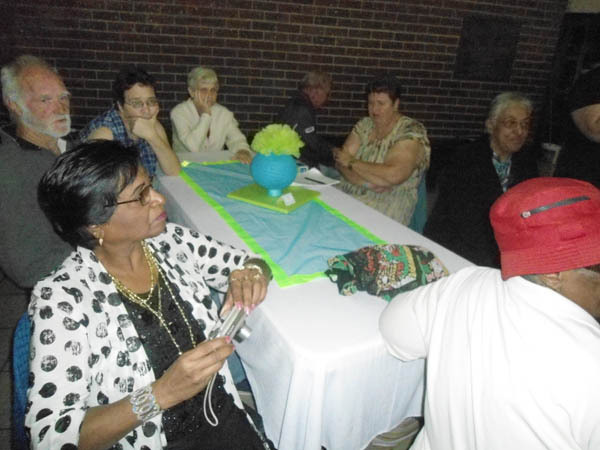 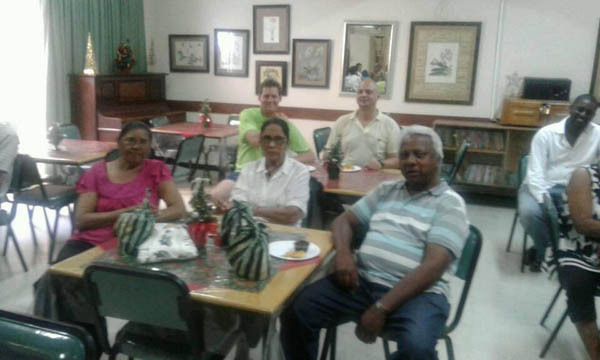 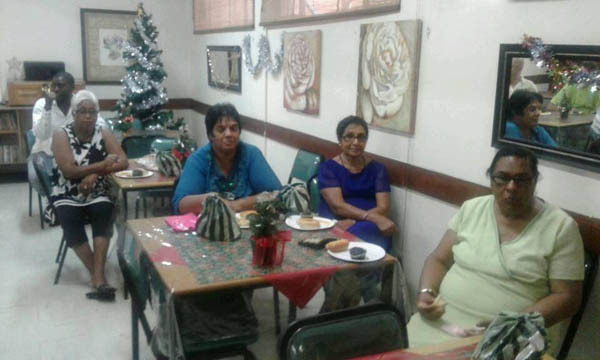 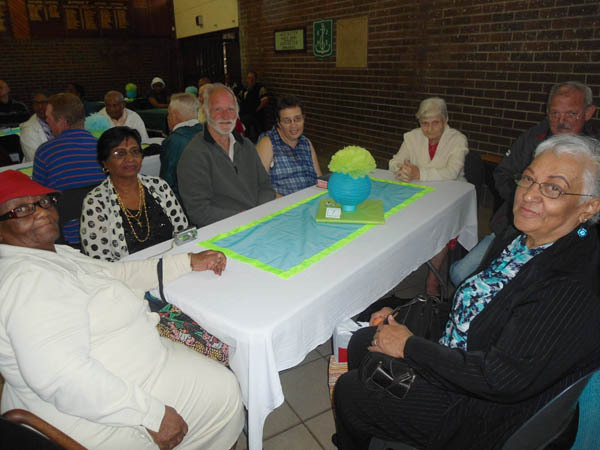 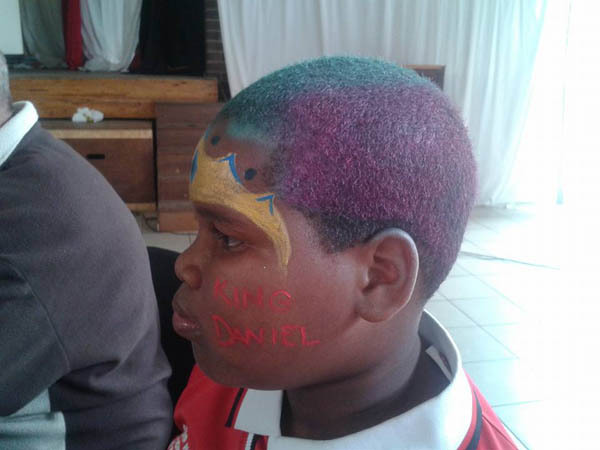 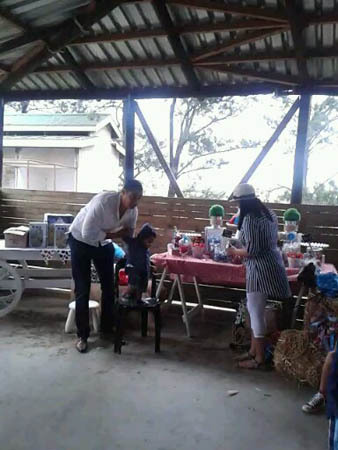 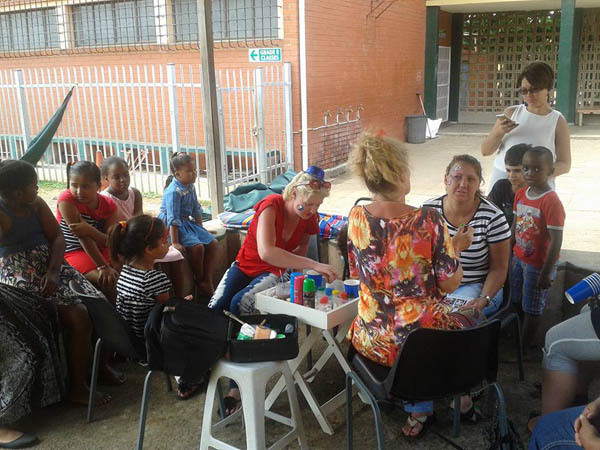 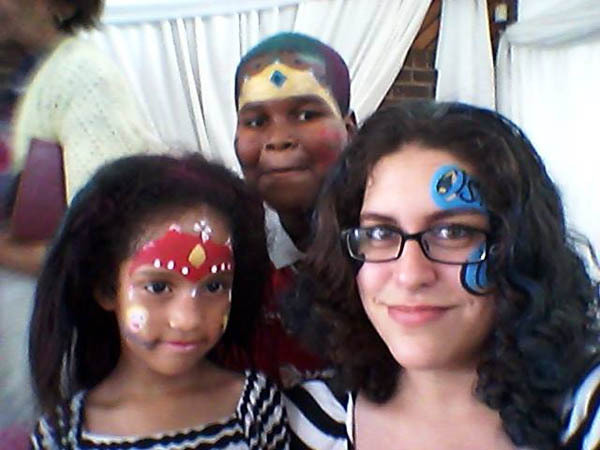 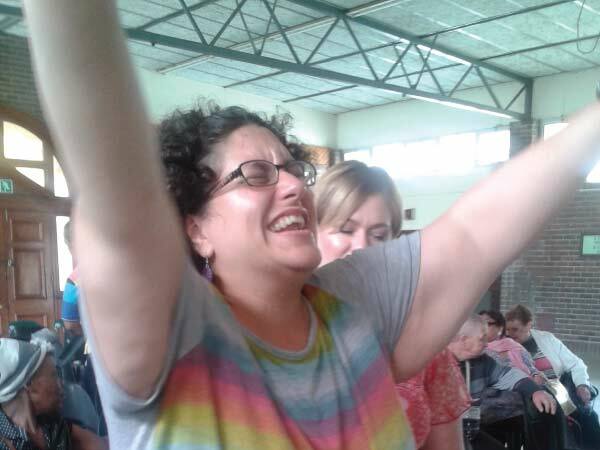 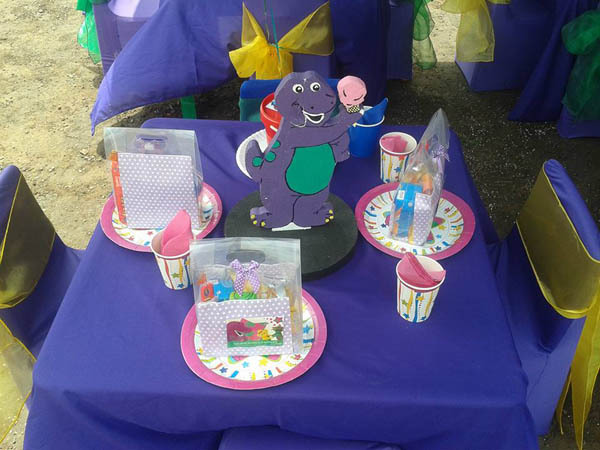 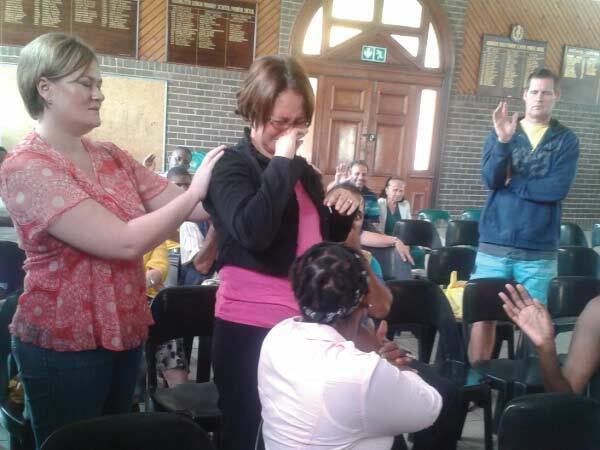 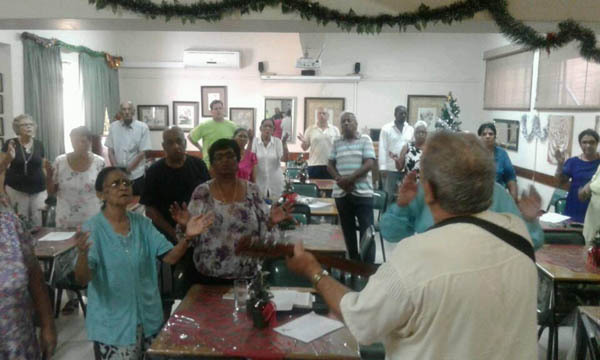 Secondly, once a year during the June/July school holidays a church holiday club is run by the Westville Baptist Church and an invitation has been extended for members of Agape to assist with the program. 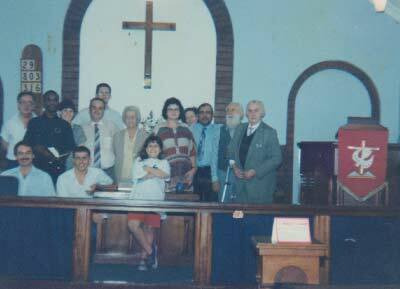 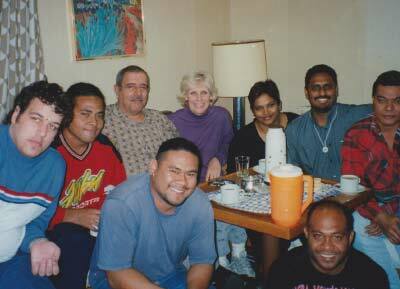 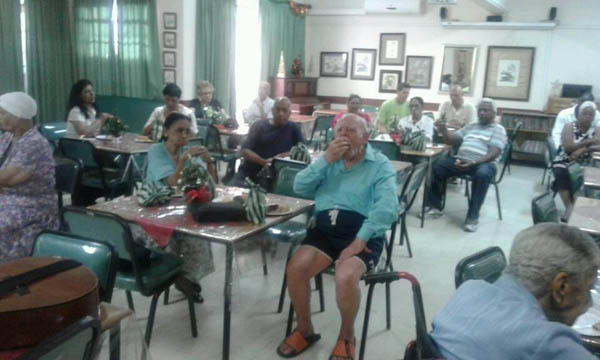 David; Chris; Blaise; Francis; Ruben; Liz and Roslyn, Plexedes, Francis, Peter and Jason. 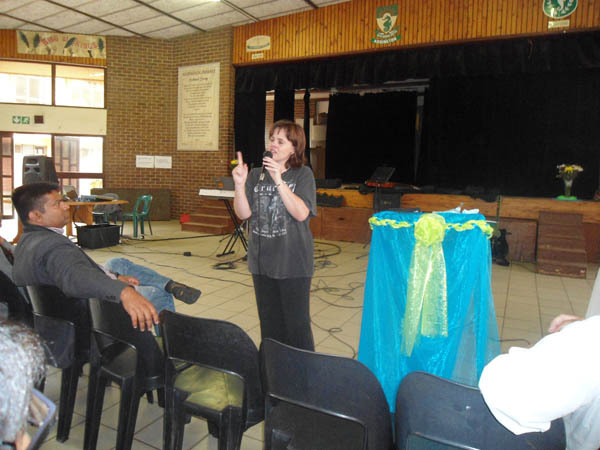 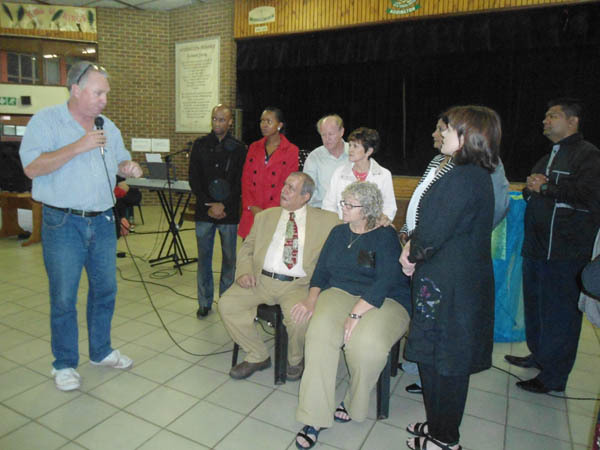 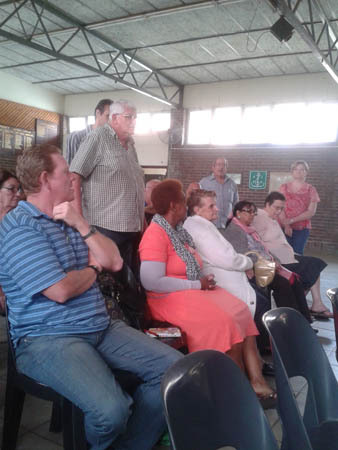 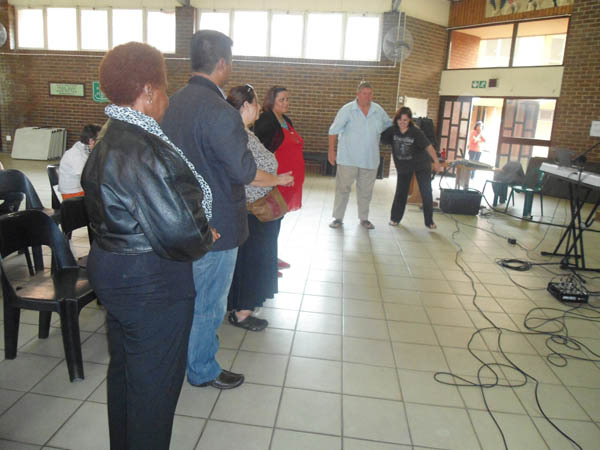 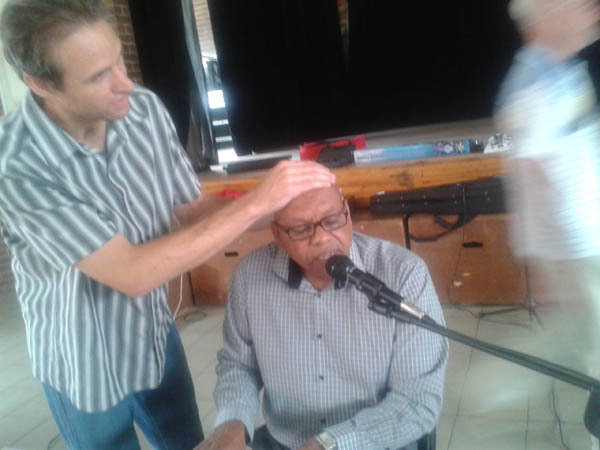 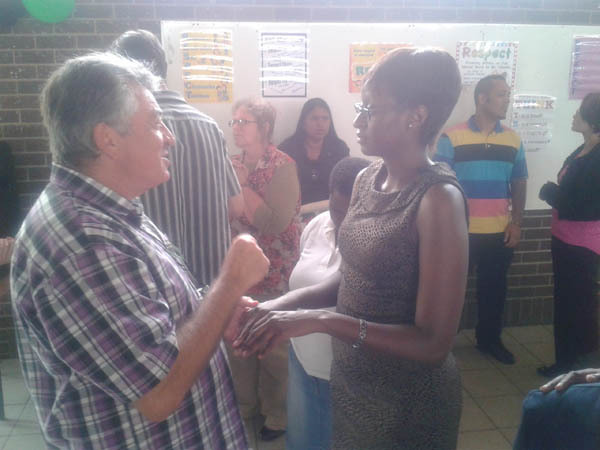 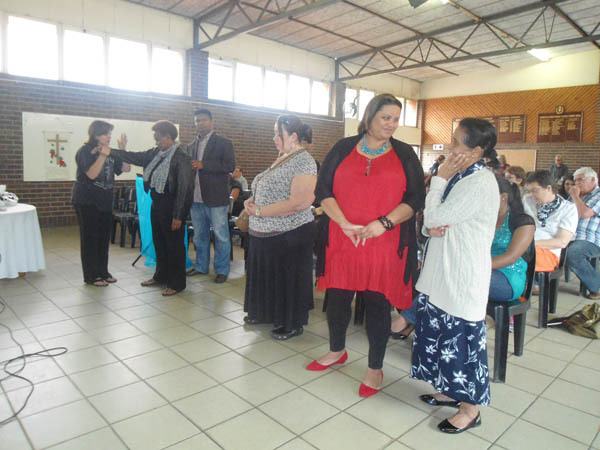 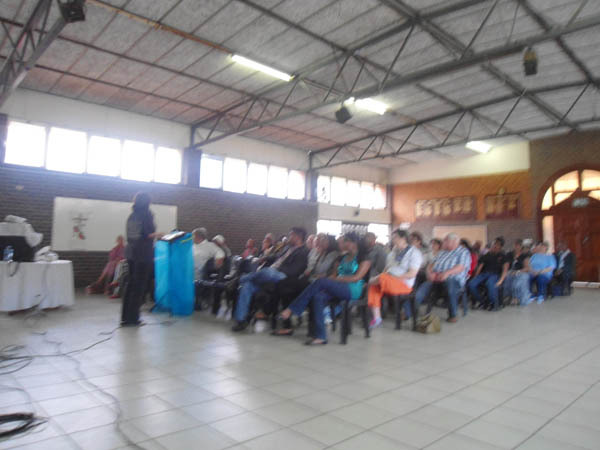 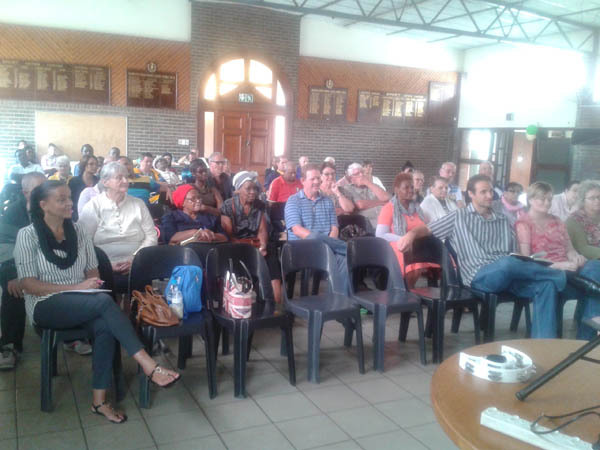 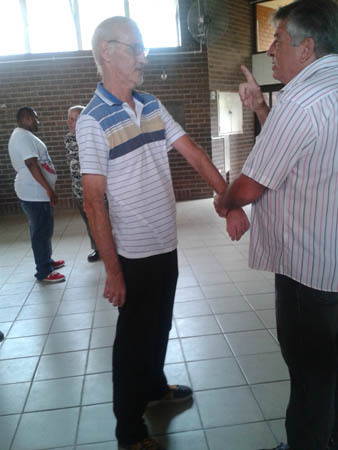 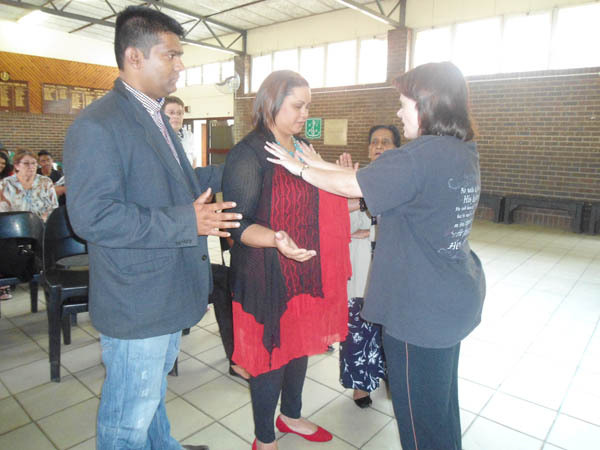 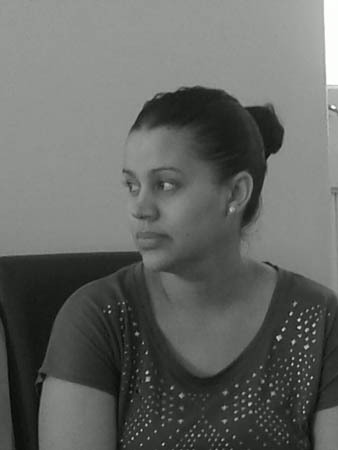 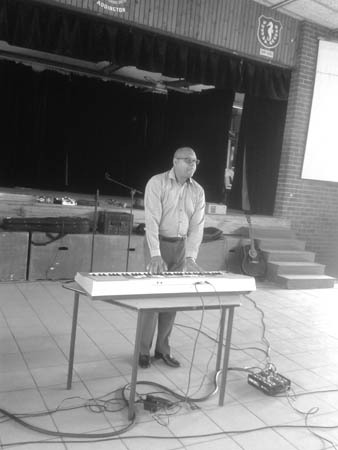 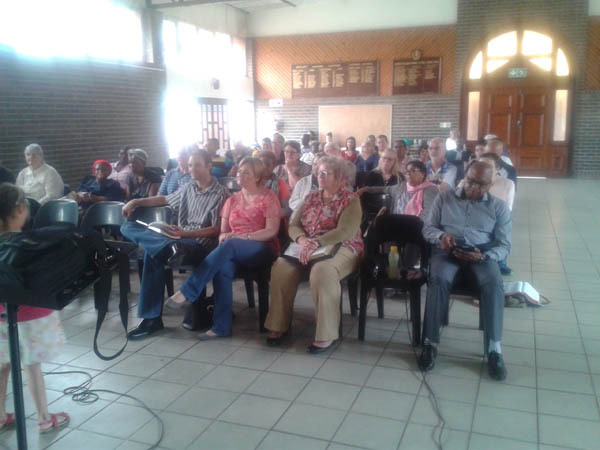 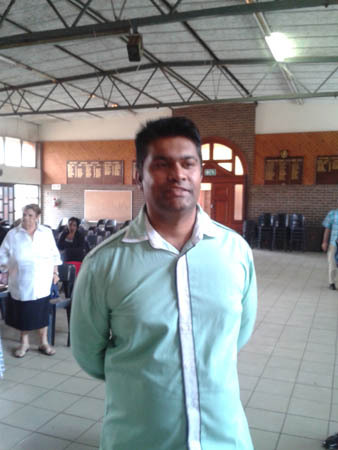 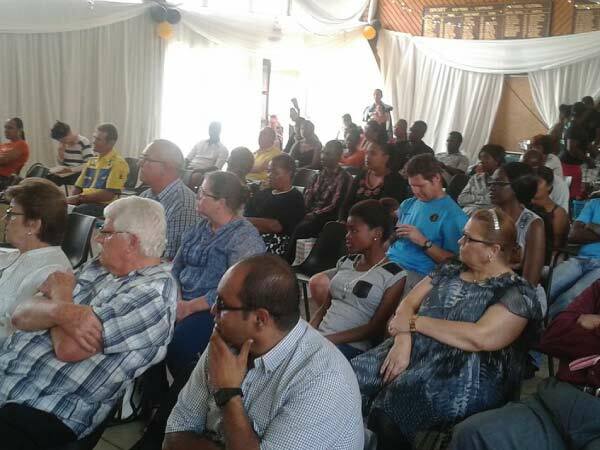 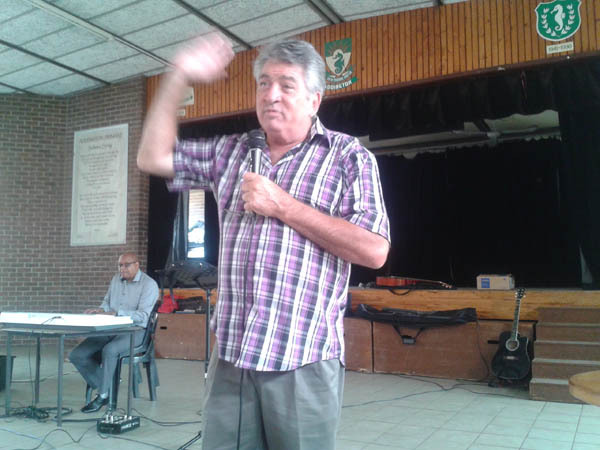 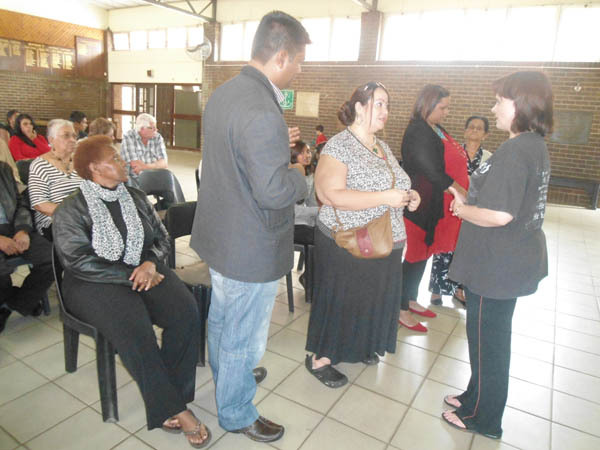 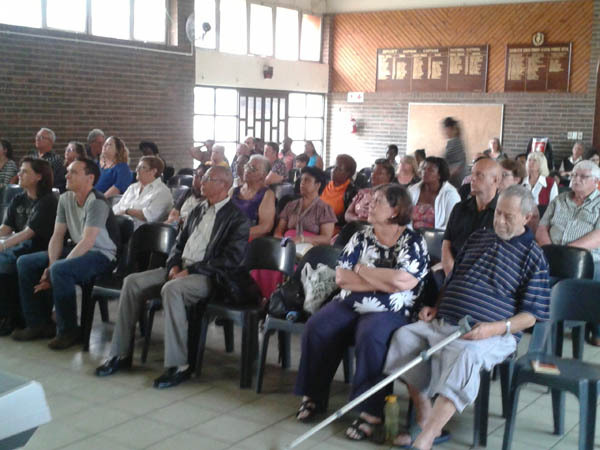 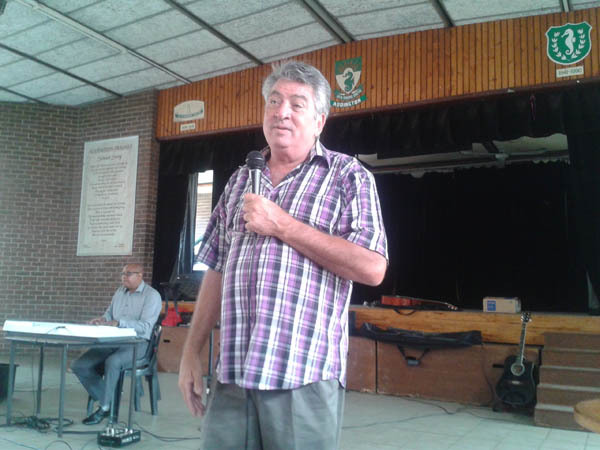 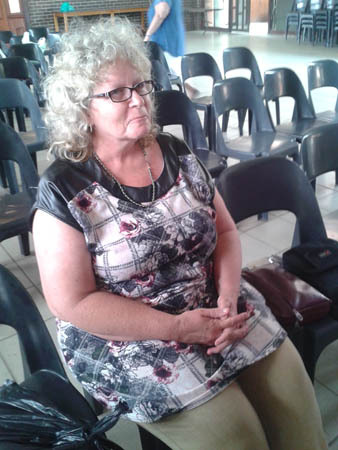 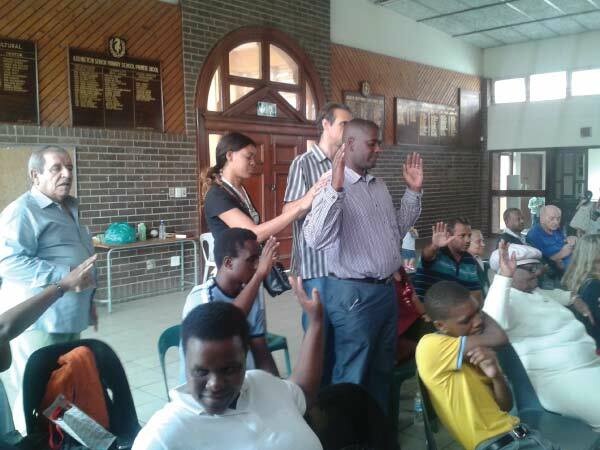 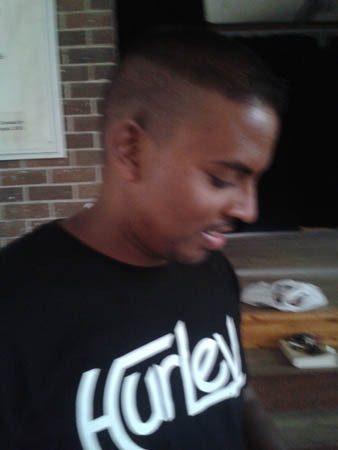 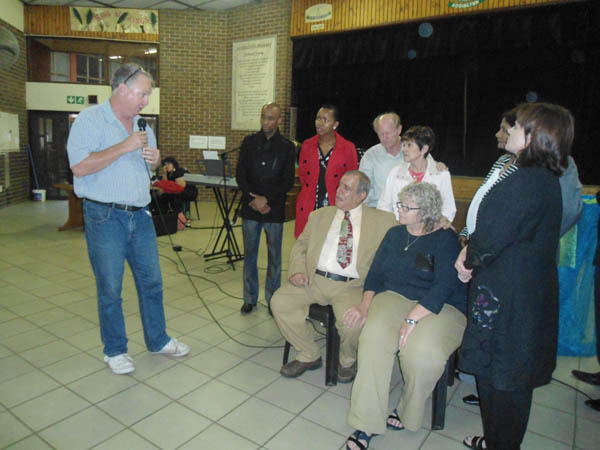 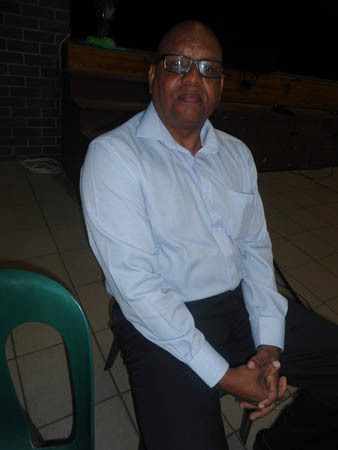 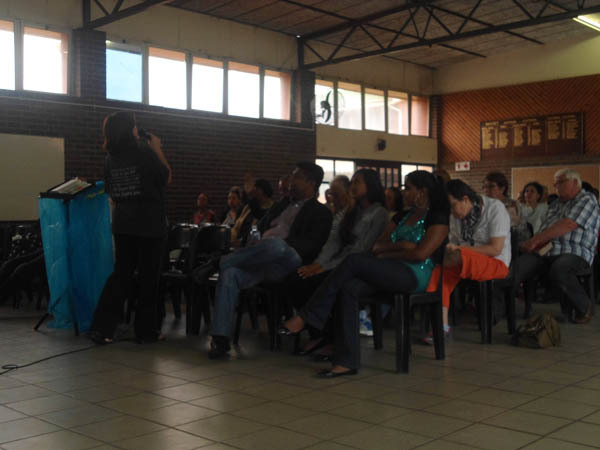 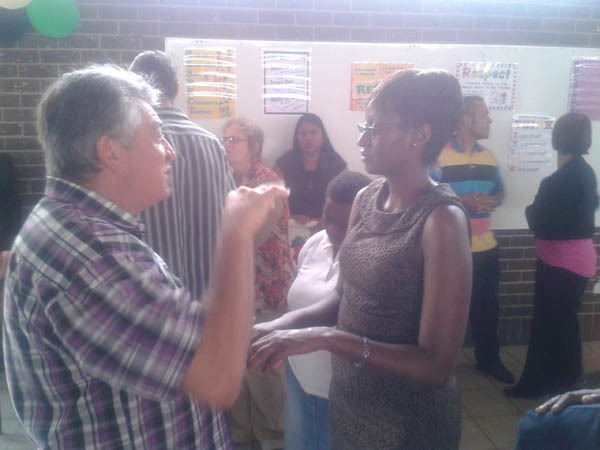 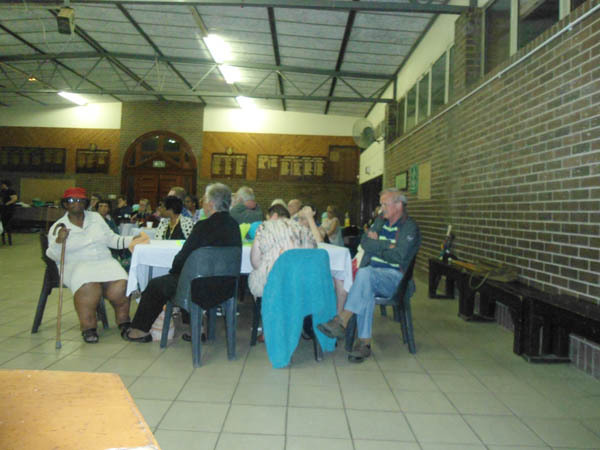 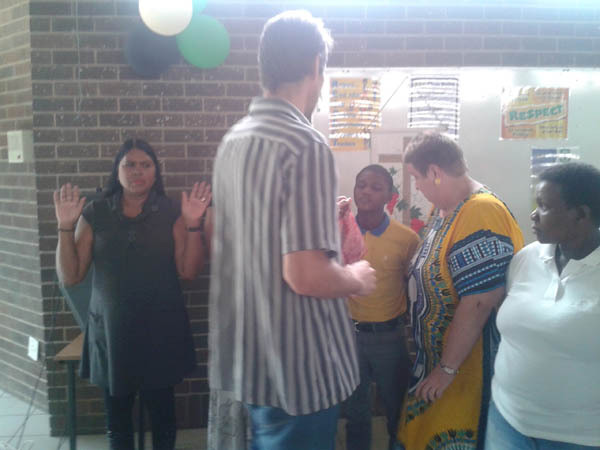 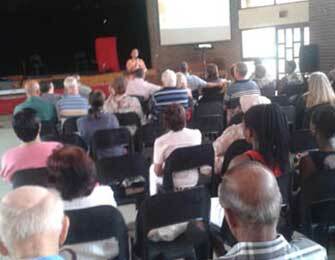 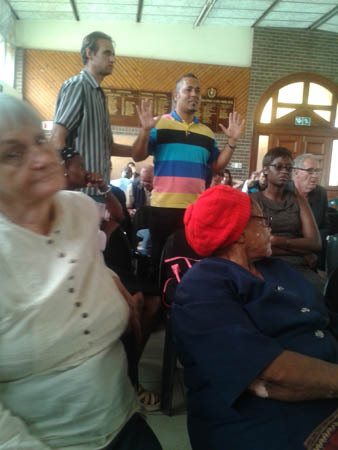 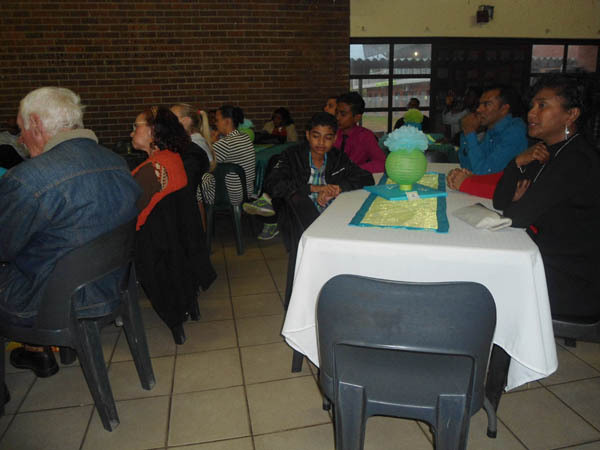 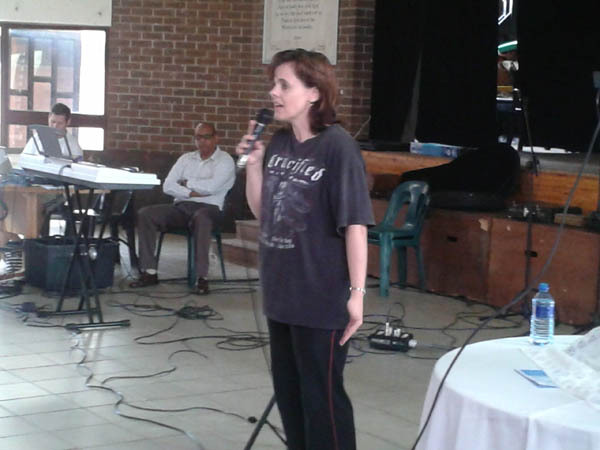 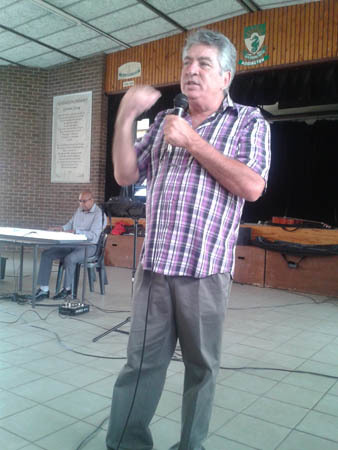 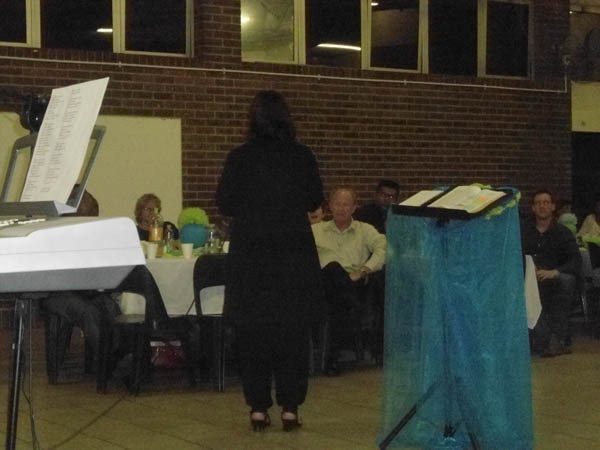 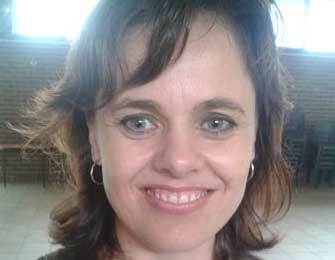 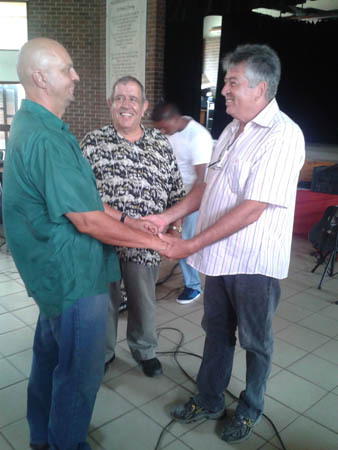 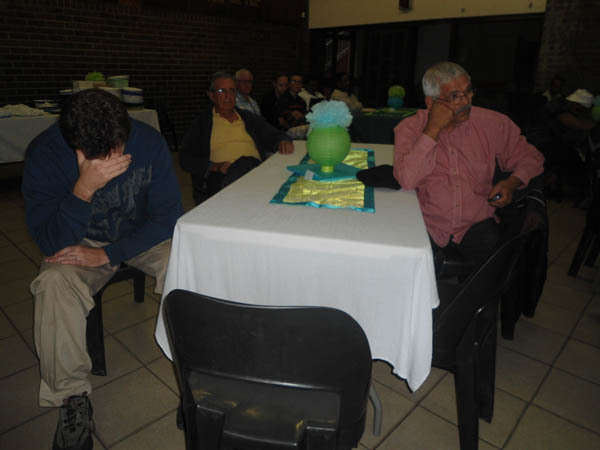 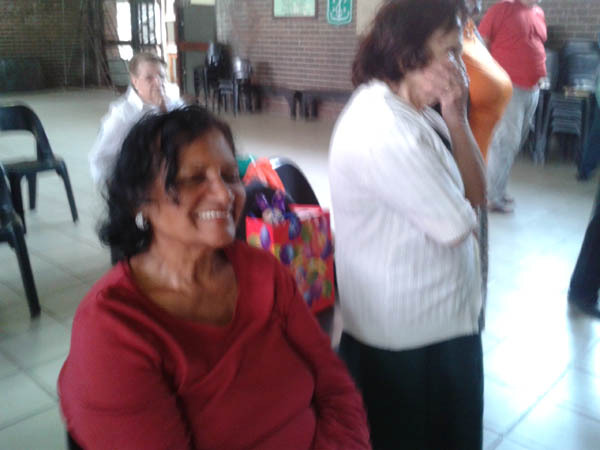 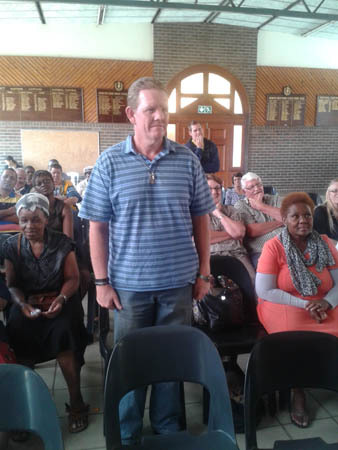 Envisage approaching Mr Moodley the principal for permission to use the school premises on Friday evenings for youth. 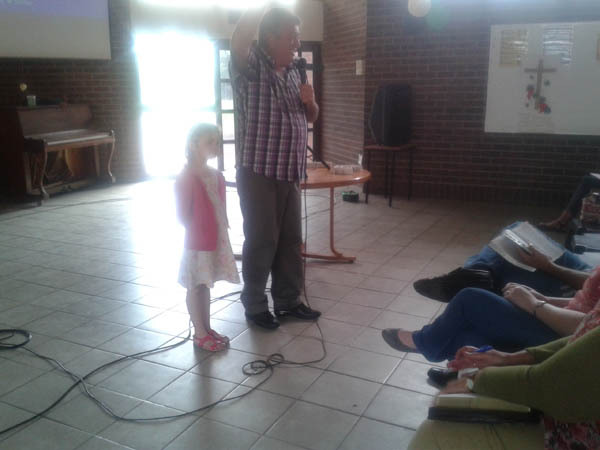 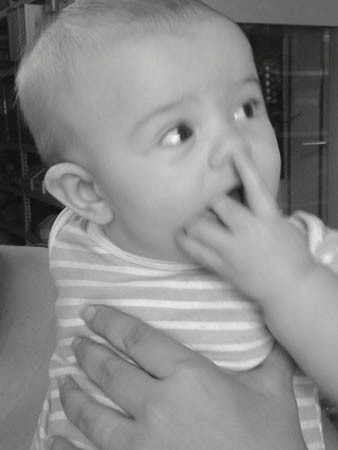 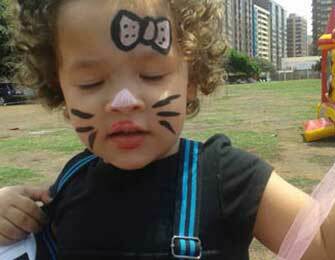 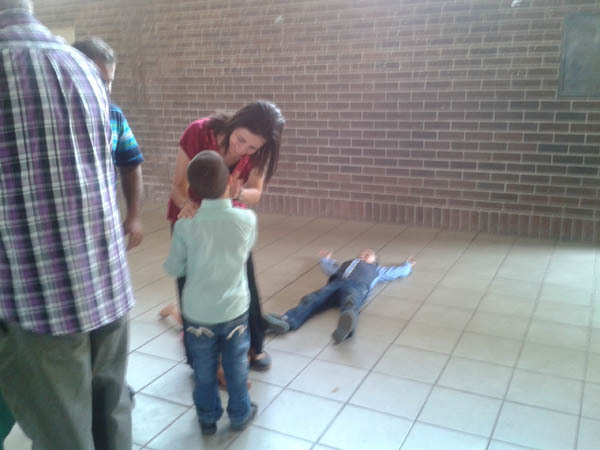 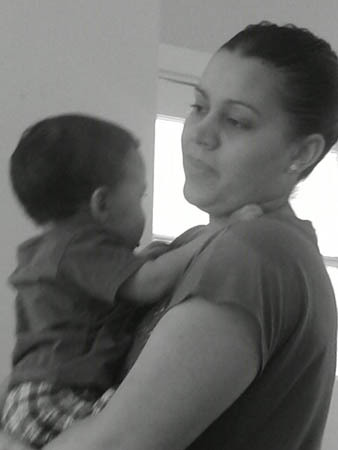 To train up the children from Agape in the ways of the Lord as per the Word of the Lord. 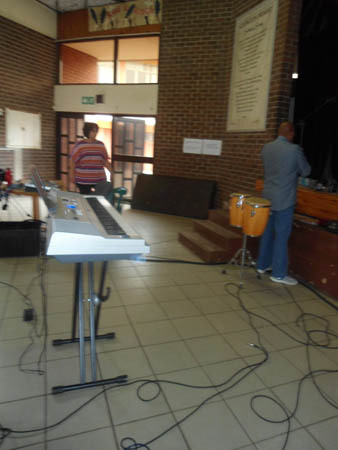 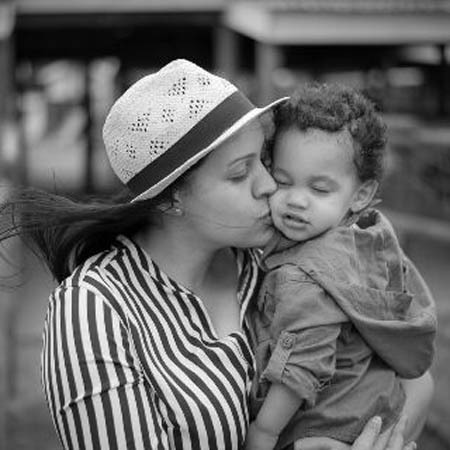 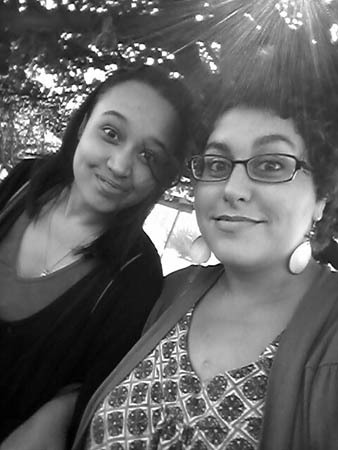 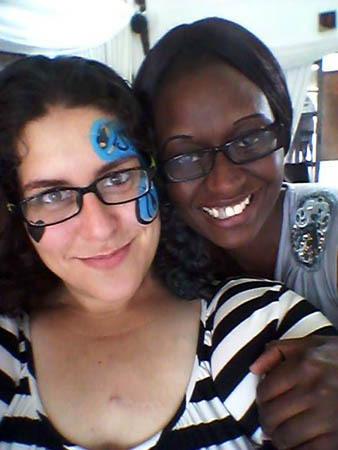 Take a look at what we been up to.